The Colombian capital has always raised a wry smile between my family and I. It all dates back to an afternoon spent at the old viewing area at Heathrow Airport when I was younger, watching a huge jet take off and checking where it was heading to. It was my pronunciation of Bo-GO-ta that amused the parents, and for some reason it became one of those memories that still get mentioned every time the city name comes up (its Bogo-TA, though I still say it wrong almost every time in my head!). But I also remember my parents telling me it was in Colombia, and as a youngster I remember watching that plane take off, wondering about this far away land in South America that it was heading to, seemingly on the far side of the planet. Well quite a few years on, I was landing at that very airport, looking down on the city that had given my family a few smiles over the years. For me, it was my first ever view of South America too. You might be wondering why I chose to make a random trip to Colombia. The truth is, with my passport expiring in June next year – and having a stamp in it from every continent in the world apart from South America (ok, and the poles before the smart ones point it out!) I thought it was as good a reason as any to set foot on the continent and go exploring for the very first time. I’d initially looked at Peru and Ecuador, but with those countries just coming out of winter, and quite mountainous in the areas I wanted to visit, the weather would have been much cooler than back home. Plus I wanted a mix of nice beaches and a city experience. I could see Colombia would fit the criteria, although I had concerns over its reputation. For years it was gripped by drug cartels under the influence of Pablo Escobar. The country was one of the most deadly on Earth with sky high murder rates and regular gun battles related to the control of cocaine. 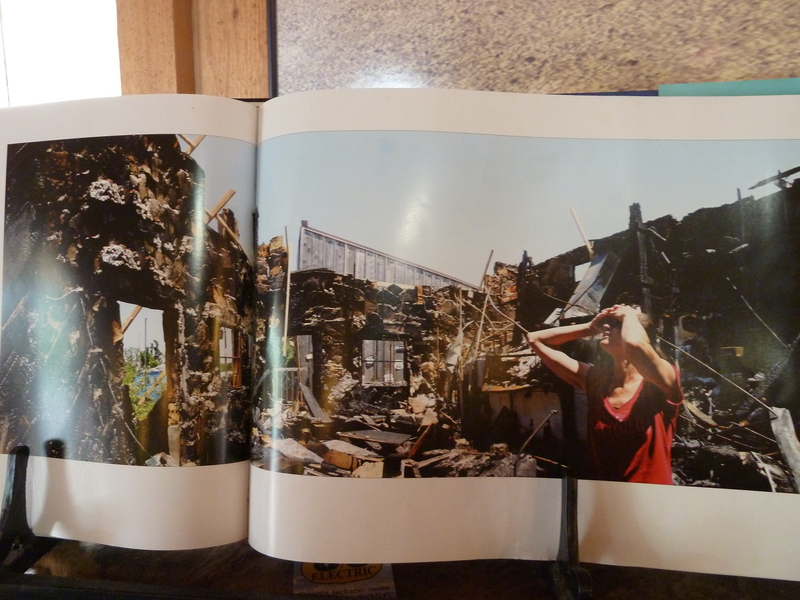 Then there was its own civil problems- particularly its conflict with FARC rebels, the Revolutionary Armed Forces of Colombia. All in all, I admit, I had almost discounted the idea of travelling there – until I had some specialist advice from a travel agent in London, who insisted it was much safer these days. Researching on the internet and the Foreign Office website confirmed that, while you’ve still got to be careful, large swathes of the country are indeed ok to visit. So I planned my own itinerary, which began in Bogota before visiting the pretty colonial town of Cartagena on the northern Caribbean coast, from where I’d get a boat to Panama. A perfect combination of new cities to explore with relaxing beach time. But my first impressions of Bogota were a long way from the picture perfect coastline I was heading for. It didn’t help that I was being driven around by a taxi driver who seemed more intent on completing a giant newspaper word puzzle than actually get me to my hotel in one piece. Every time we stopped, even if it was just slow moving traffic, out it would come. 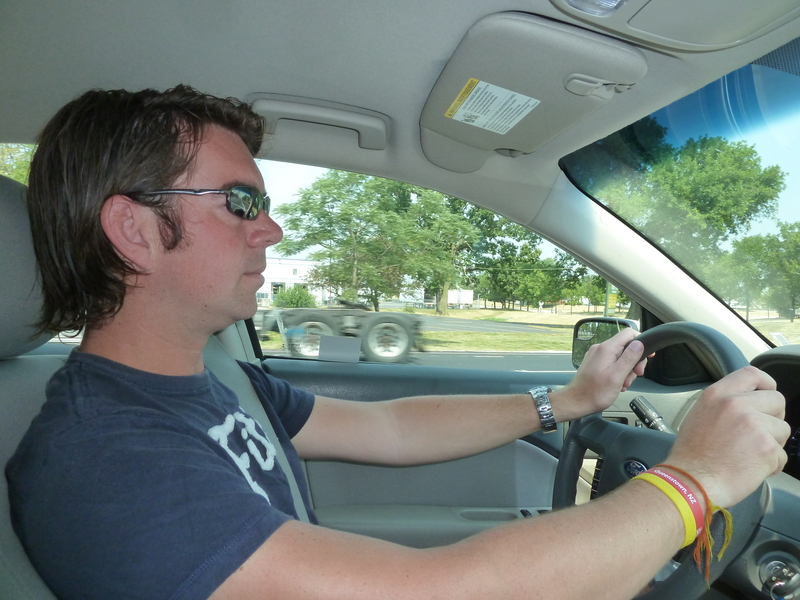 Even while he was driving he was thinking of answers, at one point clearly working out one particular solution in his head and celebrating by momentarily waving his finger in the air while trying to weave through three lanes of traffic. It was all getting a bit worrying. If the puzzle hadn’t been in Spanish, I’d have tried to help him complete it quicker so he could focus on the road a bit more. But 40 minutes after pulling out of the airport, he got me to the hotel safely and I made use of my newly withdrawn Colombian Pesos to pay him. After two days of travelling from Hull, I opted for a bit of comfort at the Bogota Plaza Summit Hotel, in the north of the city, and spent the first night relaxing. With most advice being to avoid going out onto the streets in the city after dark, it was also the safest option. Street crime and muggings are rife in parts of Bogota, especially around the main areas frequented by tourists – with some cases of foreigners being stabbed – so it was definitely the safest place to be, and an early night set me up well for seeing the city the following day. I took another taxi, thankfully minus the newspaper puzzle, to the La Candelaria part of the city, the main colonial old town and birthplace of Bogota. First stop was the main Bolivar square, named after the saviour of the city Simon Bolivar. He and his armies liberated the country by defeating the Spanish occupiers in 1819. He’s widely celebrated, and his statue takes centre stage in the square. Nearby, what sounds like a concert is pounding out a mix of reggae and salsa beats, entertaining a crowd of a few hundred people at an event put on by the local council. I couldn’t quite work out what was happening, but it added to my first impressions that this was a city full of colour, sound and life. 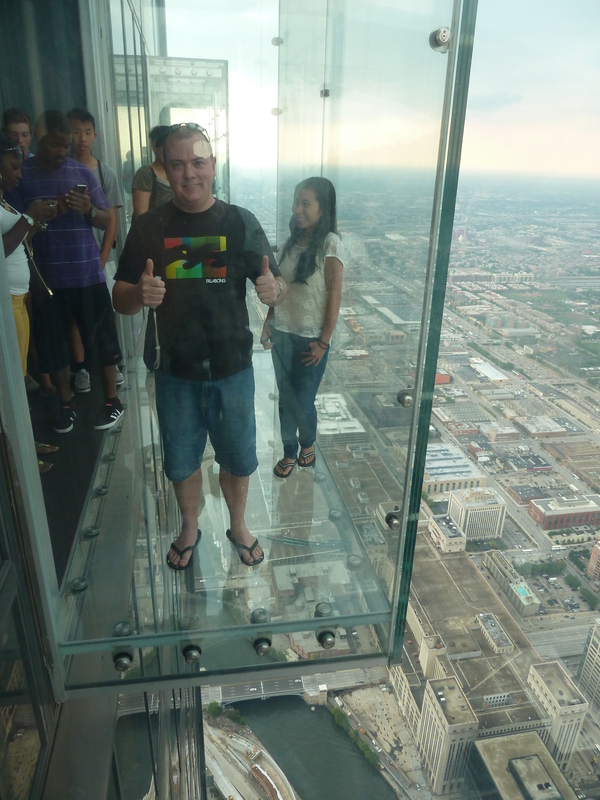 There was, however, certainly a bit of a nervous ‘edge’ about the place. The layout of the old town lends itself to lots of quiet, secluded streets which you can quickly find yourself wandering around – and with few other tourists around, I hardly mingled in. I had taken usual precautions like keeping my camera in my rucksack and not taking my phone out to avoid displaying valuables. I even had a bundle of US and Colombian notes kept separate in an easy to reach pocket incase I encountered one of the thieves which are keeping Bogota’s crime figures so high – the advice from Lonely Planet is to hand them something quick and let them make an escape, rather than make them impatient and then stealing or snatching more from you. Or worse. It’s quite sobering, but then this is still a very poor country despite the fact its on the economic rise. Like anywhere new, I had to keep my wits about me, as I wandered along through street stalls selling everything from corn on the cob to big huge vats of a creamy substance resembling strawberry Angel Delight, frequently being whipped around and stirred from side to side by two colourfully-dressed women near the main square. Strawberry, Chocolate or Butterscotch, anyone?! I stopped to try a Colombian traditional dish ‘chocolate completo’ at Bogota’s most famous snack shop La Puerta Falsa. 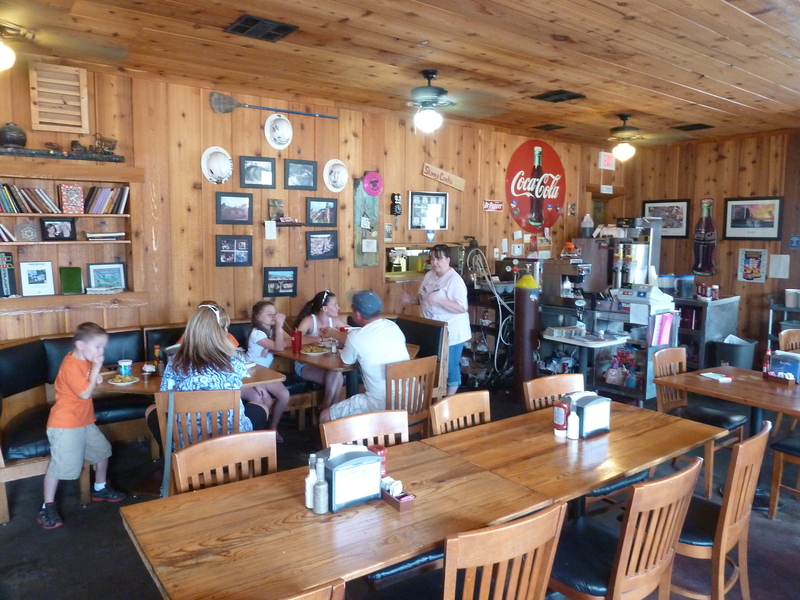 It’s a delightful little café, set over two tiny floors, slightly cramped and rustic but with a great mix of locals and tourists all squashing in together at the wooden benches and tables to sample the home made delights. Mine was effectively a bread bun and some cheese, which you make into a cheese sandwich, some form of dried, floury, slightly hard cake, and a hot chocolate. Though this was a particularly special hot choc – it had to be coming from one of the finest chocolate producing areas in the world – a watery consistency, but with a rich, bitter chocolate taste, rather like plain chocolate. At 6,500 Pesos, it was just £1.50 for a quick pick me up and I was off into the streets again. After all those calories, where better to visit than an art gallery which celebrates everything ‘plump’, shall we say. Colombia’s most famous artist Fernando Botero painted everything, from trees to landscapes, all with one peculiar quality. Everything was chubby. Yep, Museo Botero has some of his finest work, including paintings of chubby pears; chubby people; chubby horses; even a chubby Mona Lisa. Does my famous face look big in this?! I still don’t quite know how or why his fascination with the chubby artform came about, but it was a very peculiar walk through. I’m not a big fan of art galleries at the best of times, but I could admire the quality of the painting and the methods he’s used to make them so colourful and pleasing to the eye. But they did all look a bit odd. Back out on the streets, it was time for another of my favourite past times when I’m visiting new places. 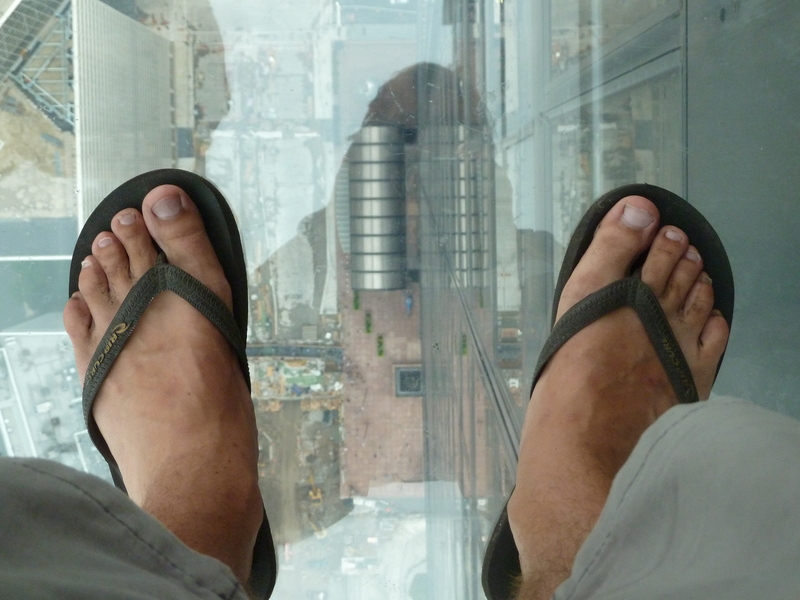 I needed to get high – and not the kind that gets you 10 years in a Colombian prison here. 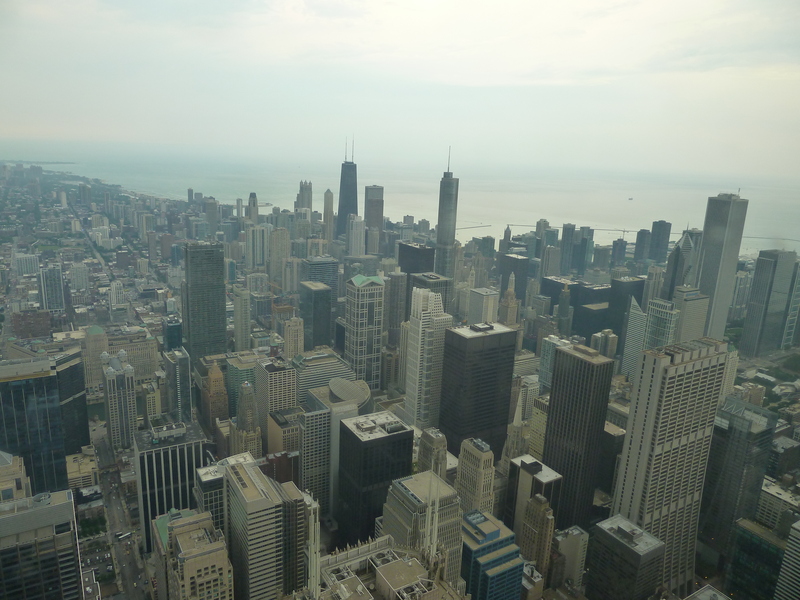 Readers of my musings from my big trip five years ago may remember I have a particular fondness for getting to the tallest or highest point in a city, to enjoy the perspective from above. And Bogota has a trick up its sleeve – it sits in a plain, known as the Bogota savannah, a lofty 2,640 metres above sea level, surrounded by mountains. It’s the third highest capital city in South America, and there’s a chance to get even higher thanks to a neighbouring mountain. Monserrate peak is topped by a very famous church in the city, Cerro de Monserrate, visible from across the capital, and its classed as a ‘must not miss’ by all the research I made into the trip. There are two ways up and down – three including an arduous walk up a pathway notorious for pickpockets and muggers – so I opted for the cable car and funicular railway. But it’s a bit of a mission even to reach those, and I was quickly finding out Bogota is a giant city. The lack of a metro or railway system means taxis are the only quick and reliable (and cheap, it has to be said) way of getting around – though even they come with a genuine tourist health warning of ‘try not to get abducted’. I was in two minds whether to walk it, as once again my guide book told me to advance with caution, particularly near the university area the route to the cable car would take me through. But I was also walking through some areas which were being regenerated, and there was some quite spectacular street art along the way, so I kept going on foot. Eventually, after keeping my head down as I marched up the quite steep foothills, I arrived safely at the cable car office, puffing and panting. It cost about £4 for a return trip to the top of the 3,150m peak – as high as some of the tallest ski resort peaks in France- and for the first time, the true scale of Bogota stretched out for as far as the eye could see. It covers an incredible 1,700 square kilometres, spreading out far more than Greater London – so huge, that it was easy to see half of the city was currently being battered by a torrential thunderstorm. The other half, including the La Candelaria area I had just walked from, was basking in bright sunshine. It really was one of the best cityscape vantage points I’ve been lucky enough to see. What made it different is that, unlike many other cities, Bogota has very few skyscrapers. 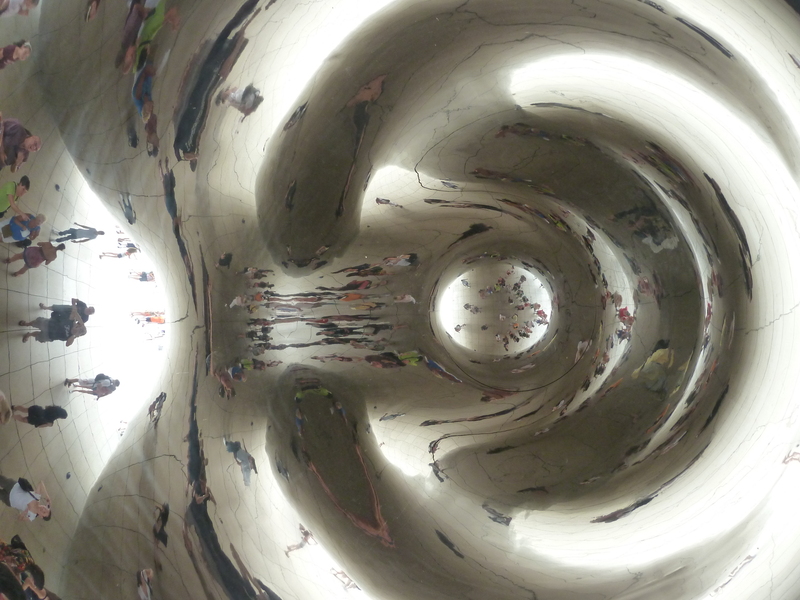 The city appears flat. It’s easy to see the main highways where they wind their way through neighbourhoods. The airport in the distance is a hive of activity. 6.7 million people living their lives between where I’m standing and the horizon. The parks below are full of people enjoying the weekend sunshine, or further away, running away from the impending storm. Thankfully, though only a thin breeze, it was moving gently away from the mountain I was perched on top of. 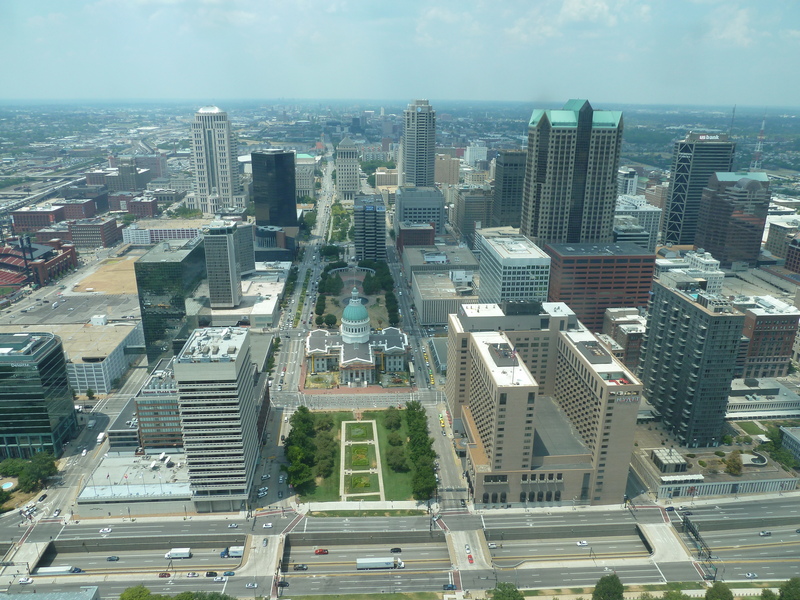 Bolivar square, an alternative angle! As well as the church, there’s a random market and a few restaurants at the top. I stopped for a snack and a much needed drink, took in the views of the mountains as the stretched away from the city, and headed back down in the funicular railway, plunging through a steep tunnel carved out of the rock. After a walk back through to the main La Candelaria area once again, I was thirsty, so went to the BBC – though not a distant outpost belonging to my employer. The main brewery in the Colombian capital turns out to be the Bogota Beer Company, which also happens to like plastering those three famous initials all over everything. Naturally, I found this quite amusing, and took a few photos. Getting a few puzzled looks from the bar staff, I explained that I worked for the BBC back home, and suddenly acquired a few friends! I enjoyed a pint of their Monserrate ruby ale, to celebrate reaching the top of the peak safely and without encountering any of the local criminals, whilst chatting in my finest Spanglish to the bar staff about what I do, and why their beer is so good. I left a short time later with a BBC t-shirt, a bottle opener, a handful of BBC beer mats, and a slightly fuzzy head. Darkness had fallen, and so it was time to retreat back to the safety of my hotel and plan the next step of the journey. Once notorious Medellin, former home to drugs boss Pablo Escobar and responsible for much of Colombia’s turmoil in recent history, or the colourful colonial port of Cartagena. A lot depended on time available. A busy night with a calendar and flight websites was in store. I’ve just watched a sunset on Miami beach, dined in the heart of one of the city’s hotspots, and spent the night with a bunch of cats – and all it cost me to get there was $5 on an airport bus. Yep, five bucks. And I’ll have more on the cats later. Its all down to a great little travel hack that I’ve put to the test – and if you play your cards right, and with a bit of luck, you get to tick off cities in far flung places around the world without paying any extra to stop off. But rather than avoid it like the plague, have a look at the flight times. And then see it as a great opportunity. Admittedly, I had to do some research, mainly to check whether you can actually leave an airport during transit. It turns out you can, and with my flight scheduled to land at 5pm in Miami, and with a few rough calculations, I worked out I had enough time for an evening in the city, maybe even catch the sun before it sets, and tick it off my ‘to visit’ list before an onward flight at 10am the following morning. It all depended on flights being on time of course, to maximise the time in Miami, but it was doable. Miami lends itself to this kind of stop – the airport is incredibly close to the city centre, and some websites even say you can go dip your toes in the sea with a little as five hours between flights. Enough time to catch the airport express bus or a cab, get yourself down to the famous South Beach, have a paddle, maybe even grab an ice cream, and then head back to the airport and rejoin your fellow passengers who are still trying to get comfortable on those awkward seats whilst reluctantly enjoying their fourth game of eye spy in the terminal. I spent about a week agonising over flights – having finally decided I’d visit Colombia, I needed to get to Bogota. Question was, did I fly from Manchester with Virgin, which offered a good price and more local, with an airline that offers a ‘fun’ element, or for the same price, did I fly from ultra local Humberside with KLM, changing at Schipol but without an option to leave the airport and pay Amsterdam a visit. 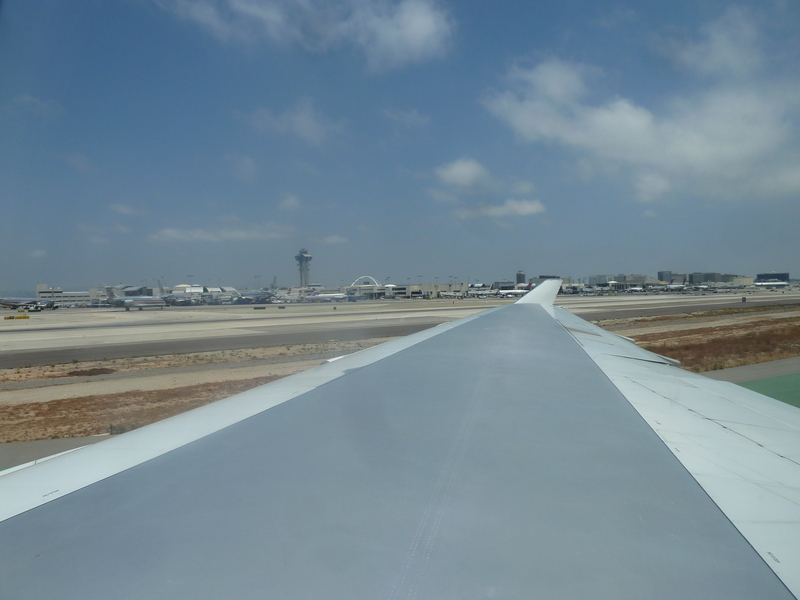 Or did I go from Heathrow, with British Airways and American Airlines changing at various cities in the United States. I’m a fan of BA – they’re our national airline, I’ve got a frequent flyers account with them, and generally it’s a very pleasant experience. The down side for me was that most of the flights at reasonable prices required a journey with American Airlines…and that’s an airline I’ve never really liked after some bad experiences. When you’re stuck in a metal tube for hours on end, you at least want it to be enjoyable, with friendly staff on a modern aircraft. The few occasions I’ve flown American in the past have proved exactly the opposite – old, tired planes, ancient in flight entertainment (you know, those awful projectors showing one film that hark back to the 80s!) and staff who would clearly much rather be throwing daggers at passengers, rather than the tea and coffee. Or both. It was enough to make me avoid the airline like the plague in recent years. But how things can change. 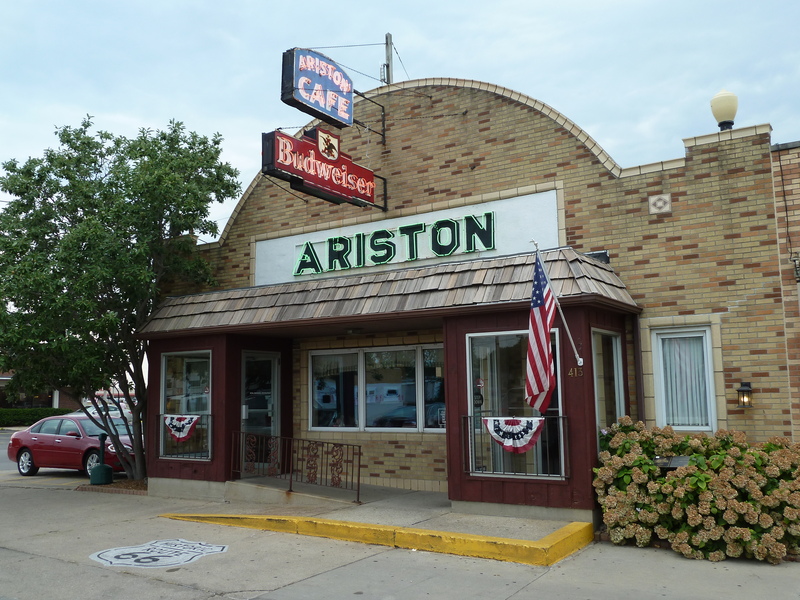 American has undergone something of an identity swap in recent years. Out go those shiny bare metal planes, in come brand new, crisp looking aircraft with the colours of their Star Spangled Banner proudly emblazoned on the tail. Having seen the adverts for the new onboard service, I thought it might be worth a try. Best of all, the cheapest option with the stop in Miami was onboard one of their brand new Boeing 777 aircraft, complete with their new entertainment and seating. Well, I’ve got to admit, they’ve really upped their game. It helped that there were just 80 people in economy for my flight – which one of the stewards told me was highly uncommon, so we all effectively had an entire row of seats to ourselves. Empty plane = cheapskate upgrade! Who needs to pay thousands of pounds for business class when you can line up the drinks, pile up all the pillows you can find, bulk it out with spare blankets and build yourself a bed for the nine hour flight! Even if it was full, however, the new seating was comfortable, the entertainment choice on a large modern seat-back screen was first class, the food was great and the staff were cheerful and friendly. Lovely mood lighting added a comfortable homely feel, and the aircraft was spotlessly clean. There was even wifi onboard so I could track our progress with an app on my phone! Overall, a huge contrast to my experiences with American of old, and definitely putting themselves back on my list of airlines I’d happily fly with. Anyway, aircraft geekery aside, it did a fine job of getting me safely across the Atlantic Ocean and down the eastern seaboard of the United States, landing in a very hot and humid Miami half an hour early, at 4:30pm. The sun was still high in the sky, and so the race was on to clear immigration, find my way to South Beach, and locate another new experience for me. My first overnight accommodation booking through the Airbnb website and app. For those unaware, it’s effectively a website where you can rent a room, or a full property, from a homeowner, and usually at a very good price. It markets itself on giving customers a ‘part of the community’ experience, living the lifestyle of a holiday destination, rather than heading straight to a clinical hotel with lots of other holidaymakers. A home away from home. Knowing that I’d need to be near the beach to have any chance of getting there in time to watch the sunset, I priced up a few hotels beforehand – with most coming in at around £120 for the night. Well, it is one of the most famous beach neighbourhoods in the world, so it comes at a premium. Too much of a premium for me, even if I am getting there for free. That’s where Airbnb came up trumps. I wasn’t too fussed about luxury. I just needed clean, comfortable, and somewhere to lay my jetlagged head for a few hours before the 10am flight to Bogota the next morning. Scanning through a range of rooms for rent, I came across one just a few blocks from the beach, easily accessed, and which looked tasteful and came with the added bonus of good reviews from past customers. I sent ‘Miranda’ the renter a message, and a request to book the room, the day before my flight. We had a couple of messages back and forth, and with that the room was booked – just £50 including all fees for a prime spot in Miami. Result! I did notice there was a caveat on the listing – ‘you must not mind cats’. That’s ok I thought. I love any animals, and had just spent a weekend with friends Matt and Siobhan who have two cats, the lovely Dave and Ruby, so I can handle them. Little did I know that Miami has more than 300,000 stray and wild cats roaming the beach and streets- with some estimates of up to half a million moggies on the loose. And Miranda is one of the people who helps care for them. I jumped onto the airport and South Beach express bus, followed my iPhone instructions for when to get off it, and a few minutes later I was at Miranda’s front door. I called her, and a tall, tattoed, smiling woman appeared, arm outstretched with a welcoming handshake and with a lovely welcome into her home. Miranda had only just returned back to Miami after visiting her native Germany, and was struggling with jetlag. “Are you sure you’re ok with cats,” she asked again. That’s when I noticed a rather large scratching post at the side of her living room, and a number of cats curiously looking at me, as if to ask why I was on their turf. “Just remember to keep your room door closed. Even when you go to the bathroom – I don’t want them getting into the guest room. Its not fair on the guests,” she said. Its nice to know she’s so strict about it, and clearly takes her Airbnb role seriously. She also takes her role with the cats seriously, offering her home as a refuge, helping to rehome them, and feeding colonies of cats in need that live near her apartment. 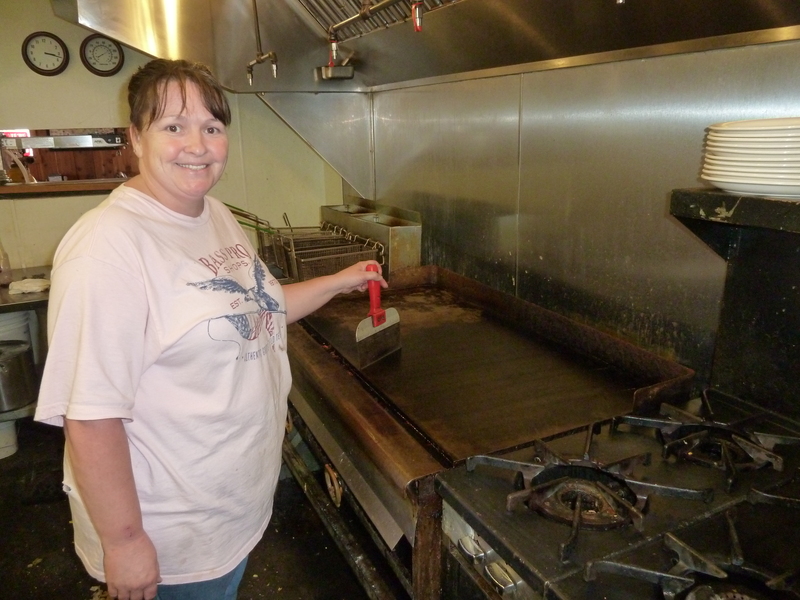 She works with a number of other volunteers, all dedicated to helping the city with its feline frustrations. “Its one of the biggest problems in Miami. It really needs looking into and highlighting,” she tells me, adding that she had fifteen cats in her care at her house at one point. And having left her home for a mad dash to the beach, I can’t help but agree. There are an incredible number of cats roaming around, no doubt all looking for their own Miranda. I made my way down to the beach, arriving just before 7pm to find a huge, almost vertical rainbow towering up into the sky off shore. The sky was black, with waves of rain falling in the distance, a far away storm putting on a colourful spectacle for the beach lovers to watch. The beach is by no means soft – its one of those that feels like crushed up shells between your toes. And it wasn’t overly clean either, with an enormous amount of weed and quite a bit of litter on the waterline. A hurricane had blown through Florida a few days previously however, which no doubt churned up the sea, hence the unsavoury appearance of bottles, rope and bits of plastic which had washed up. I’m hoping they’ve just not got round to clearing it all up just yet. I found a spot on the beach and watched as the sun set behind me, lighting up the stormy sky over the horizon a beautiful orange, which radiated down onto the blue-green sea as it lapped onto the shore. The sound of celebrating volleyball players in the distance was interspersed with the fake electronic clicks of shutters on iphones as selfies and panoramic photographs were being taken of nature’s spectacular side show which was unfolding in front of us. I joined them with the camera. It was all over far too quickly, and I strolled through the warm waters for a few hundred metres towards the Lincoln Mall area, a recommendation from a friend who lives in the city. I ordered a steak, which was sadly very average, but the restaurant offered a good people watching spot which made up for it. It wasn’t long before the extra five hours bolted onto my day thanks to the time difference began to catch up with me. I made my way back to Miranda’s, dodged the cats on the way in and fell into bed, listening to the commotion happening outside the room as two of the rescue cats did their finest Mo Farah impressions in circuits around the lounge. I woke up at 6:15am. Miranda was already awake thanks to her jet lag, and apologised for any noise. She was pouring a huge tub full of cat food biscuits. 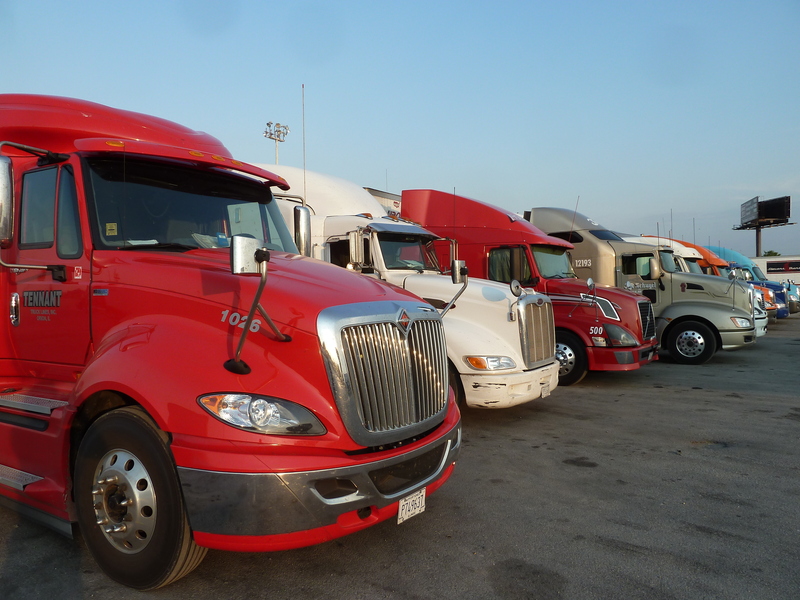 “I head out every morning at 7am. 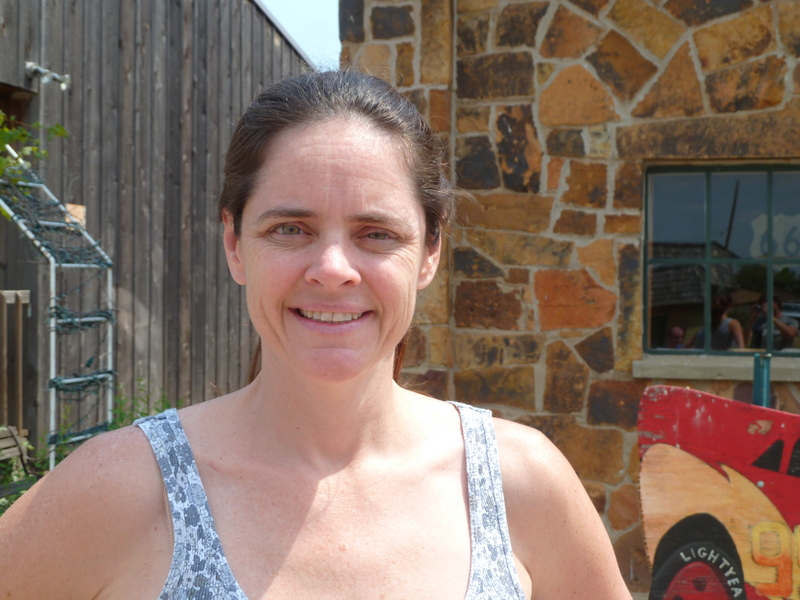 There’s a colony around the corner that needs help,” she said. And with that, we both left her apartment and walked a couple of blocks together, before saying our goodbyes as she headed off to help her furry friends in need. There would be some, I’m sure, who question what the best way forward in dealing with the huge cat issue is. But you can’t fault people who feel so passionately about helping our fellow creatures, and it was admirable to see someone devoting her life to caring for them. For me, it was back to the bus stop and to continue my journey, looking forward to stepping foot in South America for the first ever time. And I was making my way there with a smile on my face too – I had visited a travel agent in London a week before I left to price up how much extra an official overnight stop off in Miami would cost. It turns out it would have set me back the not so small matter of £200 to make it an ‘official’ stop. I think I’ll be looking for more extra long layovers in the future! 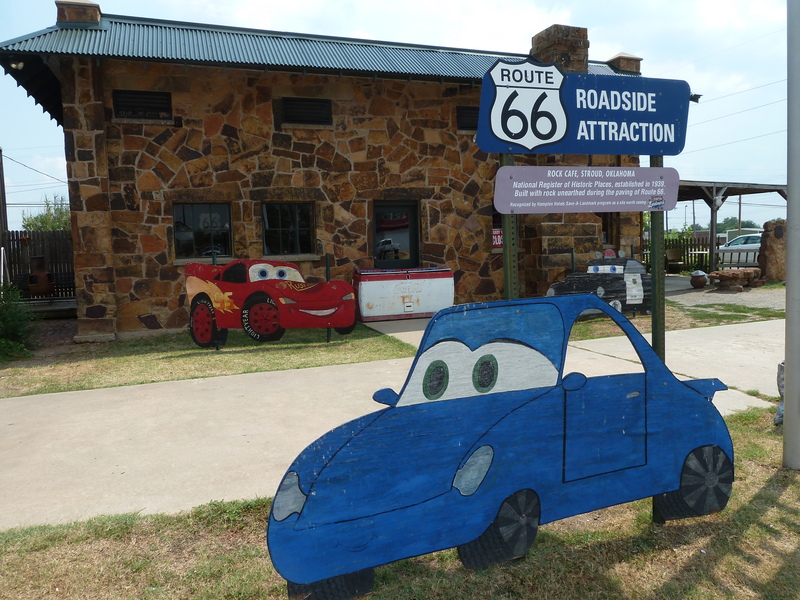 Five hundred miles into the world’s greatest road trip, and already the landscape that surrounds the western end of America’s Route 66 has provided plenty to smile about. From the swaying palm trees of LA, the baron plains of the Nevada desert and the bright lights of Las Vegas, its been an exciting few days – and today gave us perhaps one of the most spectacular natural features on Earth to look at. 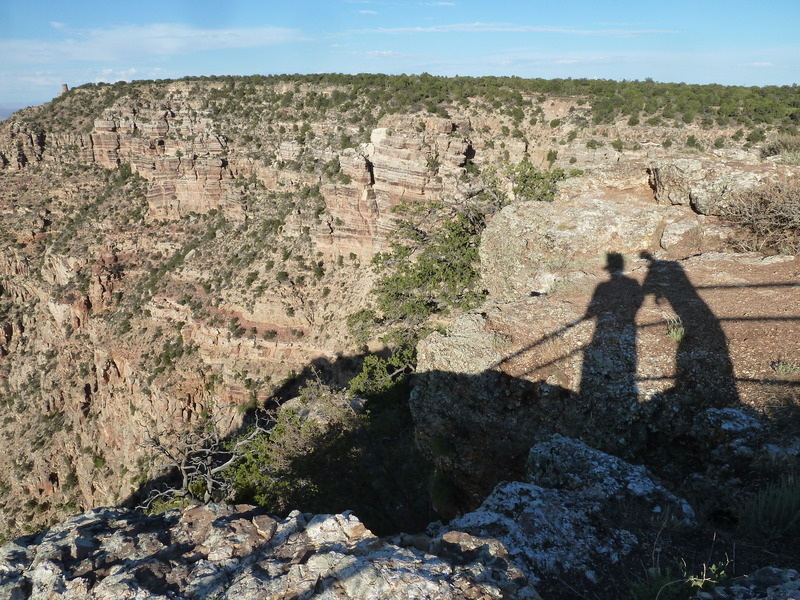 The Grand Canyon was a must-do for us, despite time being against us if we are to reach our goal of the East Coast within six days. Its one of the planet’s most powerful and inspiring landscapes, created completely by Mother Nature, and somewhere I have always wanted to visit. There was no way it was going to be missed off the trip for the sake of the extra five hours it would take to make the detour. 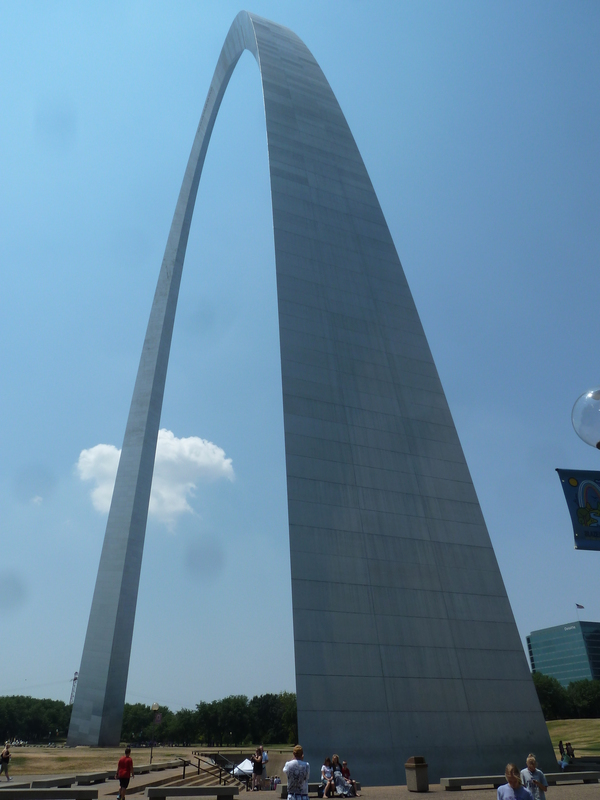 But first there was a wonder of another kind to visit, and this time its one of a manmade variety. 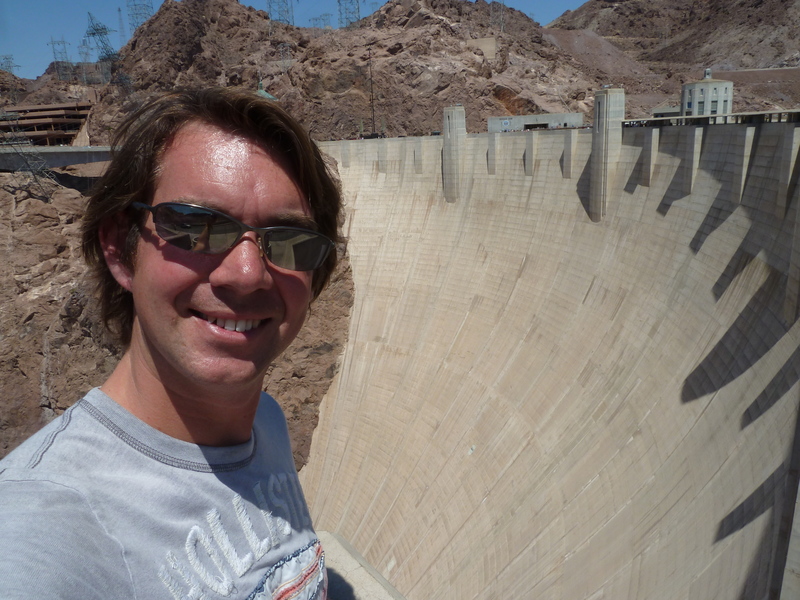 The Hoover Dam is just 30 miles south of Vegas, and is one of the world’s greatest engineering feats. 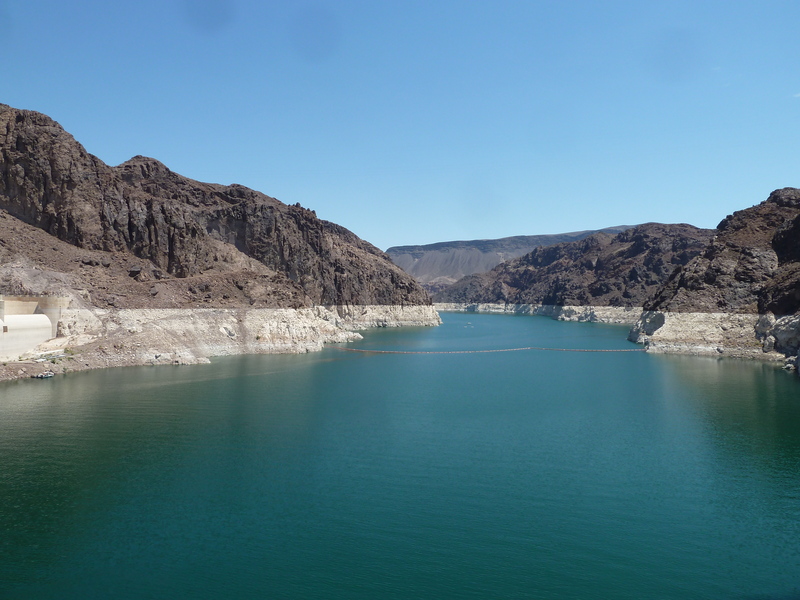 It pauses the Colorado River in its tracks, provides irrigation, helps prevent flooding and enables a huge swathe of the western United States to draw power from the phenomenal power of water. 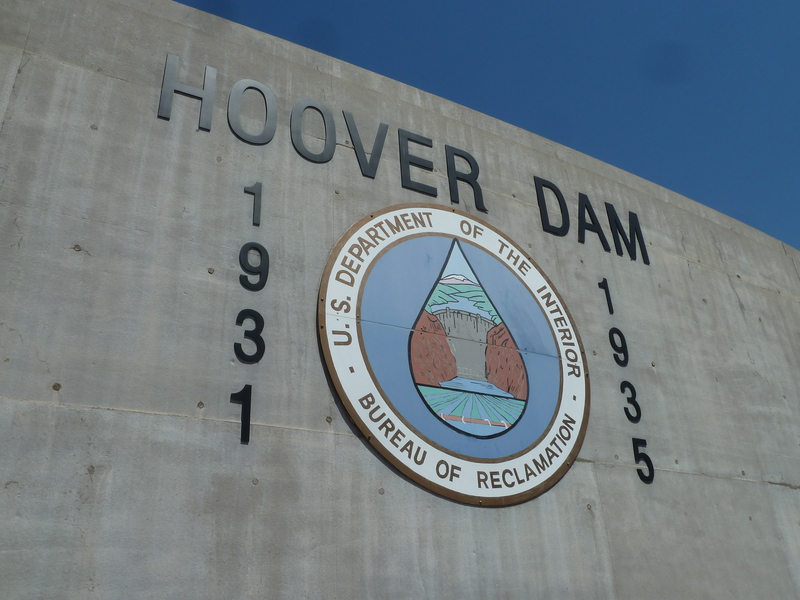 Built between 1931 and 1936, 21,000 workers helped construct the huge dam. 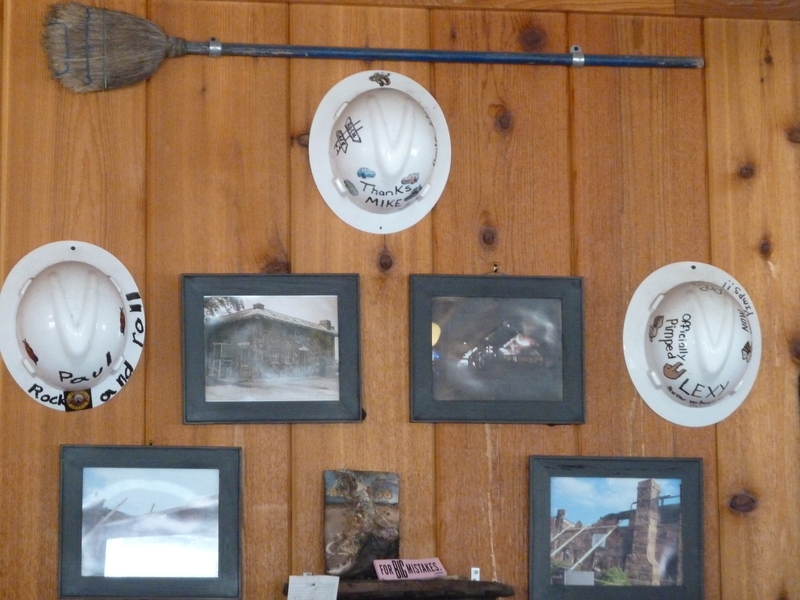 It came at a huge cost, both financially and in human life – more than 100 people died during the building phase. Its sweeping, arched wall rises 726.4 feet from the base, topped off with what was once the main road between Las Vegas and Phoenix. 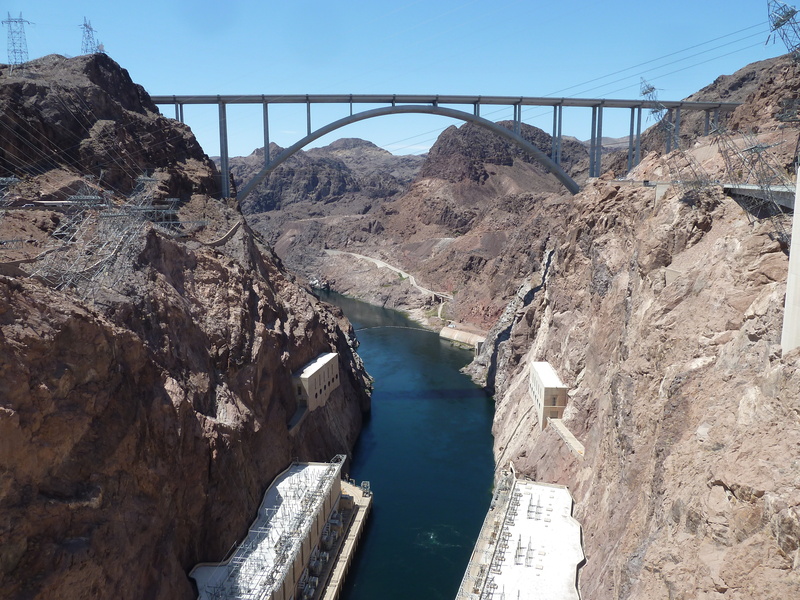 Now, a new bypass goes over a breathtaking bridge which links both sides of the deep canyon. 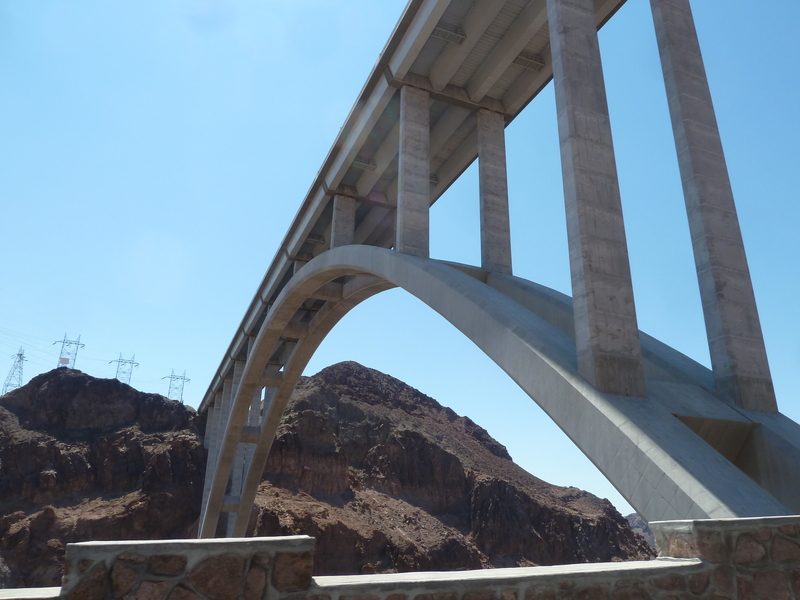 Its known as the Colorado River Bridge, and takes traffic across with both sides blanked off to prevent motorists becoming distracted by the impressive dam that dominates the view from whichever angle you look at it. And as we passed underneath the mammoth bridge to our right, the huge dam came into view on the left. 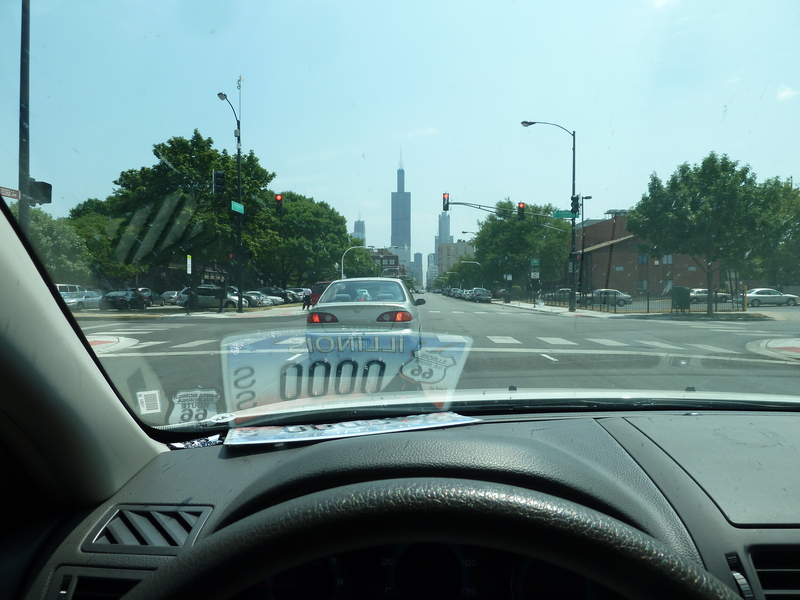 At first it didn’t seem as huge as I remember from looking at photos or watching it take a starring role in the Transformers movie, but then I could only see a tiny part of it from the passenger seat of our Ford Fusion. After parking up the car and stepping into the searing desert heat, we walked down to the road and along the top of the dam. It was surprising how low the wall was which separates the walkway from the sheer drop down the entire side of the structure to the pumping and generator stations at the bottom. 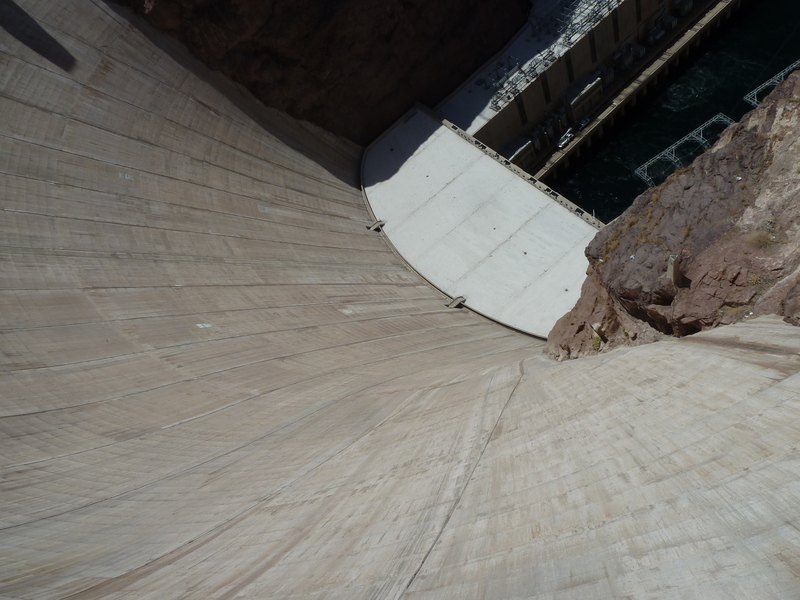 Around them, the water visibly swirls as millions of gallons of H2O makes its way through the pipes and turbines at up to 85mph, generating up to 2,080 megawatts in the process, before reforming into the Colorado River and ultimately making its way towards the coast. There are 17 huge turbines, providing an annual power output of around 4 billion Kilowatt-hours to cities as far away as Los Angeles. 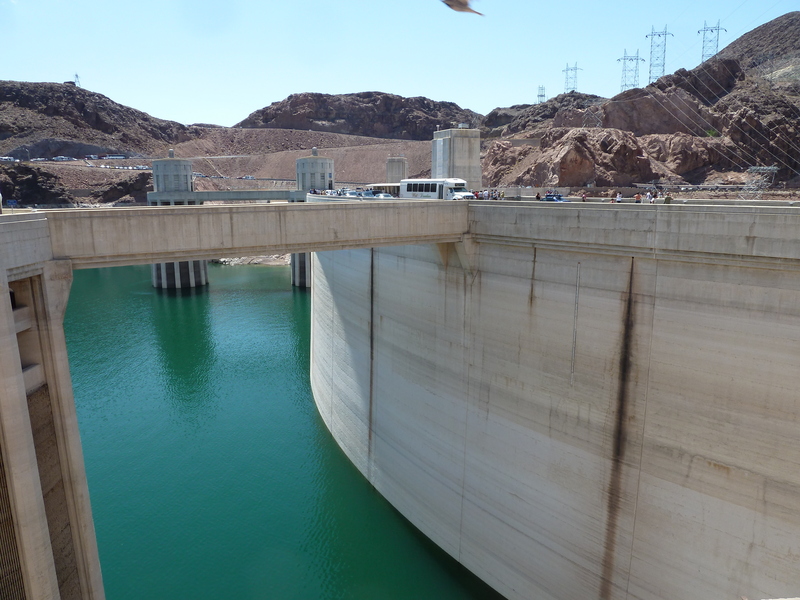 The dam is also where two states meet, with clocks on the main inlet towers showing the local time for both Nevada and the neighbouring Arizona. 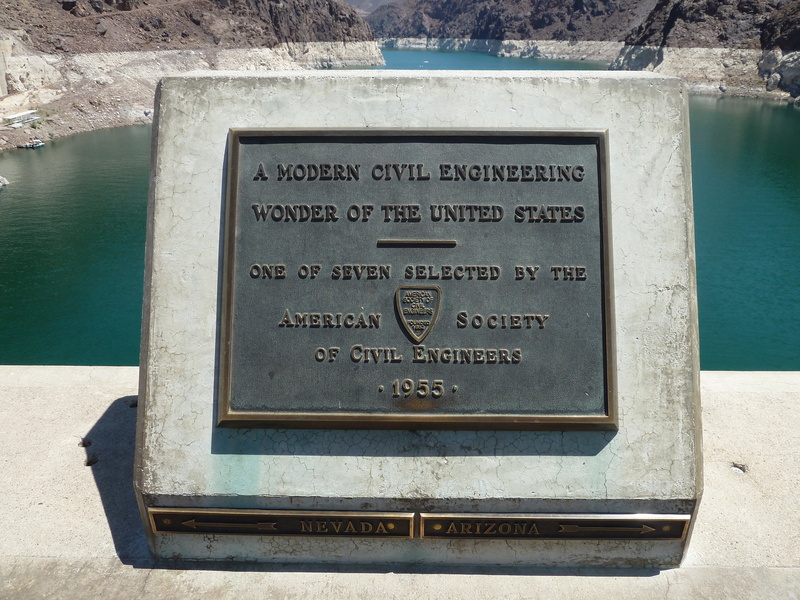 At the centre of the dam, a plaque marking how it is officially classed as a modern wonder of the United States. 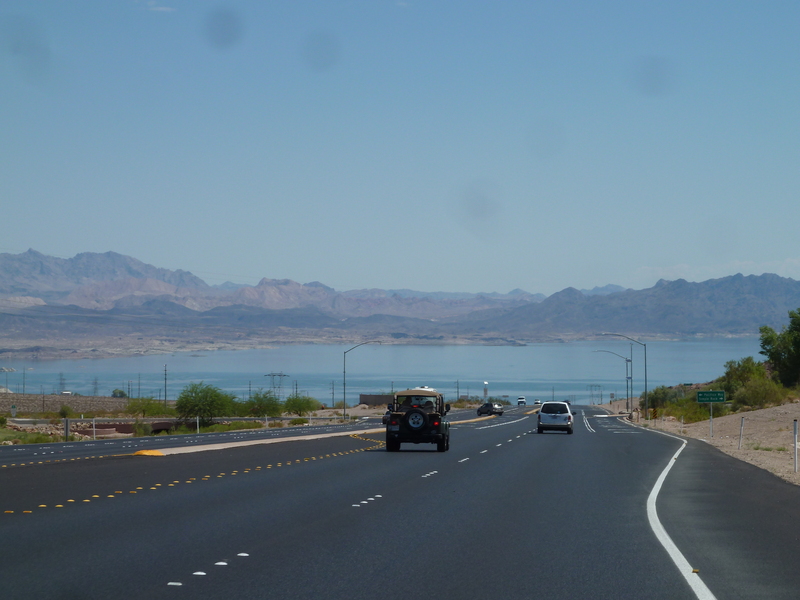 The point offers perhaps the best view of Lake Mead, America’s largest reservoir created as a result of the dam being built. It was clear how the drought in the area had taken hold, with a white deposit on the rock faces, a bit like a bathtub mark left behind by minerals, showing the usual level of the water. 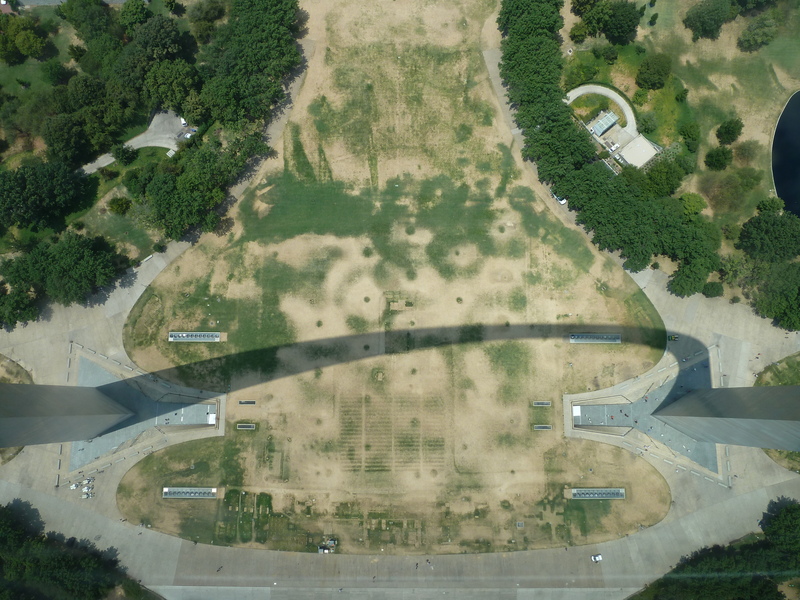 It led me to think about what would happen if there was a sustained period of heavy rainfall, and the water level was to rise above the watermark to the height of the dam. Apparently, an overflow system, known as spillways, have been built into the design, a bit like the little overflow hole you find in sinks to stop you flooding the bathroom. Obviously, its on a slightly bigger scale, with millions of gallons of water being allowed to flow through special channels to bypass the dam. The system has only been used twice apparently, and that’s probably a good thing – the force of water gushing through the world’s biggest overflow pipe apparently wrecks the concrete and rock linings inside, leading to a fairly hefty patch up job afterwards. 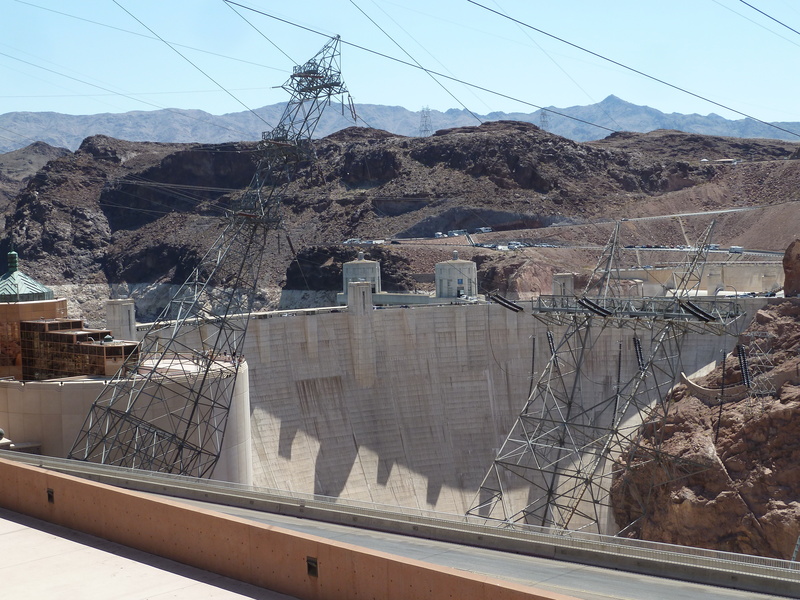 It took five years to build the colossal structure, and when finished, the Hoover Dam stood as the largest electric-power generating site in the world, as well as the largest structure made out of concrete. Its an amazing thought when looking from above that what we were standing on contained enough concrete to build a road from San Francisco to New York, a fairly hefty six and a half million tonnes of the stuff. After an hour of wandering around the top of the dam, marvelling at the work that had clearly gone on many years ago to design and build it within the rock formations around it, it was time to move on. We left the car park and drove along the road across the top of the structure, thinking it would lead us out and away, only to come to a dead end. “Oh well, I can say I drove across it as well as walked it,” joked Ian, looking for a place to turn around. 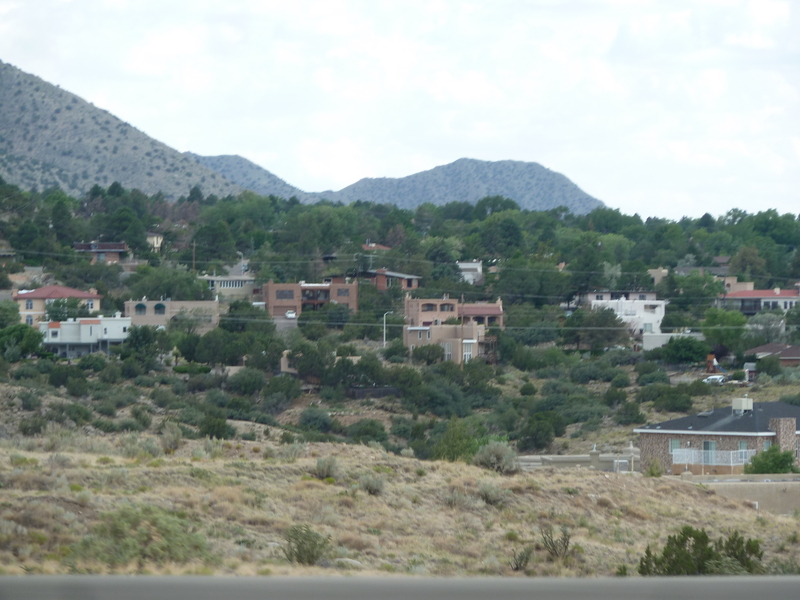 We’d momentarily crossed into Arizona, but were soon saying hello to Nevada again as we searched for the road to take us across the new bridge and on towards the Grand Canyon. To make up a bit of time, we cheated a little. 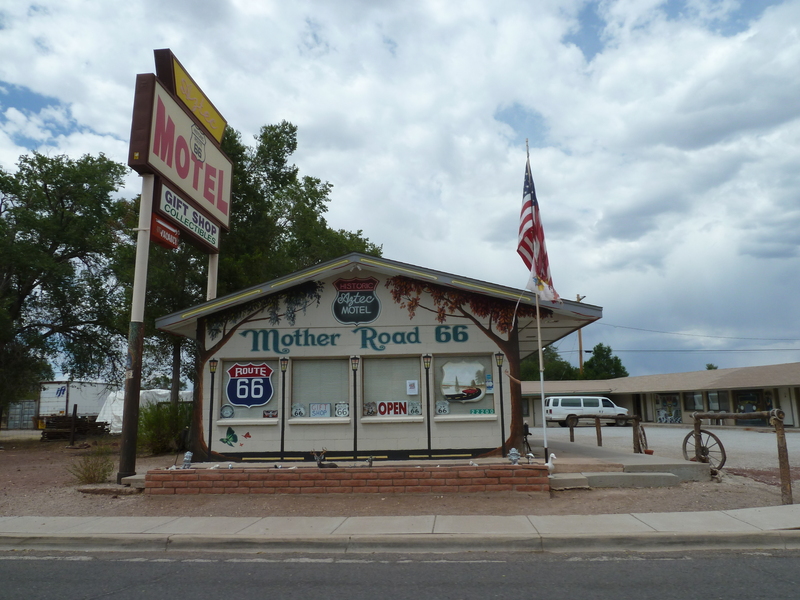 Of course, the old Route 66 isn’t recognised anymore, with the road being declassified, but the giant Interstate system which took over does closely follow the old route. 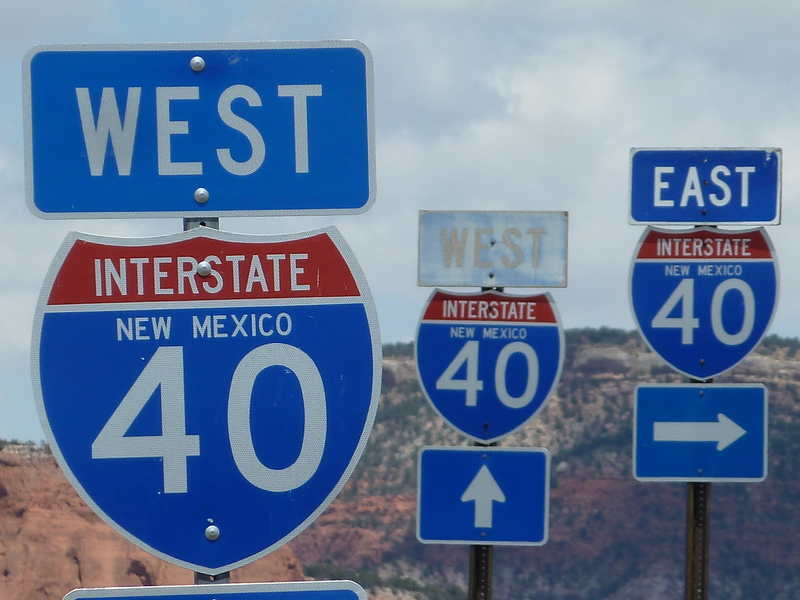 Infact, parts of it were built over the old 66, and for the hundreds of miles in the West until we reach Oklahoma, the Interstate 40 follows the old roadway, frequently crossing or going under the motorway of yesteryear. 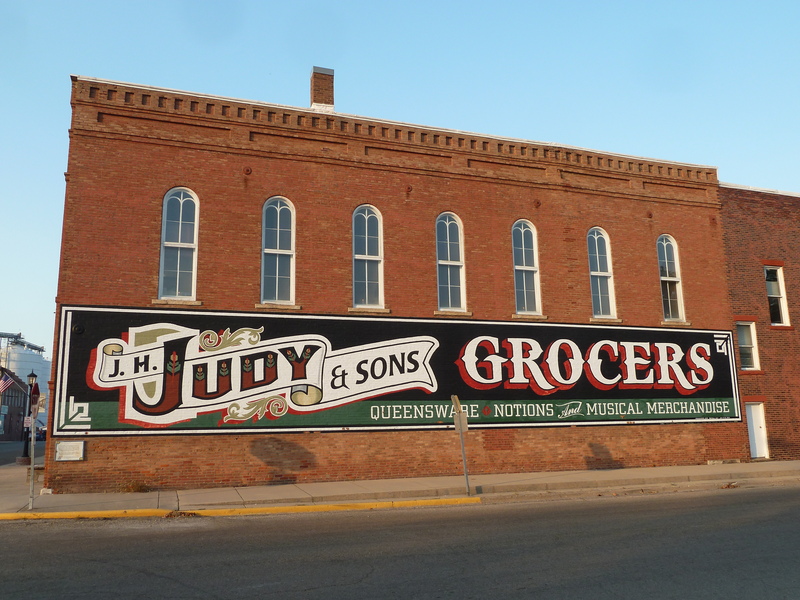 It means we can make up time by nipping on and off the Interstate to visit places of interest along the way, such as the countless small towns and villages that came into existence purely because of the through trade given to them by the 66. 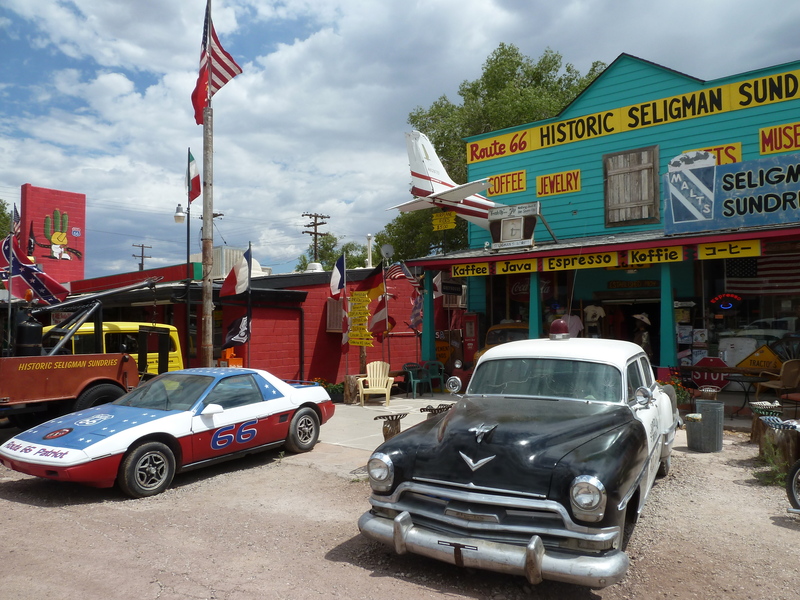 One of them was the town of Seligman, halfway between Vegas and the Grand Canyon, and so a great little place for us to break our journey, stretch our legs and take in a bit of nostalgia. 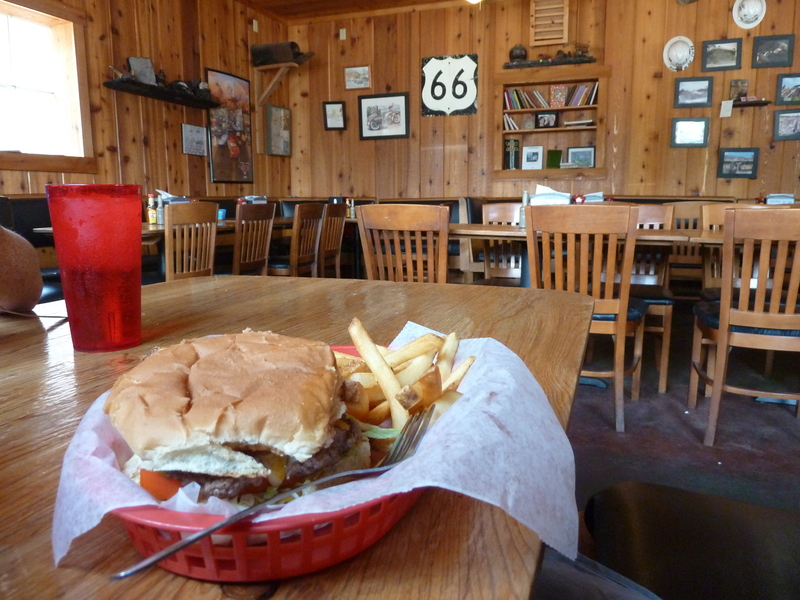 It has the feel of a town whose heyday was a long time ago, yet is still dining out on its Route 66 past. There is an abnormally high number of shops and stores, still plying for the trade afforded to them by people like Ian and I, who have stopped off to have a look at what the R66 towns used to be like. 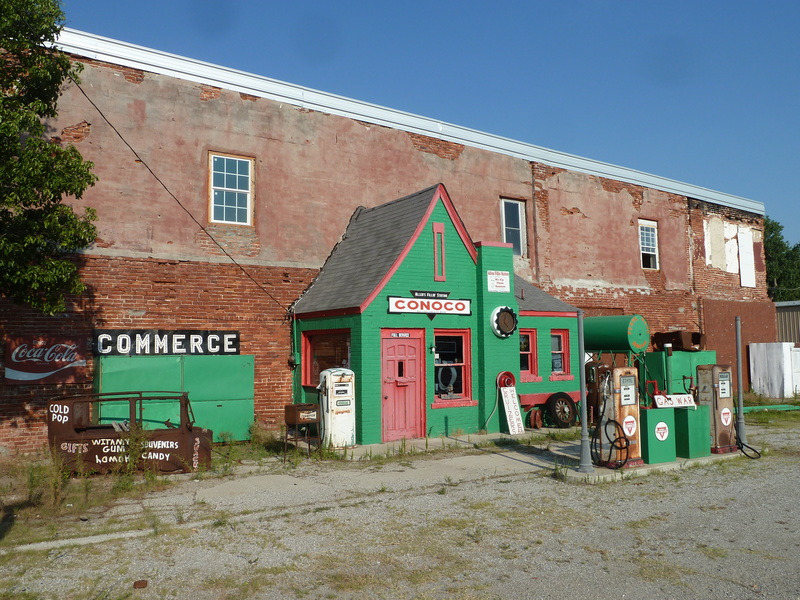 Its as if many of the store owners set out to have theirs as the quirkiest, most photographed outlet in the town, with anything from wacky signs to half an aircraft fastened to the wooden cladding and beams. 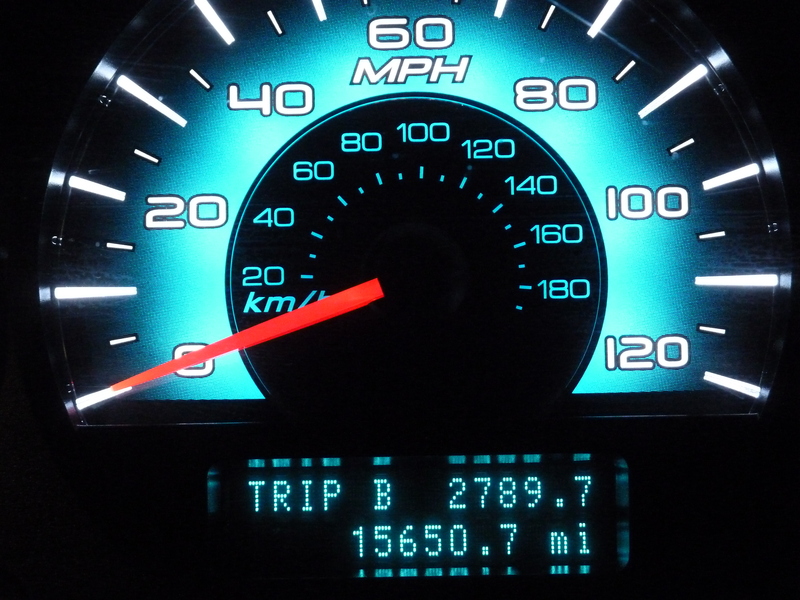 On one building, a mileage chart showing how there was still 1,737 miles to go before we reach Chicago in a few days time. 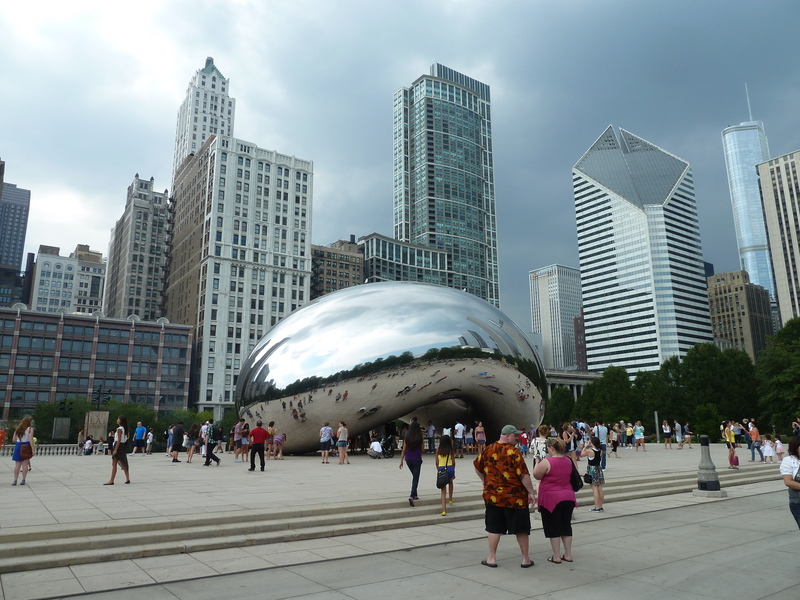 Right now, in the intense heat and dust of the Arizona desert, the Windy City seems a long way off. We stopped for a couple of drinks and snacks at one of the shops, opting to give them some of the trade they seem to so desperately need, as opposed to the countless multinational petrol stations dotted along the Interstates. 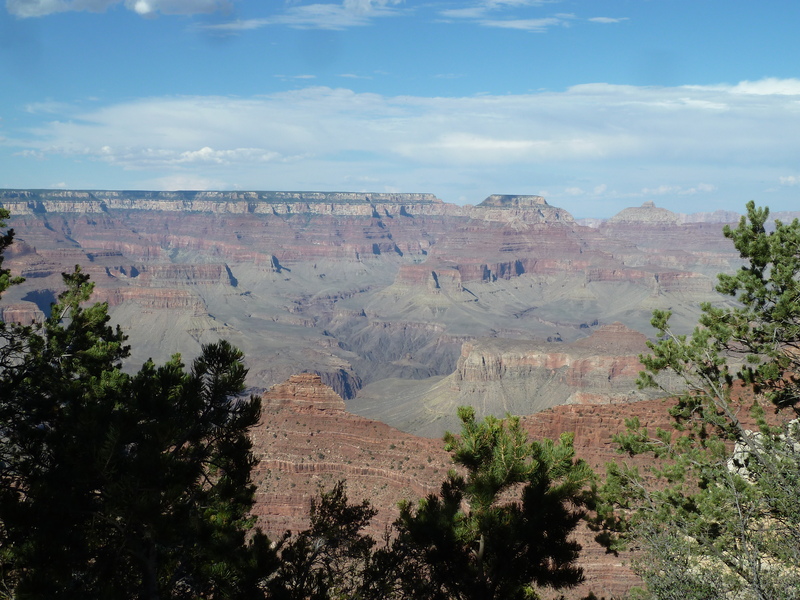 It was another two hours of driving along endless straight roads through deserts and very flat scrubland before we reached the south rim of the Grand Canyon National Park, pulling up at a window with a very cheery park ranger and handing over the $25 admission fee. The road carried on to a car park, full of campervans and other motorists from across the States and as far afield as Argentina. 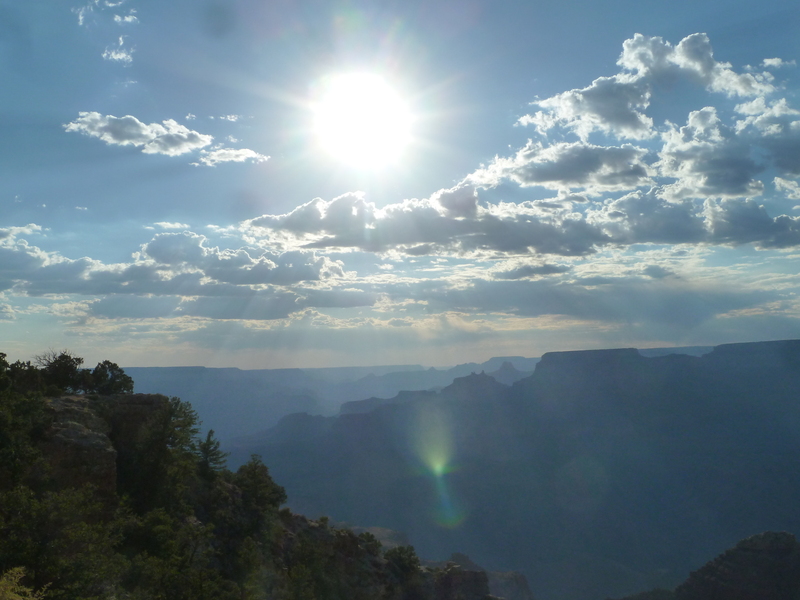 We followed signs to Mather Point, which apparently gave a view of the canyon. I say apparently, because up to now there has been no sign at all that we were anywhere but a flat part of the Arizona countryside. With mountains, you get to see the land changing, gradually getting more and more mountainous. 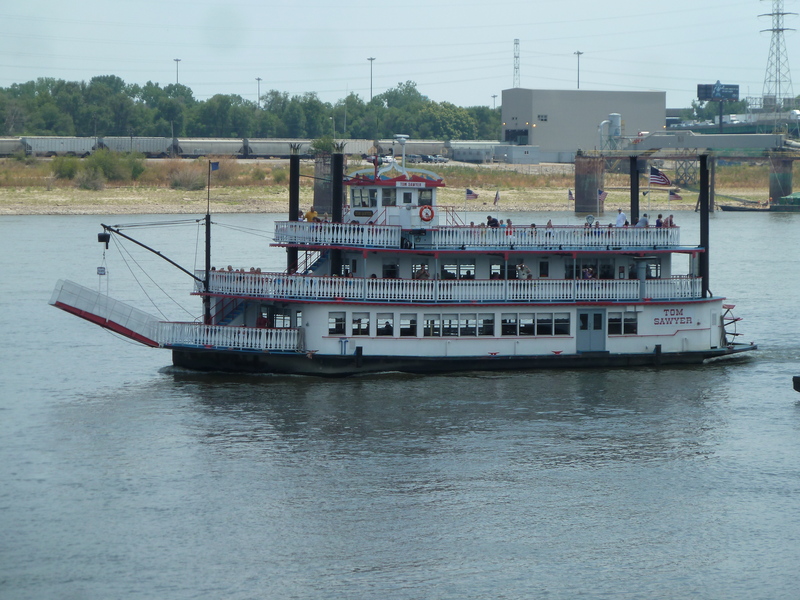 When you approach a major river, more often than not you’ll get a glimpse of it somewhere as you get nearby. A volcano usually has a conical appearance that you can see miles away – you get the picture. Here, there was nothing. Nothing, that is, until you reach a railing and some trees. That’s where the ground, terra firma, the rock I am standing on, just falls down to a mile below me. A huge expanse of the Earth’s crust appears to be missing, instead creating a strange, sub-ground level mountain range. As holes in the ground go, this one is certainly something to behold. I was in awe. Most people I had spoken to who have visited this huge crack in the ground had all told me the same, that is something hard to understand. It was certainly the case. My head was struggling to work out exactly what was going on in front of me. It was telling me I was at the top of some sort of mountain, looking out over a range below me, yet I had not climbed any mountains nor noticeably gained any altitude. 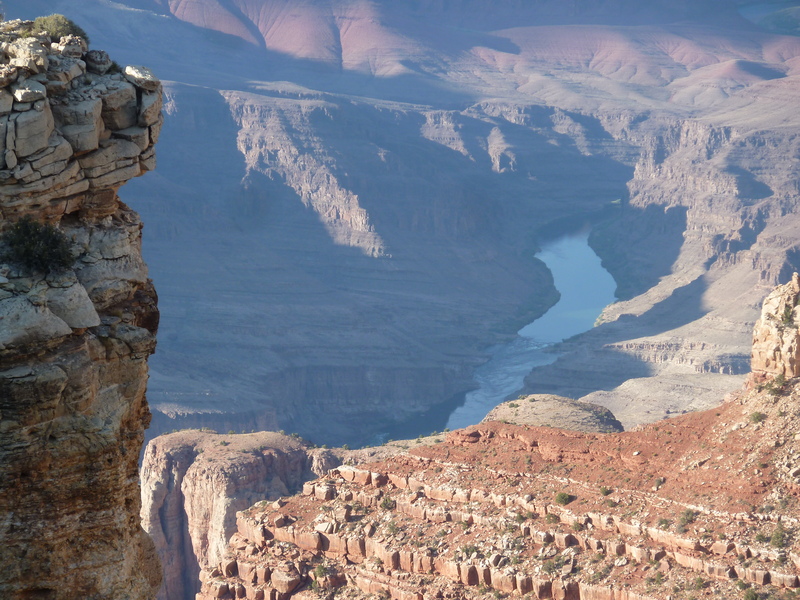 Instead, far, far below and in the distance, the sun was glinting off the surface of a river, the Colorado River, and the creator of this incredible natural wonder. 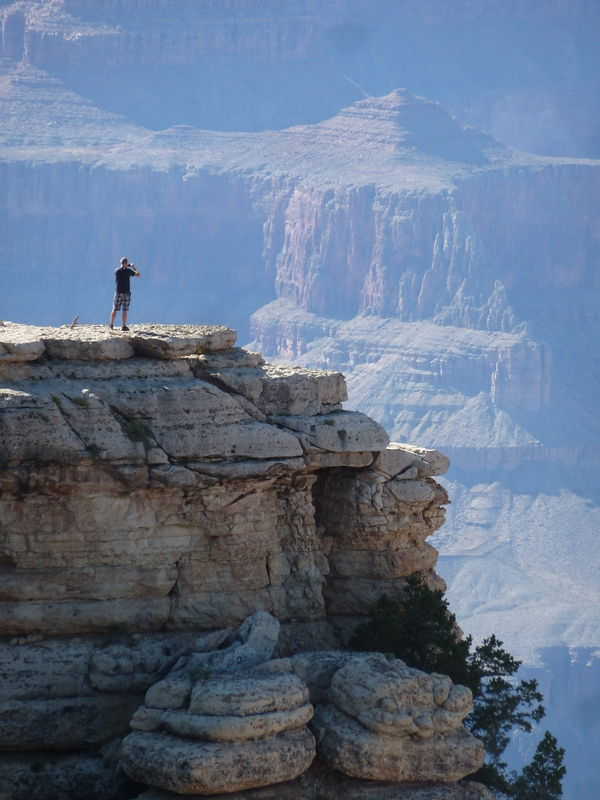 It’s the mind blowing scale of the Grand Canyon that has the effect on anyone who visits. Walking to a pinnacle that juts out just enough to enable you to look straight down into the bowels of the earth, I looked out ahead of me. 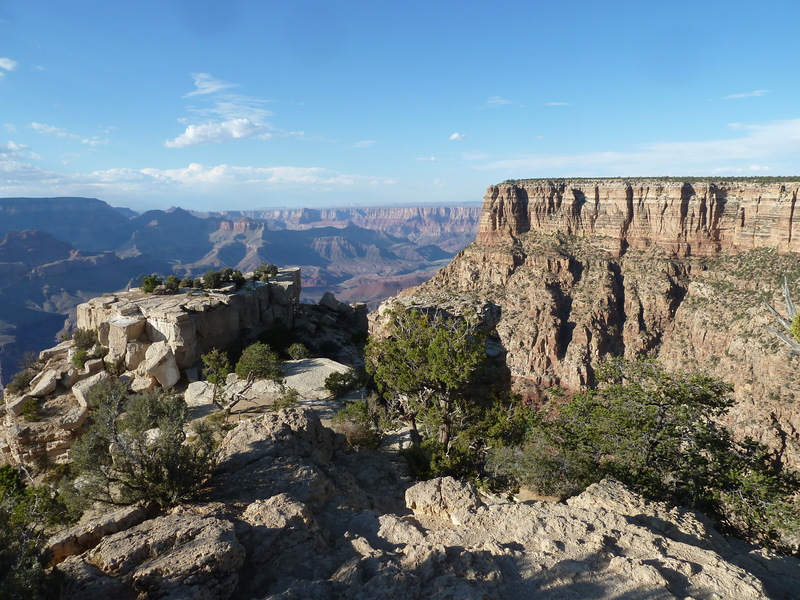 Across the other side of the canyon, the north rim, some 10 miles away as the crow flies, but what would require a drive of more than 200 miles to reach by road. I couldn’t stop looking out, trying to comprehend the scale of what sprawled out in front of me. It was one of those moments when, as a mere human being and as a guest on the planet, you can feel very, very small and insignificant. A bit like when you try to get your head around how many stars and potential for other planets there are in the Universe, this was something that can almost mess with your mind. Thankfully, there was plenty of information on hand to explain how a giant crack can seemingly appear in the surface of the earth the way it has. In a nutshell, its all down to the way the plates that form the Earth moved together, creating the layers of different rock, which were then cut away by the eroding force of the river over millions of years. 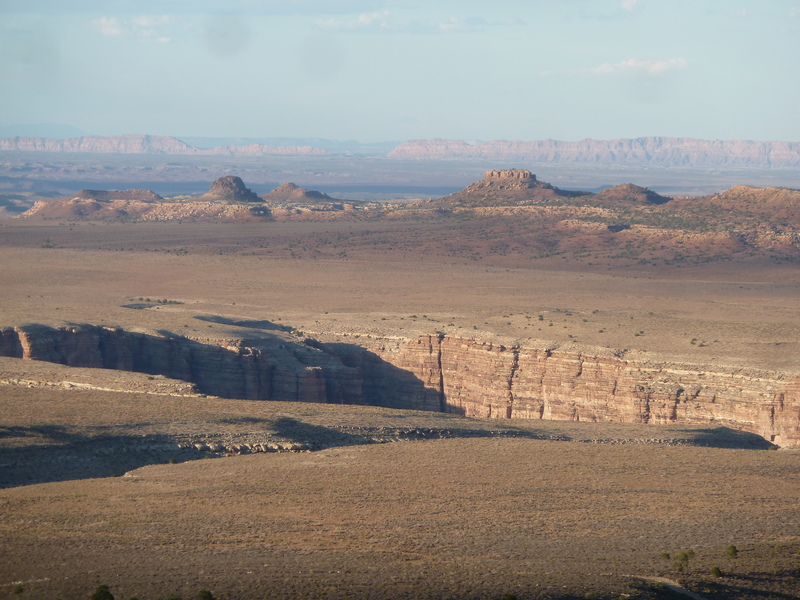 But the information can just baffle your mind even more, like the fact that the rock you can see in the lower layers can be up to 1,840 million years old. Hard to get your head around the time involved. 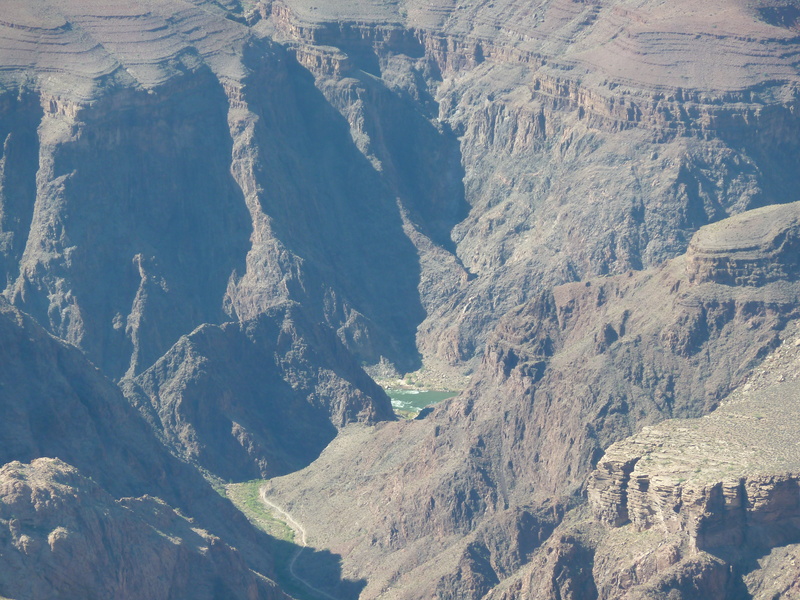 Driving further along the south rim afforded us more spectacular views of the Grand Canyon, and as we progressed a few miles east, the valley widened slightly to give more expansive views of the river which over the millions of years before has cut its way through the rock. 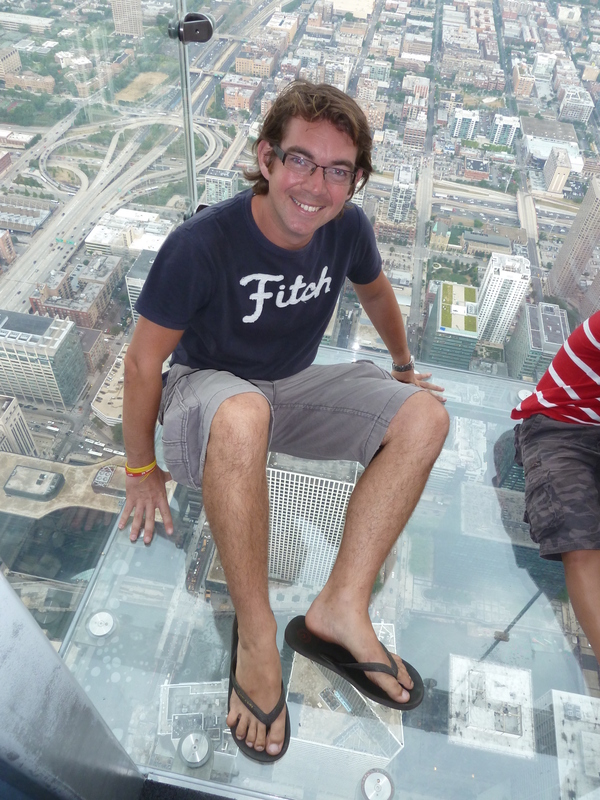 A bit close to the edge! With the sun beginning to get lower in the sky, we knew time was getting on and we still had the most substantial part of the drive ahead of us. We thought we’d be on our way by the mid afternoon, but as we’re finding along the way, sometimes the journey can take a lot longer than planned. 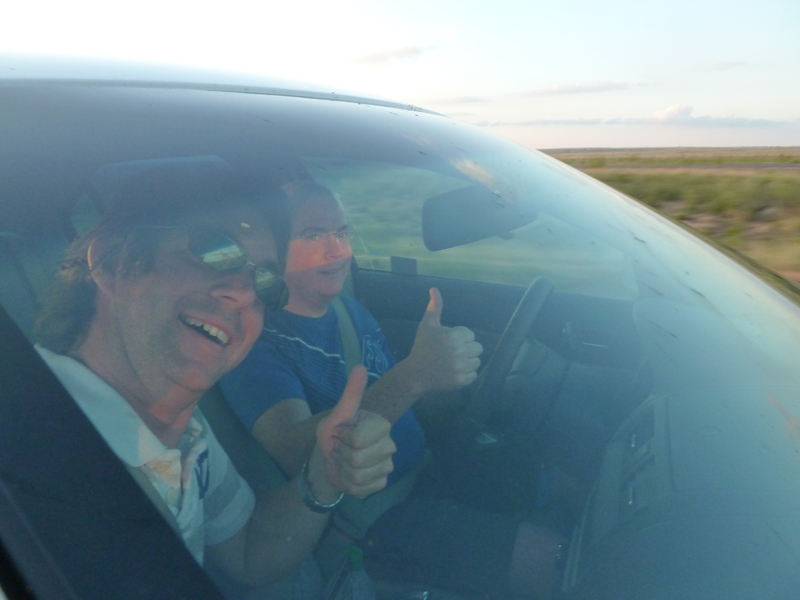 There was a growing concern we might struggle to make it across to the east coast in the timeframe we’d set, and so we knew we had some long stretches of driving ahead to make up time. 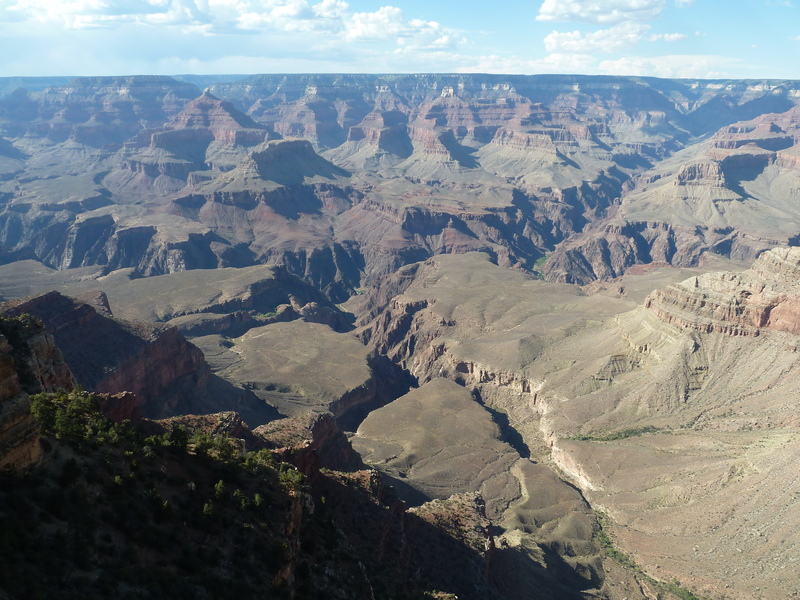 But we said farewell to the Grand Canyon and watched through the window as the Arizona landscape showed us the start of the fantastic feature, with the canyon stretching out like veins across the surface. Memorable. 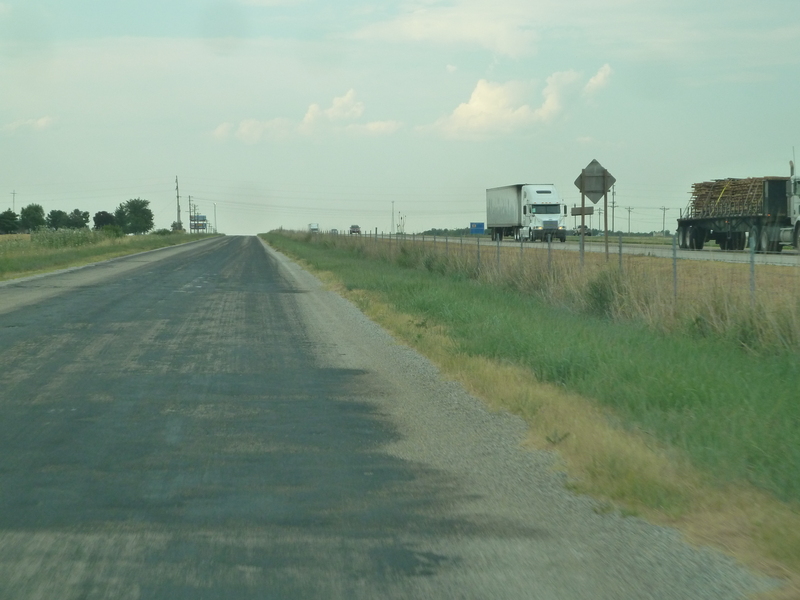 We set off towards the Interstate, aiming to reach a point of interest marked on our map as ‘Meteor Crater’. Now, its not everyday you get to see a meteor crater, and with two blokes on a road trip, of course we had to go and see it. 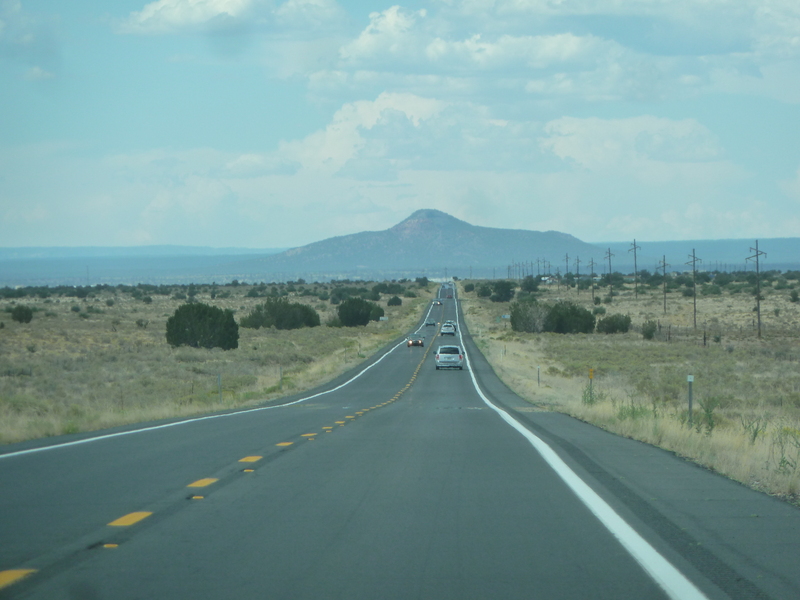 We were determined to get to see it before darkness fell completely, but by the time we reached Flagstaff, still some 40 miles away from said crater, the sun was rapidly disappearing over the horizon. But still we pressed on, arriving at the turn off with just about enough light to see over the surrounding fields. Unfortunately, it was also a quiet country road at about the right time of the evening for the local rabbits to be out and about looking for dinner. Sadly, one of them, a young looking little thing, went looking for food far too close to the front of my oncoming car. I could see there was a brief moment of confusion from the animal, a fleeting thought of ‘left or right’ before making the fatal mistake of trying to run back to where it had come from. Bad move. With a thud, it disappeared underneath me. I immediately put my head in my hands on the steering wheel, trying to see in my wing mirror if by some miracle the rabbit had made it out of the back without being squashed by a wheel. I couldn’t see. I felt awful. I know that from time to time, these things happen – after all, I never set out to be a rabbit killer. But I love animals, and its always hard knowing something has just met its end thanks to me. Unless it’s a wasp or a mosquito, because they don’t count. We continued following the signs to the meteor crater, with Ian telling me not to worry about the rabbit. By now, its getting properly dark, and arriving at the gates to the crater, the place had closed an hour earlier anyway. 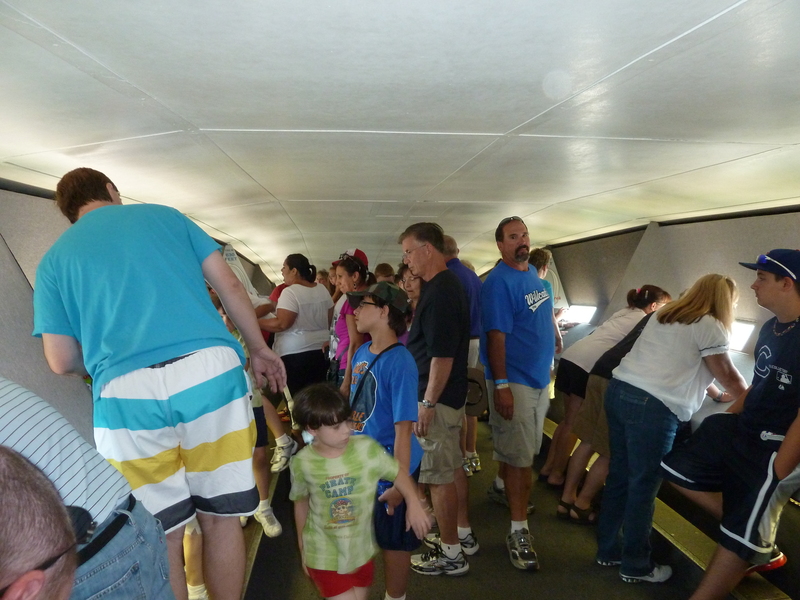 We did, however, get to see the outline of the mound of earth created by the impact. Whether the view was worth the life of a poor baby rabbit was debateable. We turned around and headed back to the Interstate. “Now just go careful, we don’t want any more casualties,” Ian joked as we set off back in the opposite direction along the single lane road, knowing we’d probably have to pass a horrible mess in the road that I had created. “Knowing my luck, I’ll wipe out mum as she’s out investigating where her little Johnny has got himself to,” I joked. It was a joke I was I hadn’t made. Approaching around the same point that I had wiped out baby bunny, suddenly a large grey figure jumped out of the bushes to the right of the road, about five metres in front of me. There was no time to react. “Woah, there goes another one,” laughed Laingy in his brilliant Aussie accent. I have to admit, I laughed with him, mainly out of surprise at the chances of such a coincidence happening. I felt, and still feel, dreadful about what happened, but there was genuinely nothing I could have done. And now, according to Laingy, I’m a rabbit serial killer. We stopped at a Dennys a few miles down the road, mainly to eat but to also inspect the car for any damage. Thankfully there wasn’t any, and we tucked into a huge meal. 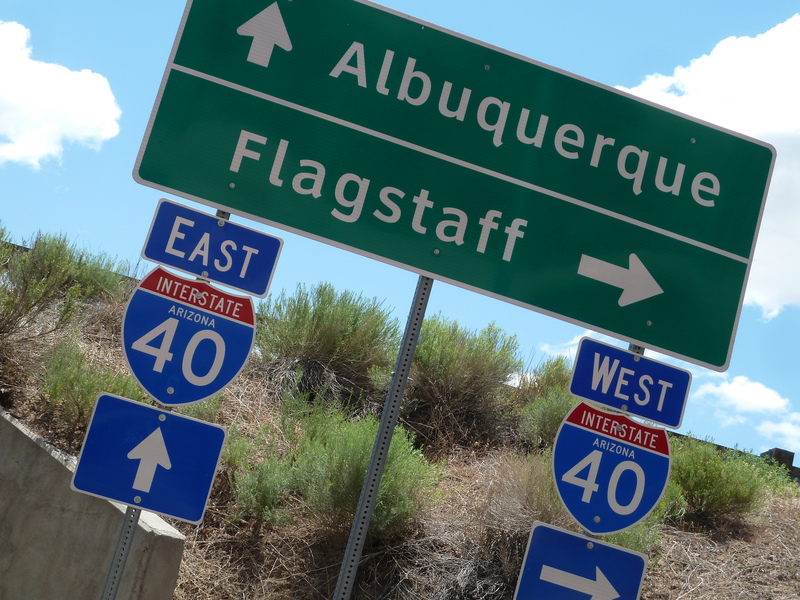 We’d originally planned to reach New Mexico by the end of the day, staying around Albuquerque, but progress was slow thanks to our sightseeing. Time was getting on, and we’d eaten far too much, yet again underestimating American portions. Ian came up with a great idea. 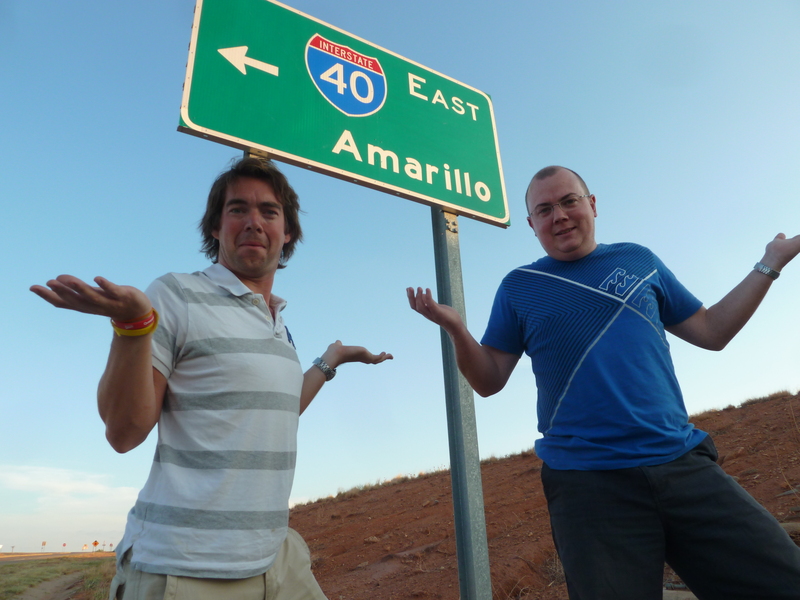 I agreed, and we found ourselves a motel in Winslow, Arizona. Tomorrow will be a very long day of driving. 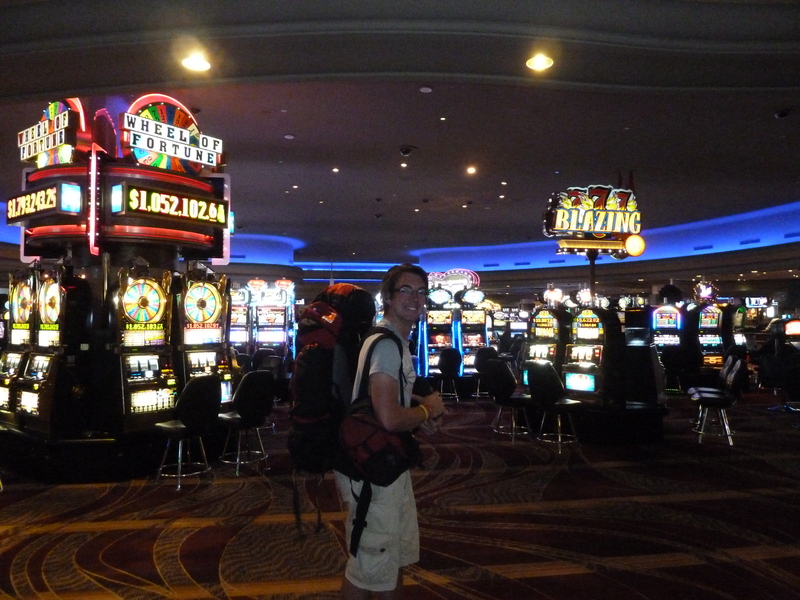 I hit the jackpot in Nevada, and it wasn’t because I’d run into some luck on the roulette wheel. 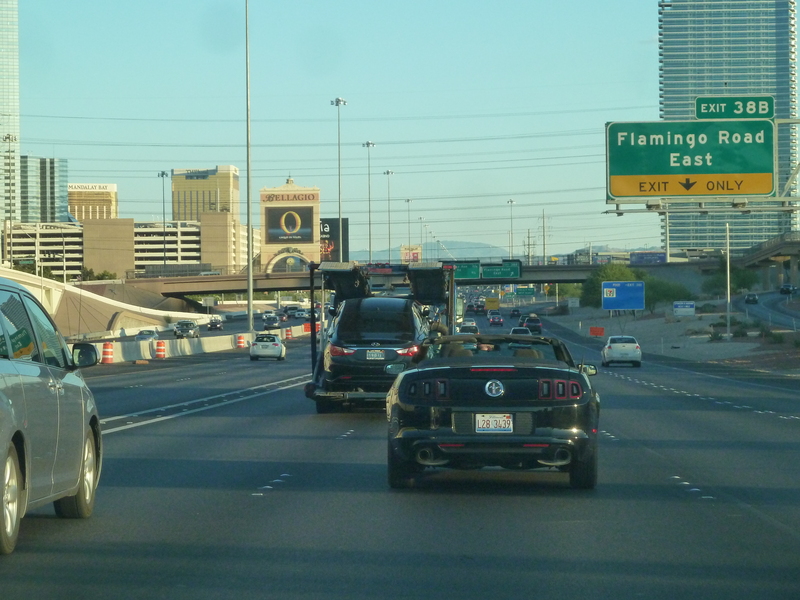 It was where I met my travel buddy Ian, a good mate of mine known as Laingy, who had arrived on the Las Vegas strip in style – in a convertible Mustang. It had been some journey for him too. 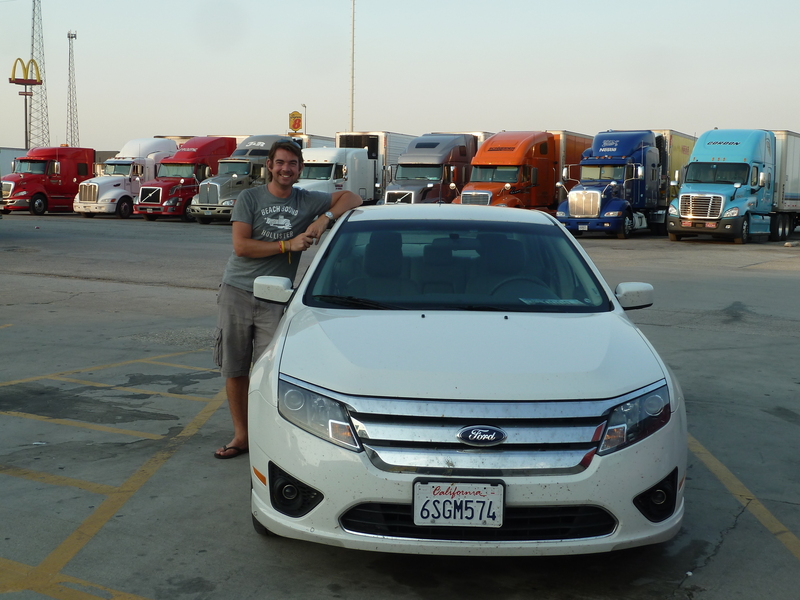 While I had been driving through the night to this bright light city, Ian had been flying through the night to Los Angeles from his native Australia before hiring a car and making the same journey through the desert. 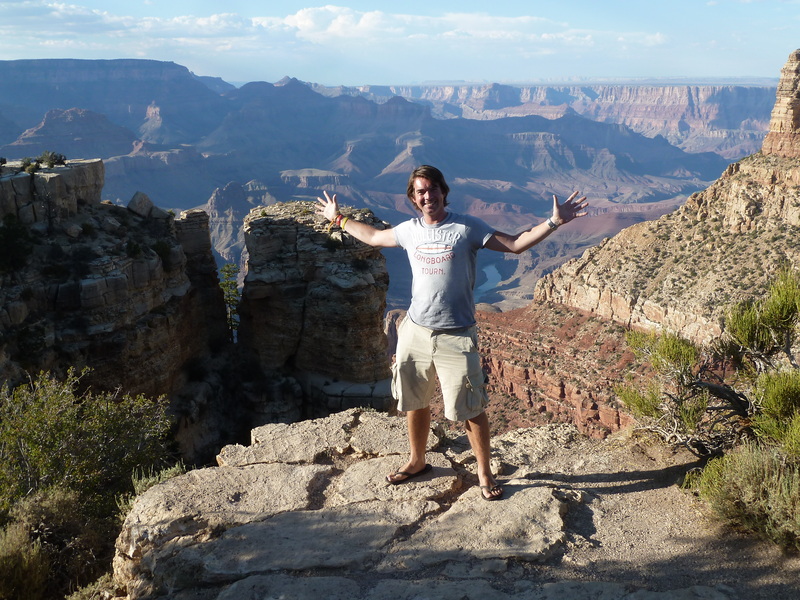 It all followed on from a conversation we had on my last night in Melbourne, where I’d been talking about my onward journey and how I’d quite like to complete the trip with an overland stretch going from coast to coast in America. One of the only problems back then was finance and the fact it would mean spending a long time on my own. “I might be up for a bit of that – its something I have always wanted to do,” Ian said over a pint. And from there, the idea snowballed. 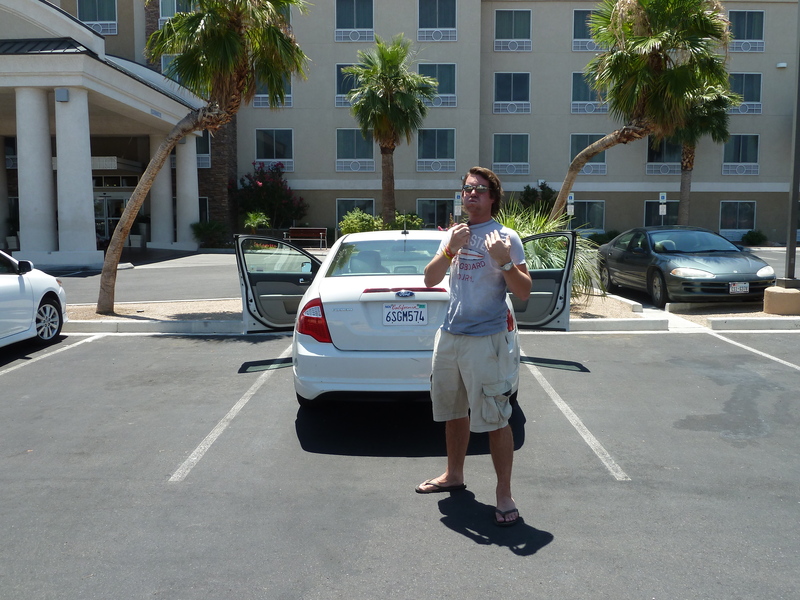 Fast forward a few months, and in the searing Nevada heat, I’m walking across a dusty car park just off the Las Vegas strip to once again shake Laingy’s hand. “Welcome to Las Vegas,” I said, laughing. “Bloody hell, 24 hours ago I was scraping ice off my car, and now its 45 degree heat,” he laughed back in his usual Aussie accent. 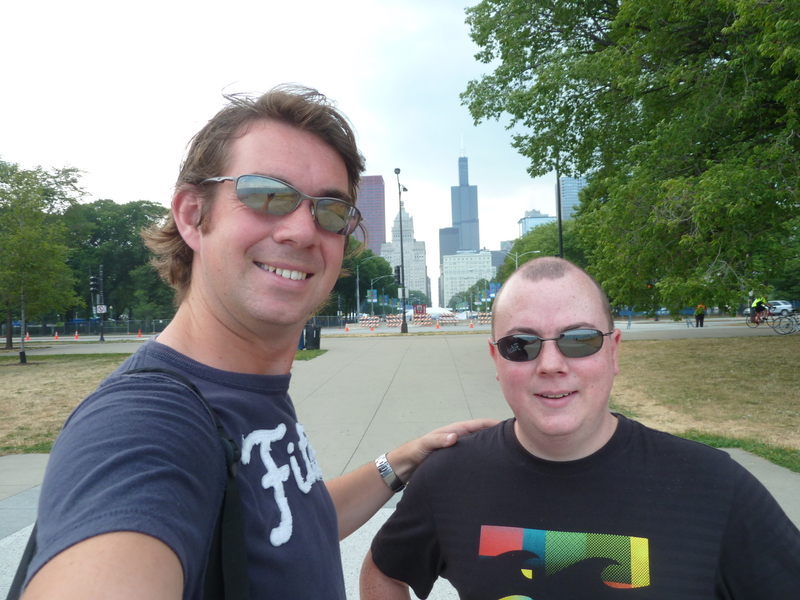 It was a slightly surreal meet-up, orchestrated through free wifi spots and Facebook messages thanks to the lack of a mobile phone, but we’d managed it. I’m well on the way home now, but to have a good mate with me with similar interests will make this leg all the more memorable. 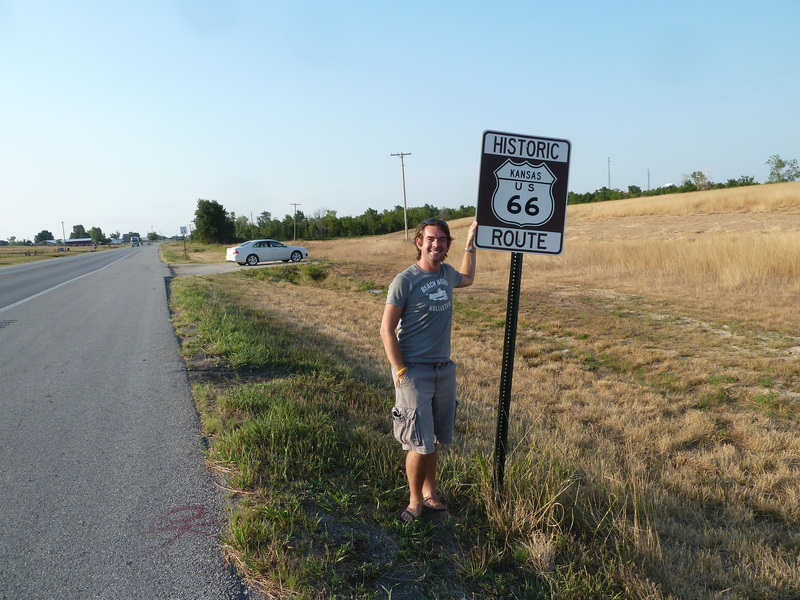 While Ian had to travel to Vegas the quickest way possible, I had begun my Route 66 adventure from Los Angeles by starting at the end. 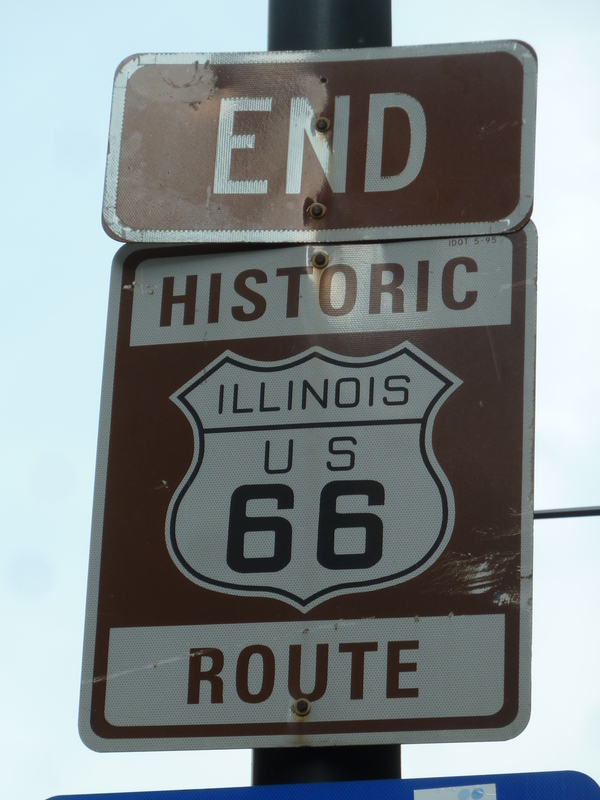 Officially, Route 66 was the way the population migrated west from the Chicago and eastern states following the war and great depression. Known as the ‘mother road’ it was built to help people make their way towards the Pacific in search of work and riches. 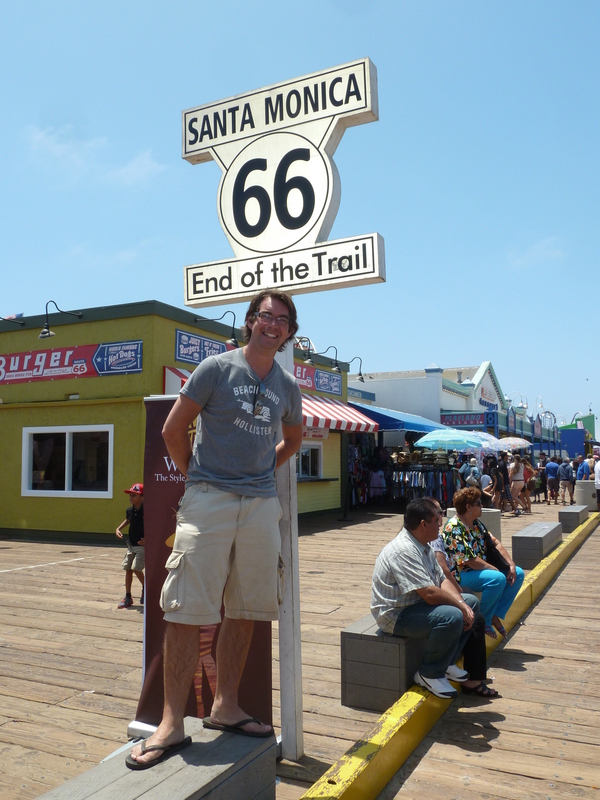 As a result, California is often seen as the end of the road, with Santa Monica pier the finishing point for this great American journey. 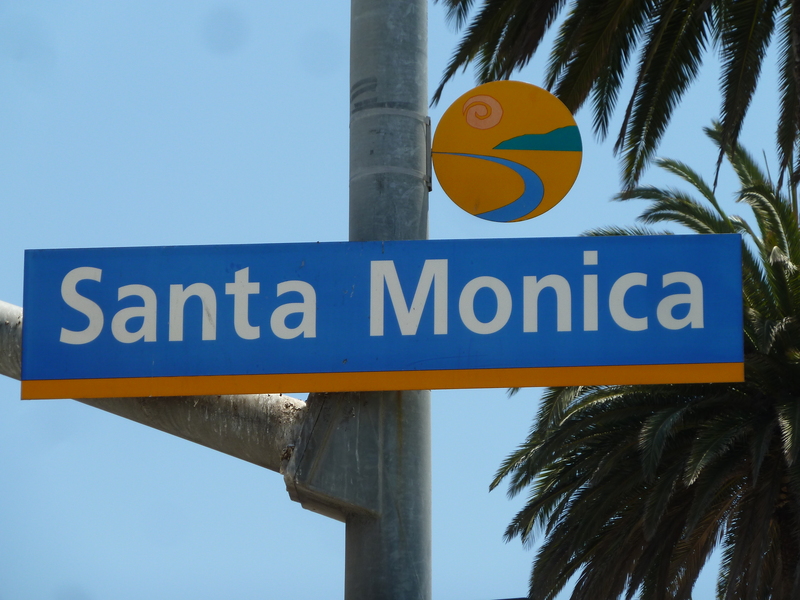 And so it was only natural, making the first leg of Route 66 solo, that I took our car to the far end of the road, to Santa Monica Boulevard and to Santa Monica Pier, complete with its markers that this was, indeed, as far as you can go on the 66. Any further, and you’d end up wet, which is precisely what I did. Having spent six months with the Pacific being the ocean I have looked at off the coasts of Australia, New Zealand and Fiji, it was time to finally say goodbye to it. I had learned to surf its waves, been washed up onto its shores at Bells Beach in Oz, spent countless hours gazing at the horizon over its glinting waters and bobbed around on boats upon it, and now it was time for a final paddle and a photo. 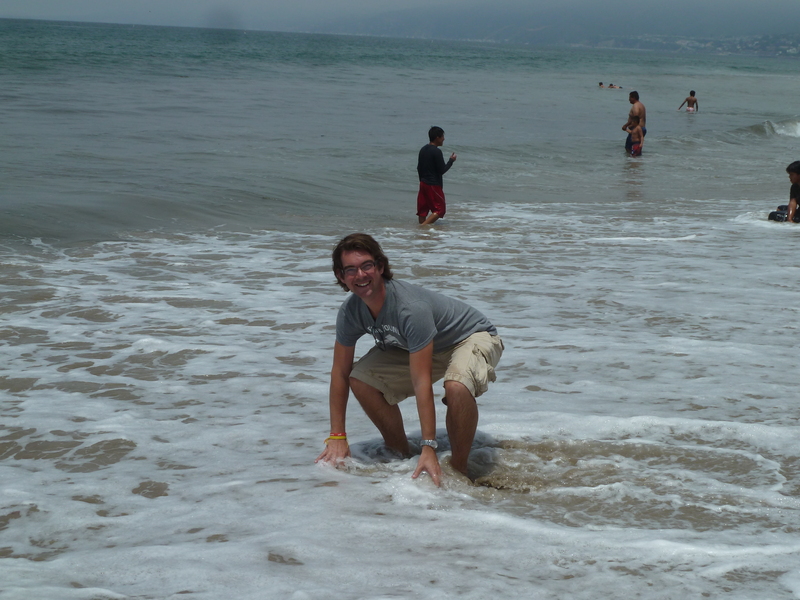 After all, you cant make the coast to coast trip over the States without the obligatory proof shots touching the opposing oceans of the Pacific and Atlantic. I walked to the end of the pier, taking in the street entertainers, music and atmosphere along the way. 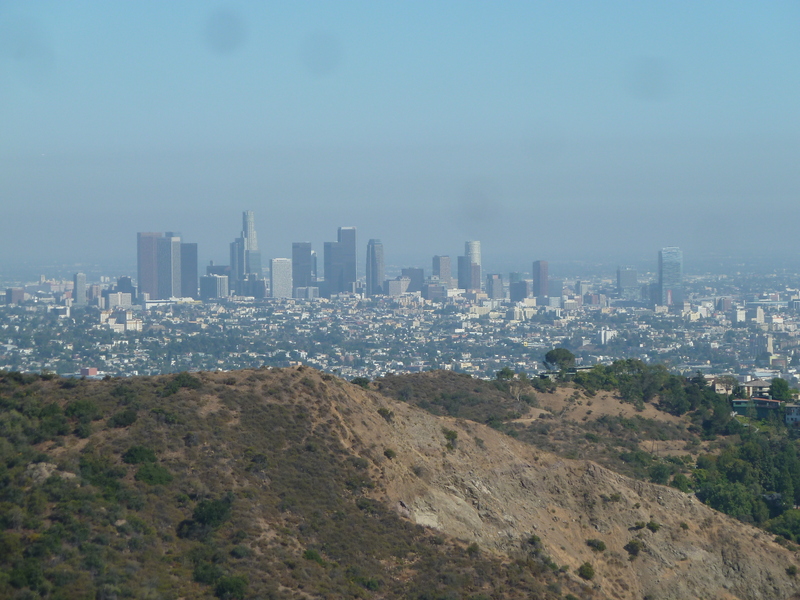 The mist and smog which had shrouded LA during my three day stay began to lift, revealing the beaches of Santa Monica to be just as stunning as they appear on the big and small screen in movies and television programmes back home. 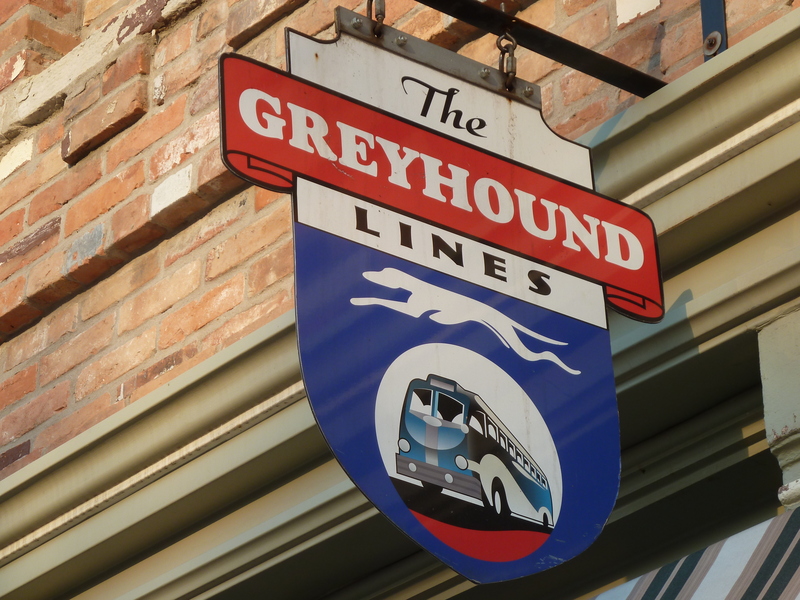 They were full of people enjoying an extended holiday period, families from across the States who have made their own epic journeys to the coast. 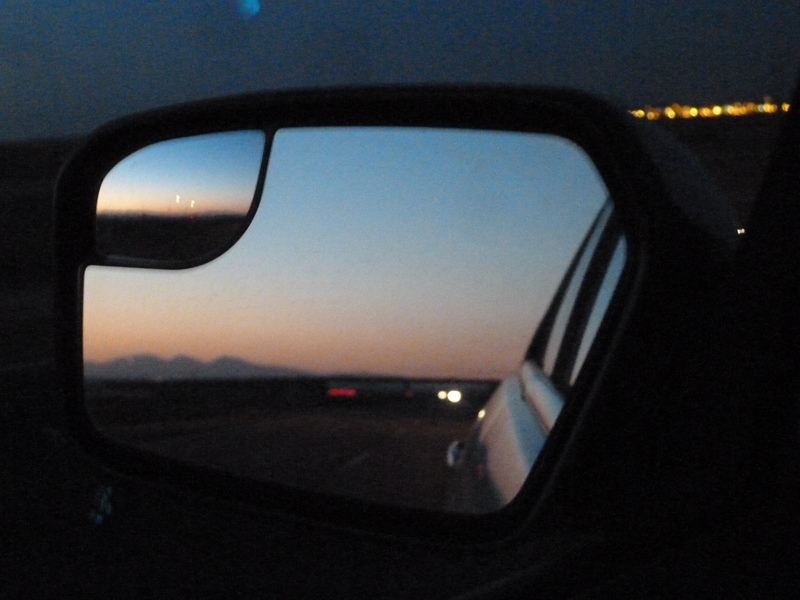 Now it was my turn to head east, and ultimately, back home – from now on, every mile I make in the car is a mile closer to home, and the end of an unforgettable nine months. 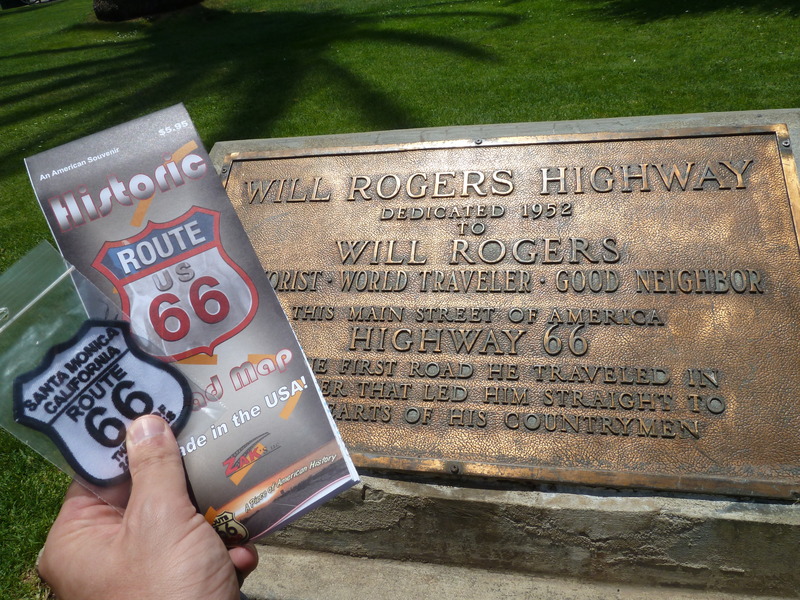 The 66 starts at the junction with Ocean Boulevard, and after one last photo of the Route 66 marker tribute to Will Rogers, one of the world’s greatest celebrities back in the Twenties and Thirties, I got back in the car, took a last look at the vast expanse of the Pacific Ocean, and set my horizons to the Atlantic, more than 3,000 miles away. It felt completely normal to be setting off, pulling away from a parking bay, knowing that there was such an epic drive ahead. It was slightly surreal if anything, getting into a car and turning the radio on as if I was just popping down to the shops. Yet for me, this was a one-way journey east. 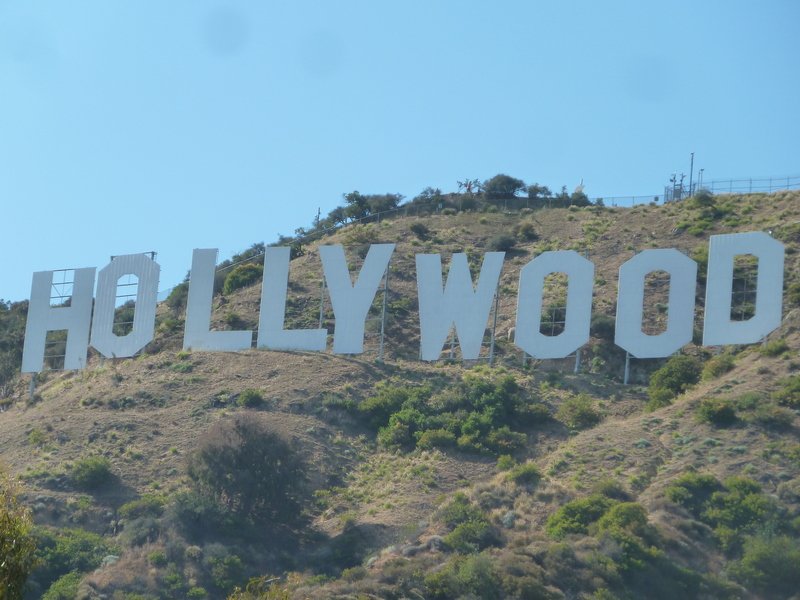 The drive through LA took me all the way through Beverly Hills and past the Hollywood Sign, where I stopped for one final look at the nine famous letters, before heading out to the Interstate 210 north. 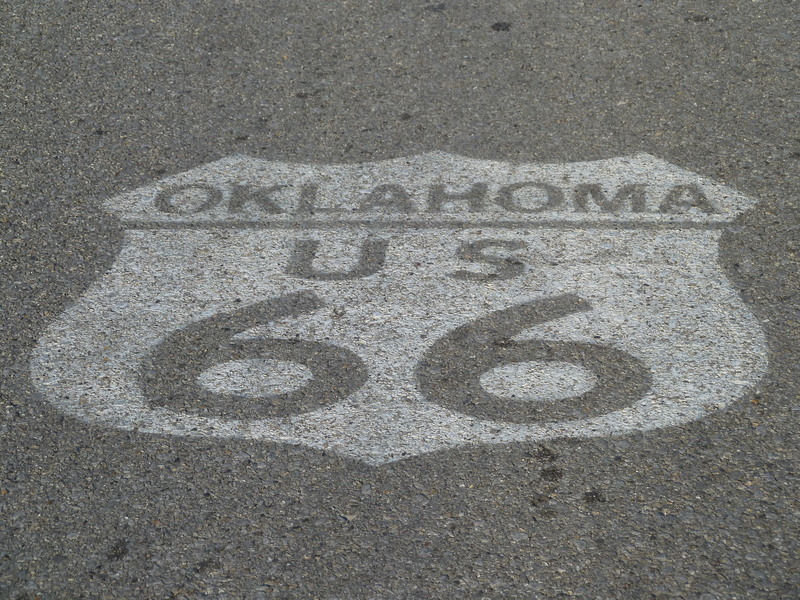 Its not quite following the exact route of the 66, but then its impossible to follow it all of the way these days anyway, as much of the route has been repaved, re-routed and re-classified. Besides, passing so close to Las Vegas, it would be rude not to pass by and spend a while amid the bright lights and high rollers. First, there was another minor detour. There was an interesting place I wanted to visit on the way, a place that I had seen on a Discovery Channel programme a few years back, and was amazed by the scale of it. All I will say is have you ever wondered what happens to aeroplanes when the airlines either go bust, cut routes or simply retire some of their aircraft? Well, they get sent to California and to the Mojave Desert, a place that I have to drive through in order to reach Las Vegas. Because the air is so dry, and days of rainfall are so few and far between, metal doesn’t rust. And a Boeing 747 is made up of a lot of metal, which if left sitting in the elements for too long without maintenance, will corrode and render hundreds of millions of pounds worth of plane useless. 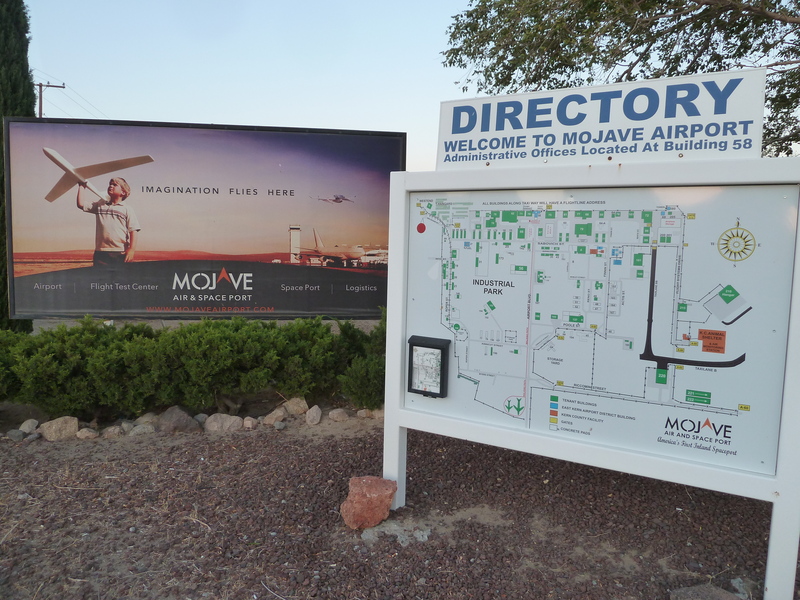 So they get flown to the aircraft graveyards and boneyards of the Mojave Desert, where attempts are made to remove or disguise logos and distinctive paintwork before the planes are left to sit in the sun on an extended holiday of their own. They are easy to find, with the bright metal fuselages and tails sticking out for miles in the flat desert plains. During the airline slump post September 11, hundreds of aircraft were once stored here as people stopped flying and airlines cut costs. 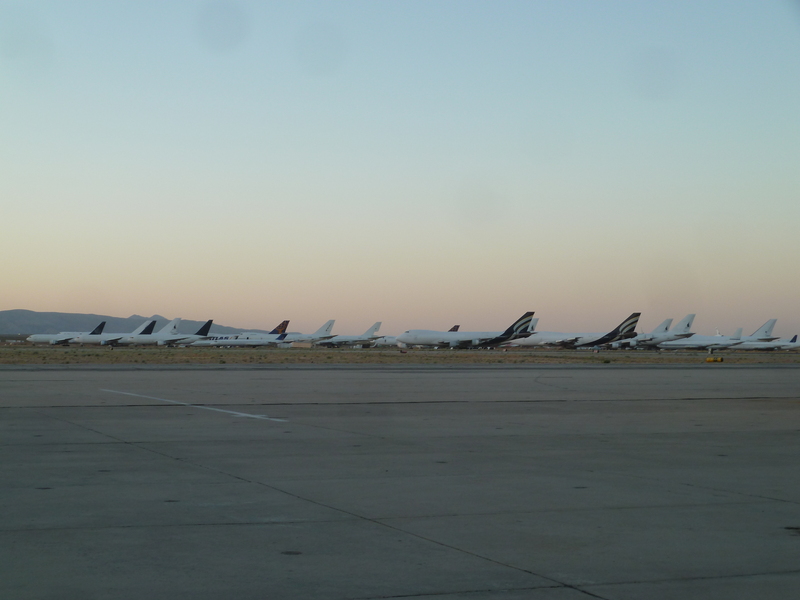 While the numbers are nowhere near as high now, it was still quite a spectacle to see so many perfectly good aircraft simply sitting on the sand instead of cruising through the skies filled with hundreds of people. 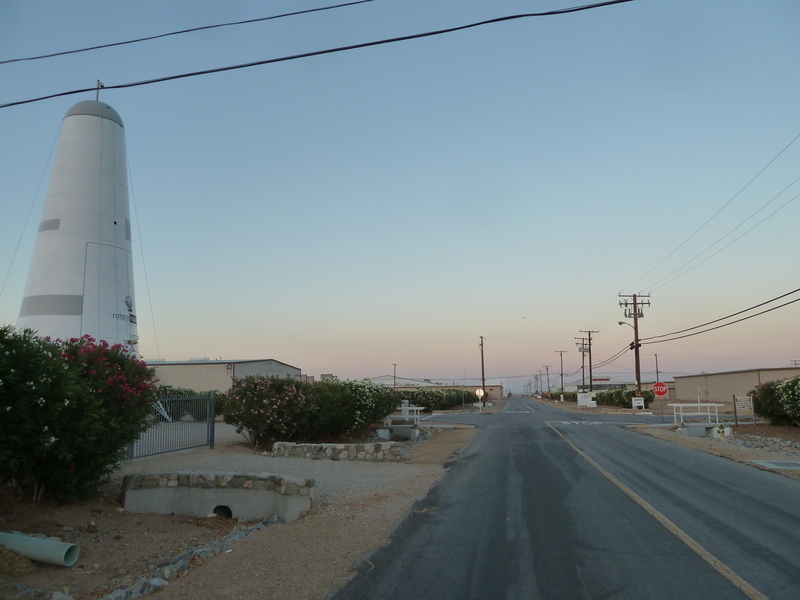 After being spotted by a security van taking photos, it was time to disappear, so I took off down the road towards the famous Edwards Air Force Base, a giant development that takes up a significant proportion of land, around half the size of LA, alongside the dual lane route 58 to Barstow, one of the first major towns on Route 66 outside of Los Angeles. 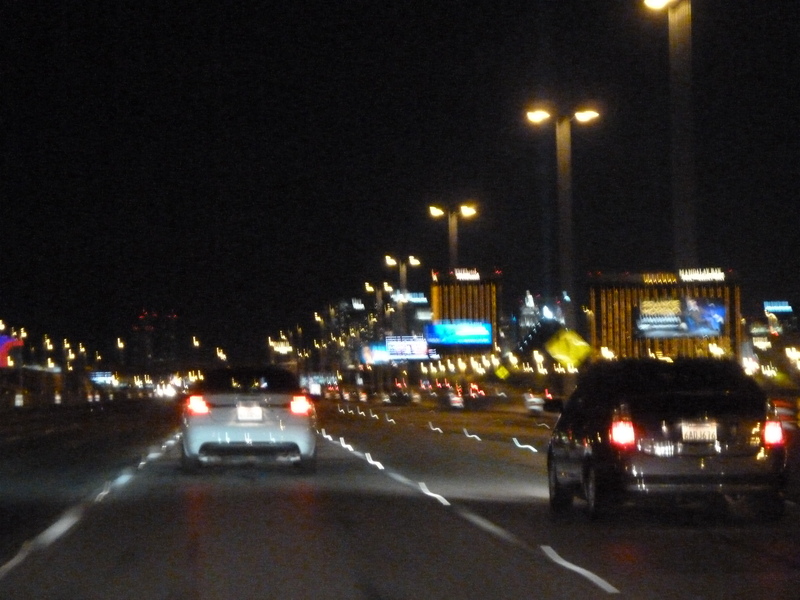 From here, I picked up the interstate 15, a motorway that shoots straight up to the Nevada border and on to Las Vegas. 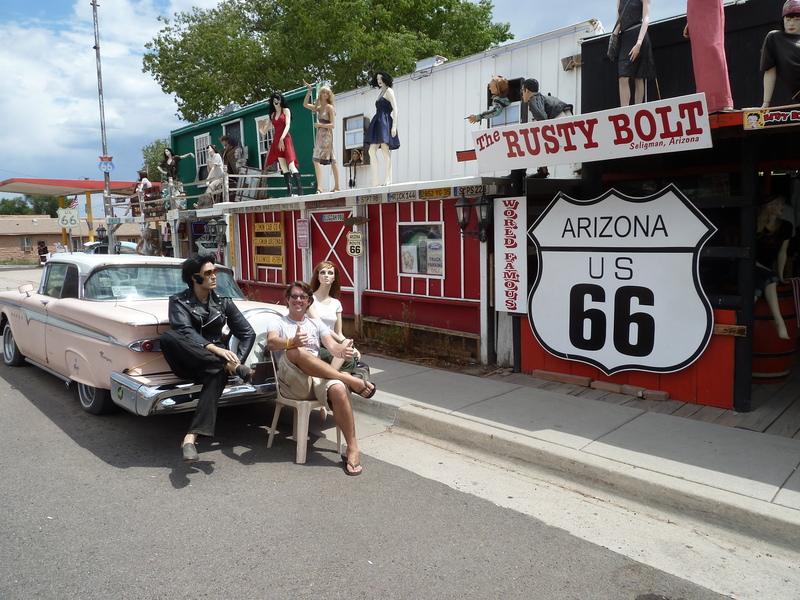 While Vegas was never on Route 66, most people who make the journey divert themselves to the gambling and entertainment mecca for a few days, if anything just to experience it. 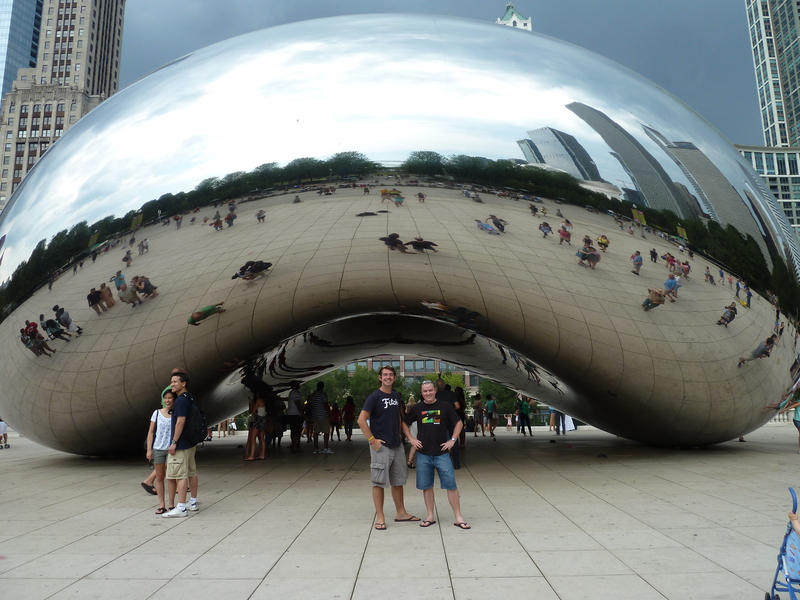 It only adds a couple of hours onto the journey, to and from the city, but it was a definite huge tick on the bucket list to visit the place. 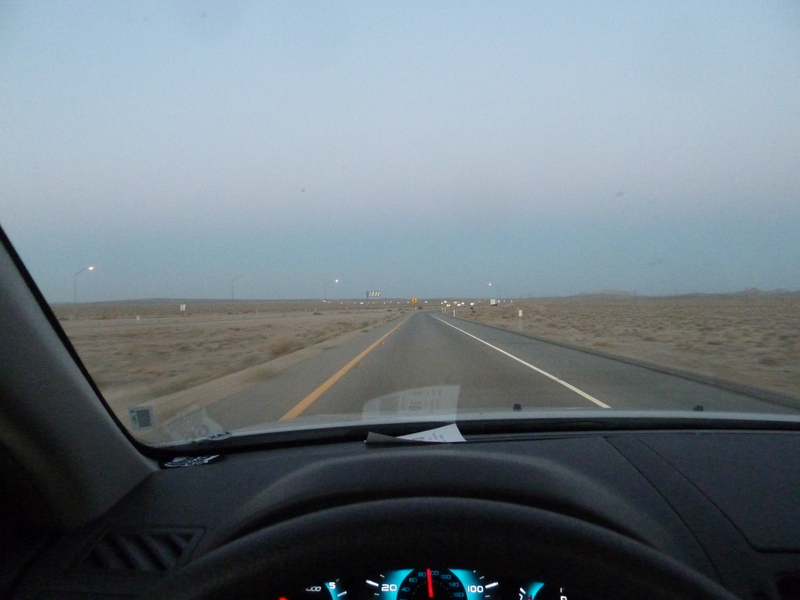 I had timed my journey to arrive in Las Vegas at night, driving for some five hours through the pitch black desert with a couple of coffees and a bar of Hershey chocolate for company. I watched the mile markers tick down to just 100 to go, while hundreds of Californian registered cars would fly past me, no doubt full of LA residents and workers desperate to get to the fun-filled spot in the desert for a weekend of excitement. I was still 60 miles out when I first noticed the sky ahead changing. 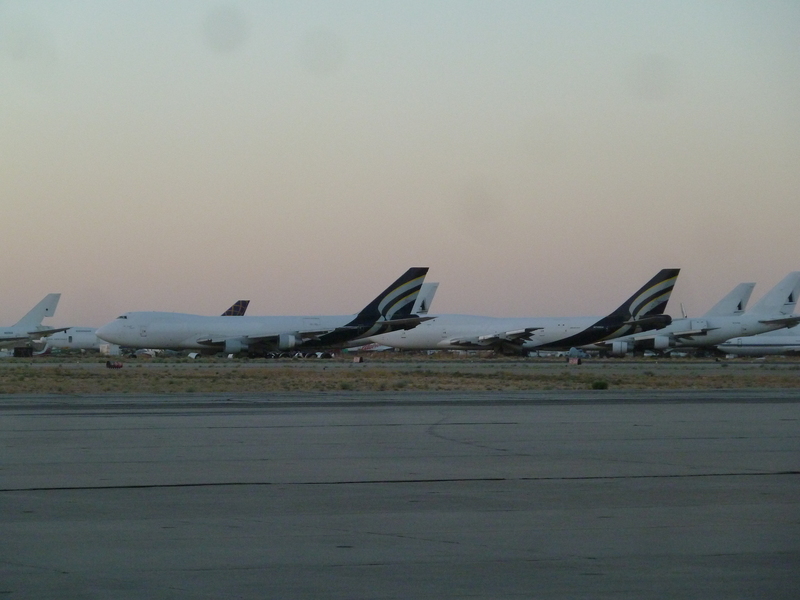 There was a distinct glow up ahead, while the blinking lights of aircraft began to appear around me as they circled before landing their Vegas-hungry payload at the purpose built airport by the main strip. With two long drags up some incredibly long hills, complete with warnings to turn off air conditioning to prevent engines overheating in the scorching desert heat, the glow started to get brighter, and with a final push over the hilltop, suddenly my windscreen was filled with the millions of dazzling lamps from the desert oasis known as Las Vegas. 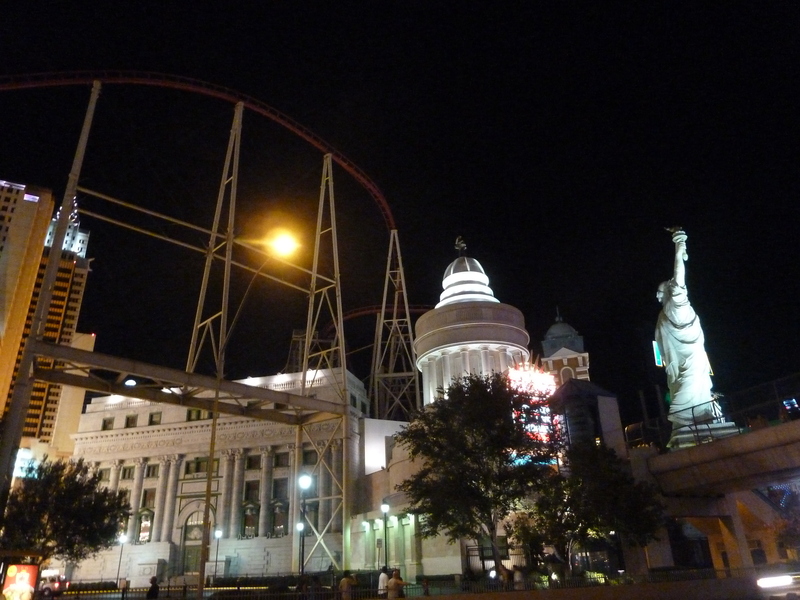 I continued driving, arriving on the outskirts of the city knowing that somewhere amid the neon glow was my hostel, which according to its website was near the famous Stratosphere tower on the main strip. 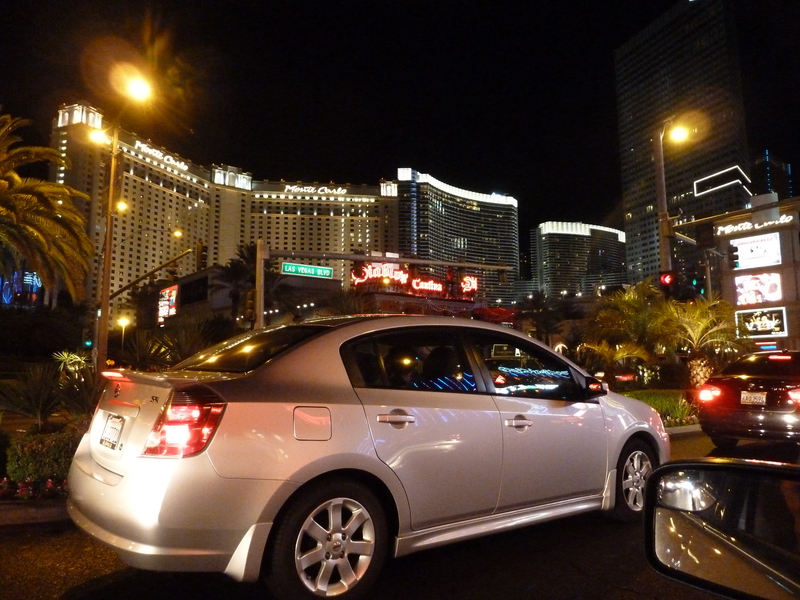 I saw a sign for Las Vegas Boulevard, and knowing that was the main strip, made a left turn and headed straight onto it. It was hard to concentrate on the road ahead. 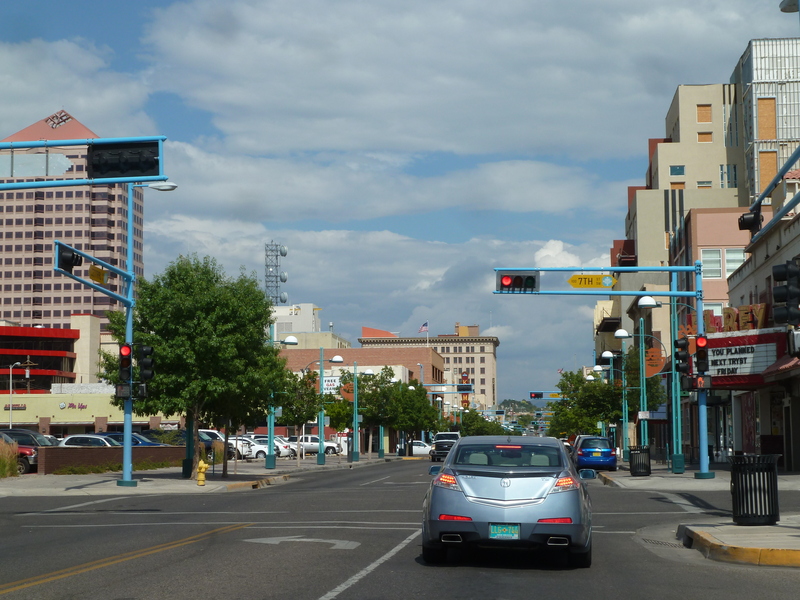 As I passed the huge, mock, New York skyline that marked the New York New York casino on one side, the famous MGM Grand on the other, I slowly made the stop-start drive along the main street. 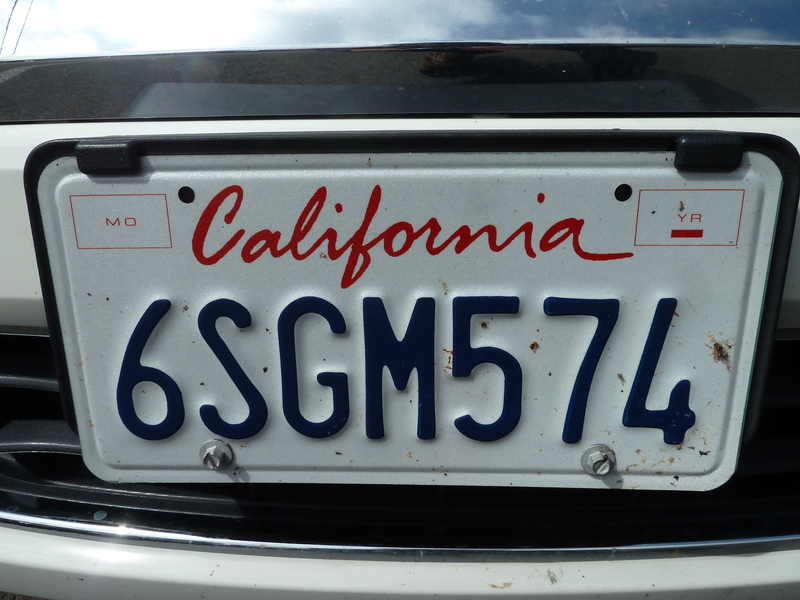 It was a Friday night, and I found myself caught up with scores of other Californian-registered cars that had clogged up the road as people made a similar getaway for the weekend. 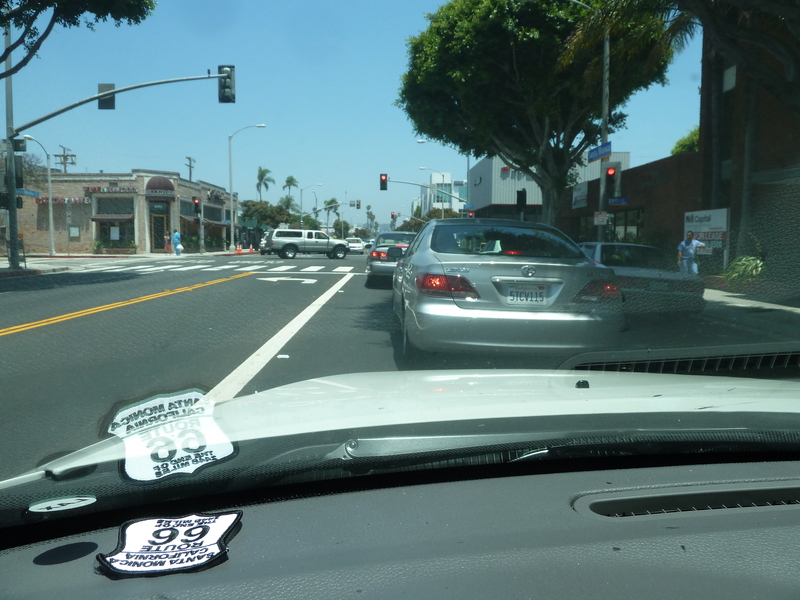 For once, though, I was glad to be in a snarled-up traffic jam. It was the perfect way to take in my first Vegas experience, a place that was alien to me having never visited before, yet felt so familiar having seen it so many times in films or on television. The names of the casinos alone roll off the tongue, mentally ticking them off as I made my way from intersection to intersection. The Mirage, Monte Carlo, Paris, The Venetian…and then on my left, the huge dancing fountains and music of the Bellagio, followed by the gigantic area taken up by Caesars Palace. Everywhere I looked, there was something going on. From street performers to musicians, magicians and tourists all jockeying for position on the sidewalks, to fellow wide-eyed motorists driving along, taking photographs and smiling as this adult wonderland we’d suddenly found ourselves in. 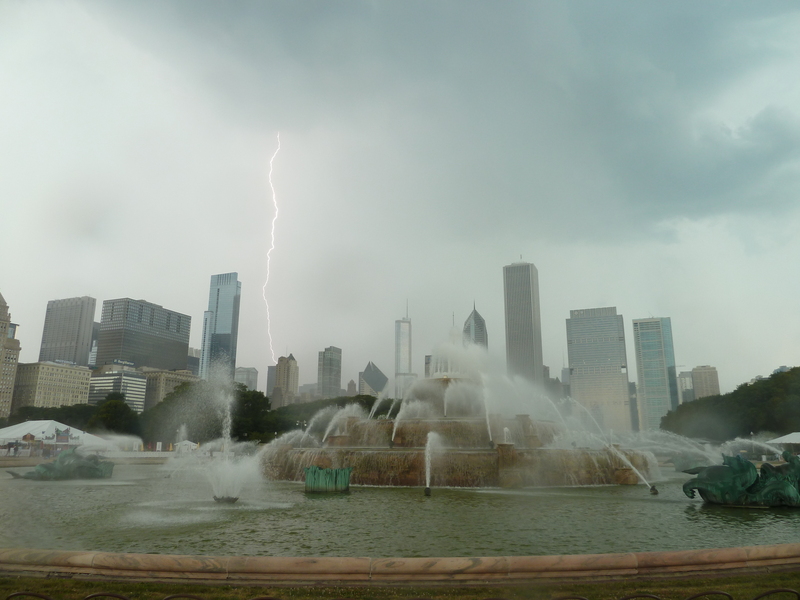 It was quite a spectacle outside! And still the familiar names passed by the window – Treasure Island, with its pirate ship frontage, Circus Circus with the huge clowns and big top, or the sleek-looking Wynn complex. 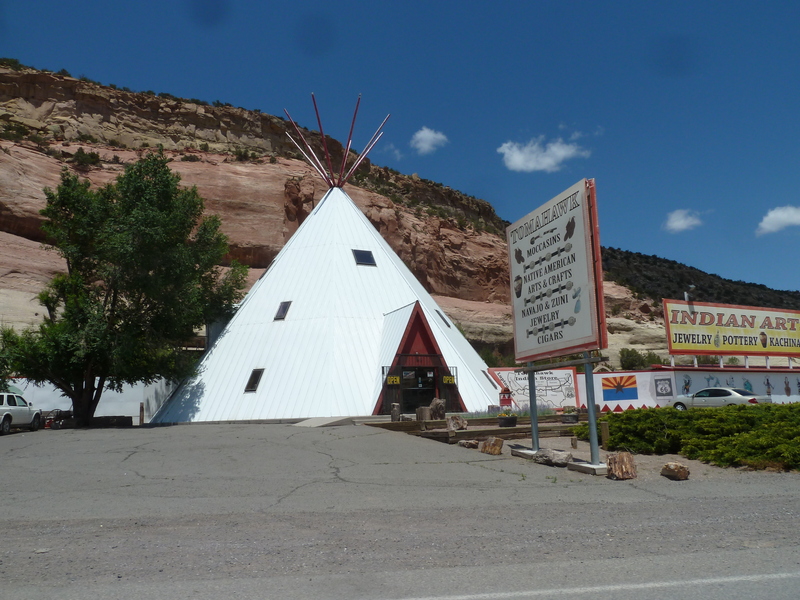 In fact, while I was expecting a substantial amount of neon, flashing lights and huge, money-no-object structures and hotels, the overall size of the place was the main surprise for me. 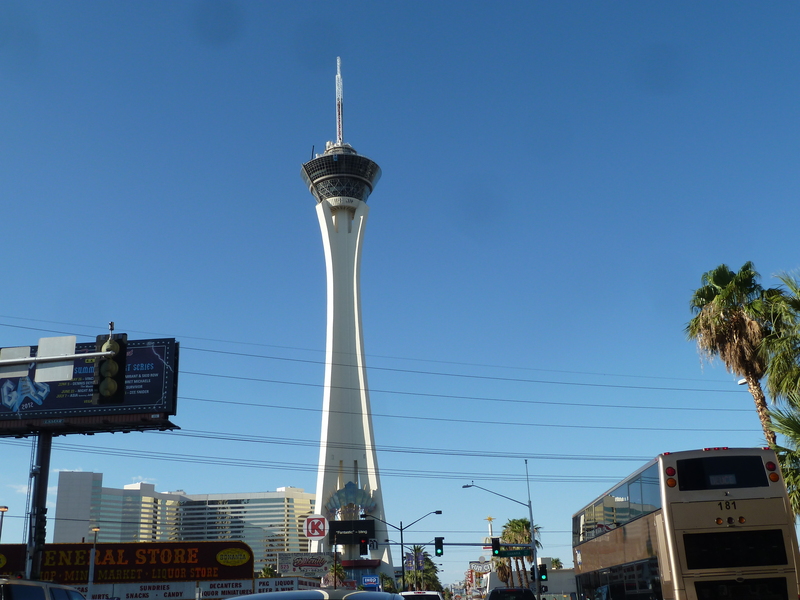 It took well over an hour to make my way in the car from the south end of the strip to the north, finally spotting the familiar mast-like Stratosphere structure, and eventually, after a couple of stops outside McDonalds to use their free wifi, pulling up at the Hostel Cat. My $19 bed couldn’t have come soon enough. 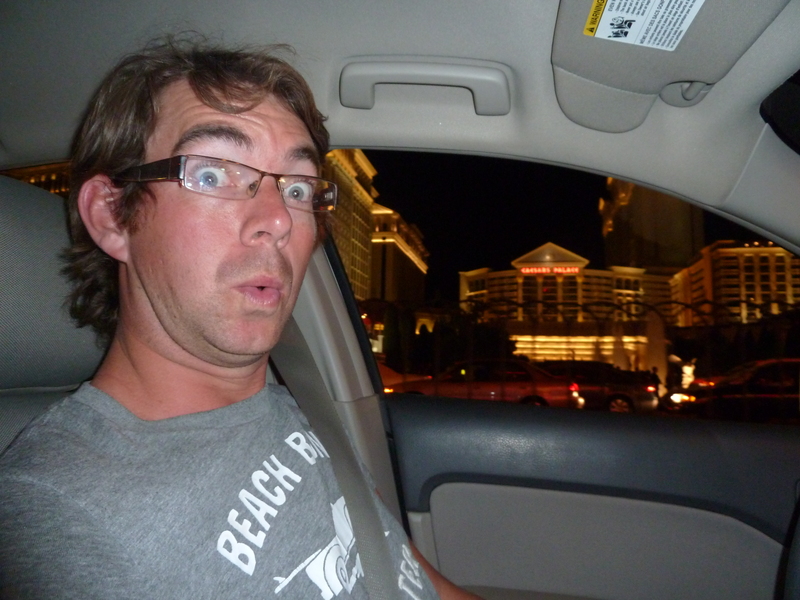 Friday night, my first night in Las Vegas, and I was in bed by 2am! The earlyish night, by Vegas standards, paid dividends the following day however. 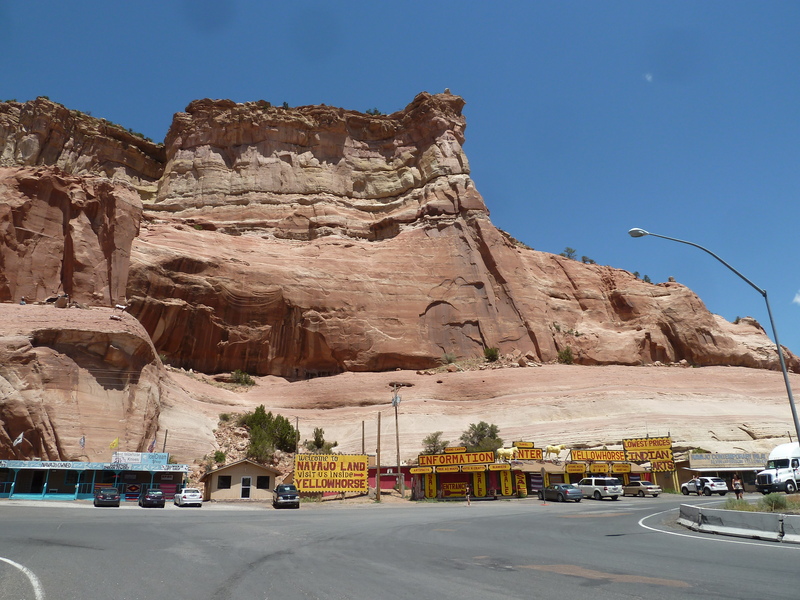 For one, the heat in the Nevada desert can sap the energy out of you – the thermometer hit 47 degrees, and just walking outside the air conditioned comfort of the hostel was enough to send you running for immediate shade. Door handles become red hot, the metal panels on the car could quite easily double as a griddle plate, and a day of sight seeing was out of the question. “We’re going to the pool at the Monte Carlo,” came a cry from reception, raising a cheer from the fed-up looking hostel guests who were clearly sick of the heatwave gripping this part of the States. It sounded like a good idea, and besides, it meant I would see some of the Vegas strip during the day, even if it was from the window of the hostel transport. Except, what the guys from the hostel failed to explain was that we’d be sneaking-in to the Monte Carlo casino, to use their pool, and that the transport was a beaten up minivan without any seats. 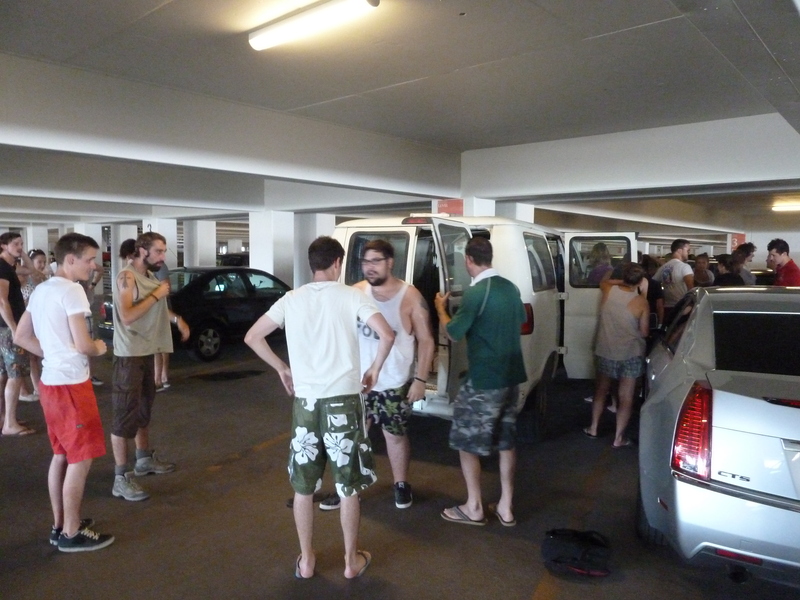 And when they said it would be a hostel outing, it really was, as 26 hot and sweaty backpackers began the difficult job of packing into a van the size of a small Transit. “Let me just close the anti-police device,” said Chandler, from the hostel, as he pulled a cloth curtain across the windows to stop authority eyes from seeing just how many people had been crammed into the back. And still more people were climbing in through the door. 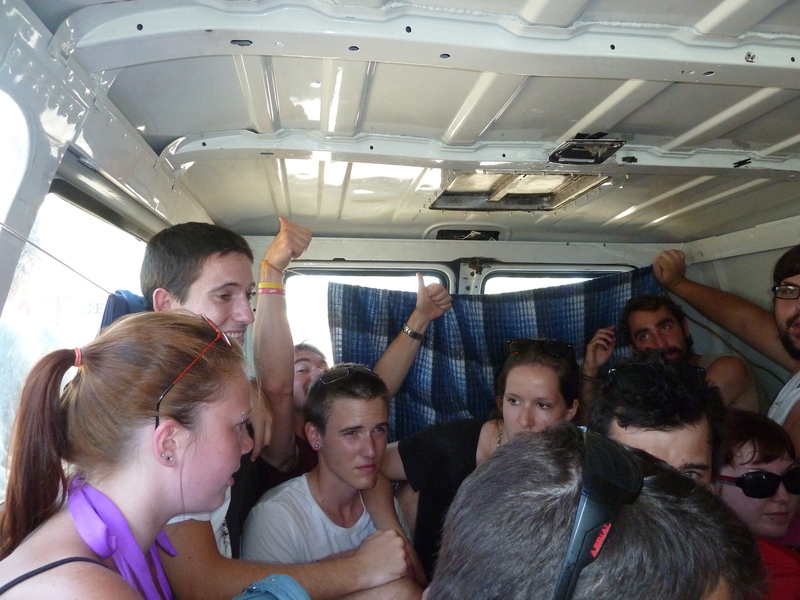 I’d wedged myself into a back corner, where gradually the air began to thin and sweat began to drip from the mass of packed in bodies amid the heat and the greenhouse effect that the van had without a breeze. Thankfully, and with a record of 29 people once stuffed into the van, someone was prepared and brought along a water spray to cool us down as we made our way to the far end of Vegas. 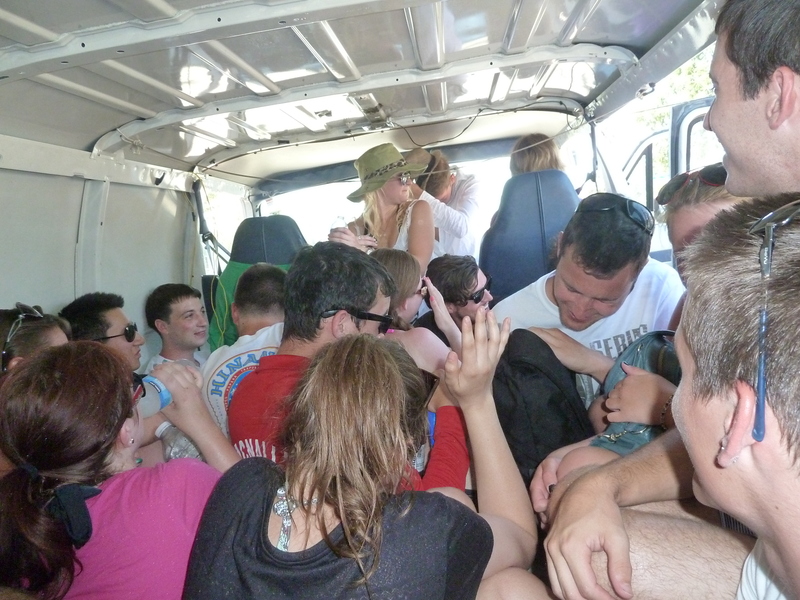 “Right, we can’t all go in as one group,” said Chandler as a steady stream of people clambered, fell and dragged themselves out from the back of the van, resembling something from a game of Twister that had gone badly wrong. “They won’t let us in, so we have to pretend we’re going to the bar. Look at the menu, then just drift through the door to the left, grab a towel from the guy at the towel stall and meet back over to the right,” he continued. Having sneaked into a fair few VIP areas over the years, I can honestly say this was the most blatant blag I have ever been a part of. Standing outside the glass windows of the bar, a group of 26 was whittled down into a few separated groups of threes and fours. Within a couple of minutes, we’d more or less tripled the patronage of the bar, yet nobody had ordered a drink. The barstaff looked confused at this mass of new customers, yet had very little to do. And as quickly as we’d all appeared, we’d all disappeared through a door and into a pool, amid a variety of excuses. 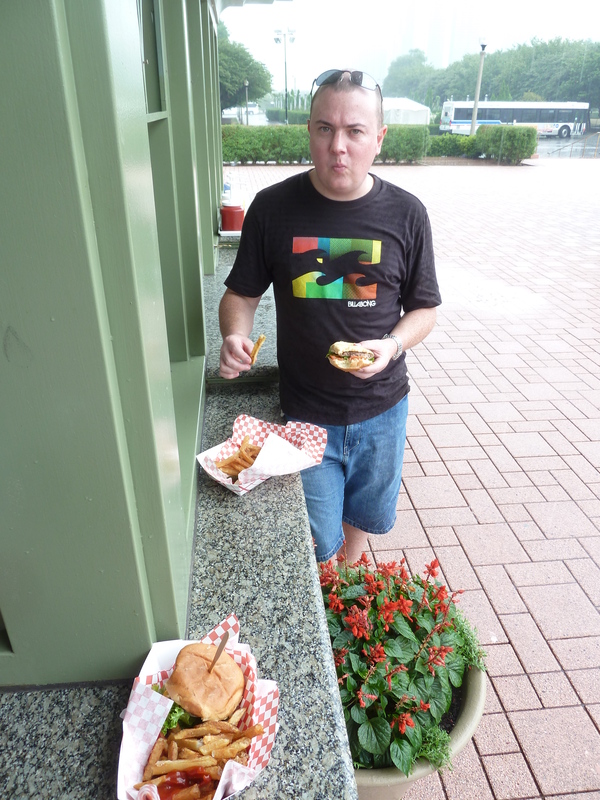 I opted for the ‘I fancy a hotdog outside on the terrace,” excuse, before exiting stage left. We’re in! Vegas pool party! Somehow, we’d managed it. We had access to a huge pool, posh deckchairs, a river rapids area and even a DJ putting out some of the latest tunes for us all to listen to. It was a great pool party that we’d crashed, and all for the price of a dollar towards the hostel van’s gas account. I guess this was all part of the Vegas vibe. After a few hours of doing everything I could to avoid the attractive, bikini-clad waitresses who were offering to fetch me a very expensive drink, I made my way to one of the casino halls to use yet more free wifi. 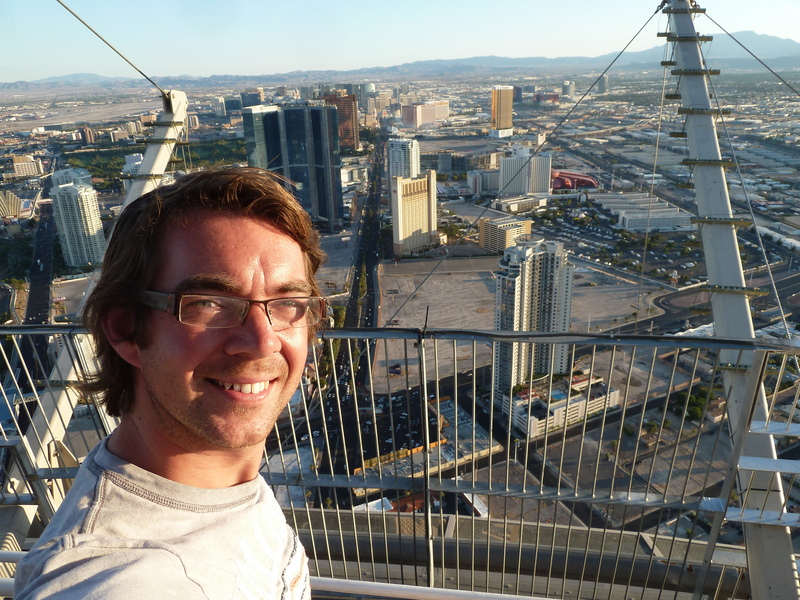 Ian had arrived, according to Facebook, so I caught one of the Vegas buses and managed to spot where to jump off. As if by magic, and standing by his jet black Mustang that he’d hired for the same price as a flight from LA, was Ian. We headed straight to the airport, so he could return his car, get him signed up as a driver on ‘our’ car and headed back for more free wifi to book some accommodation. Here came another surprise. I knew hotel rooms could be cheap in the city, but I had no idea just how cheap. For just £5 in the week, you can secure a double room near the strip. It was cheaper than my hostel, and I’d had no idea. It was partly down to this that we made a snap decision. “I think we’re going to need longer in Vegas,” I said, knowing there was far too much for us to see in just the few hours we had initially put aside after Laingy’s arrival. 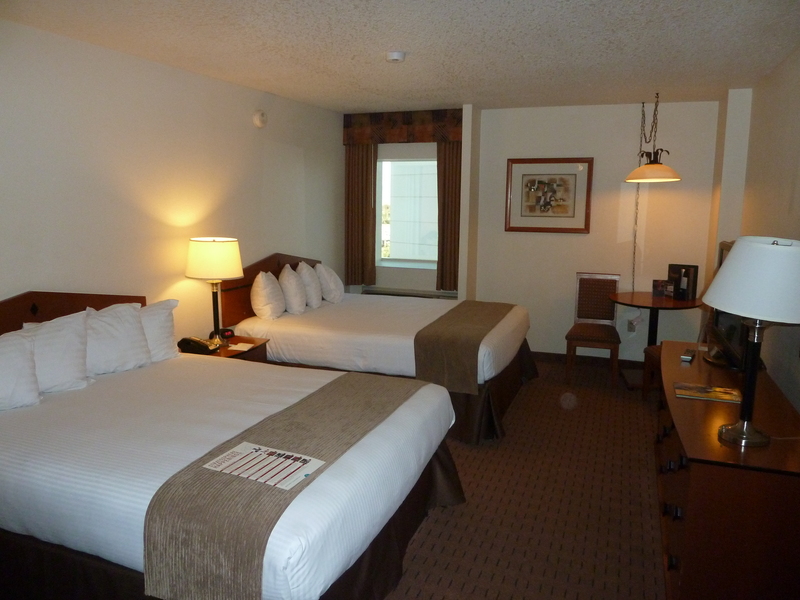 The fact that we could book a double queen bed room at the Stratosphere for just $35 was another factor. 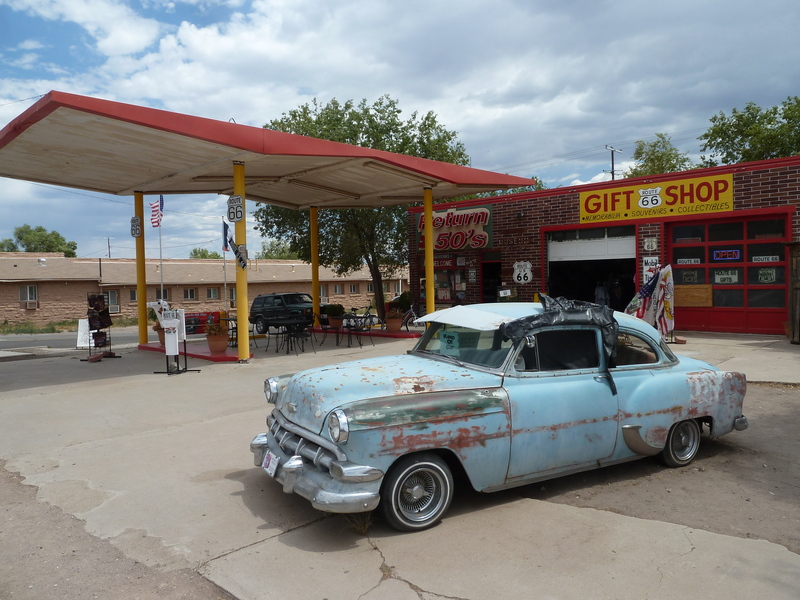 It would mean that we’d now just have just five days to drive the entire length of Route 66 and make the 12 hour trip from the end of it in Chicago to the east coast, but we’d calculated it was just about achievable. Ignition on, aircon cooling the car – was a tad warm! There had been a few people in recent weeks who acted with surprise when I told them about the short time frame we had to complete the journey. “You’ll never get to see anything, or stop anywhere,” was the usual word of warning. 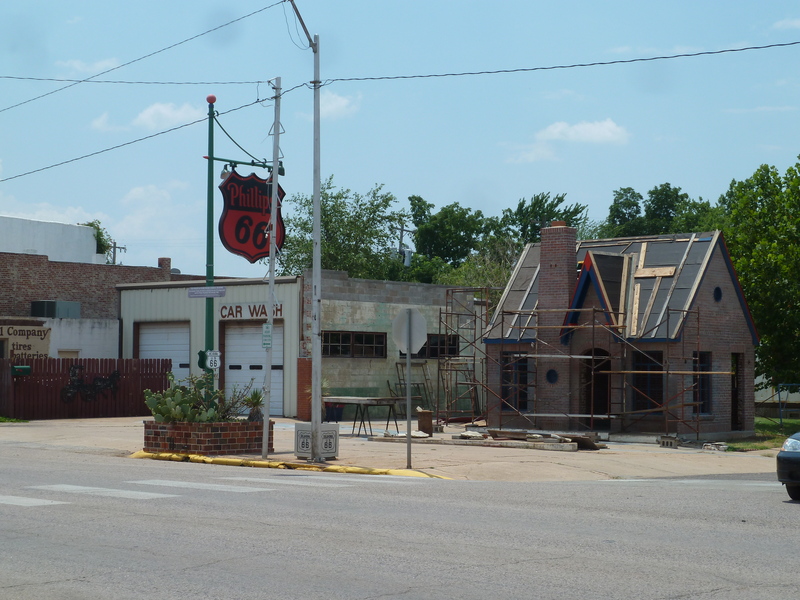 But Ian and I were in agreement that driving the Route 66, and making a coast to coast journey and seeing all the changes in scenery along the way, was the experience and what we were both in the States to do. 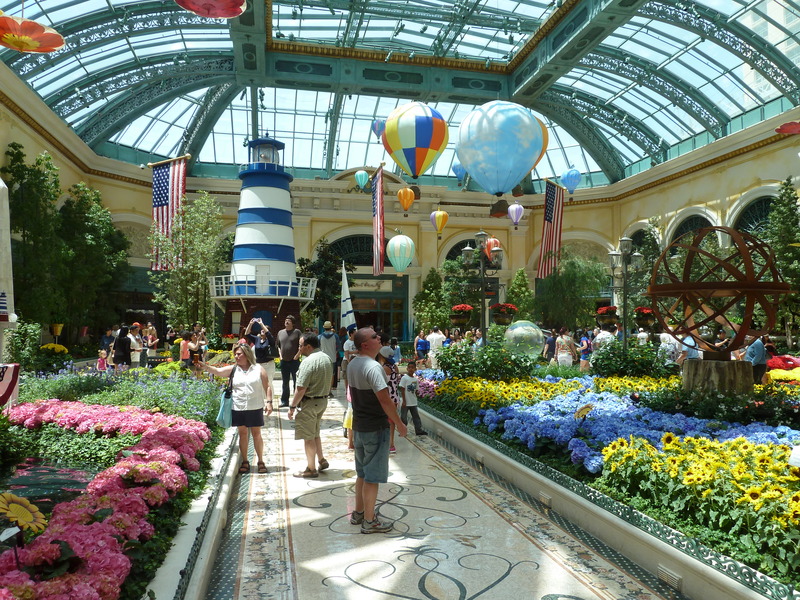 Beautiful Bellagio gardens. Impressive, considering its next to the lobby! It gave us a couple of days and nights to explore this magnificent place. From wandering around the incredible malls and hidden cities that lay at the base of all the casino resorts, to taking in some of the free shows on the street, to losing the obligatory few bucks on the casino tables and putting a couple of dollar bills in the penny slots, we pretty much managed to ‘do’ Vegas. It is a place that I am finding difficult to describe in words, which for a wordsmith, I know, is a pretty poor show. But Las Vegas is simply one of those places that it is very difficult to comprehend unless you experience it with your own eyes, ears and senses. 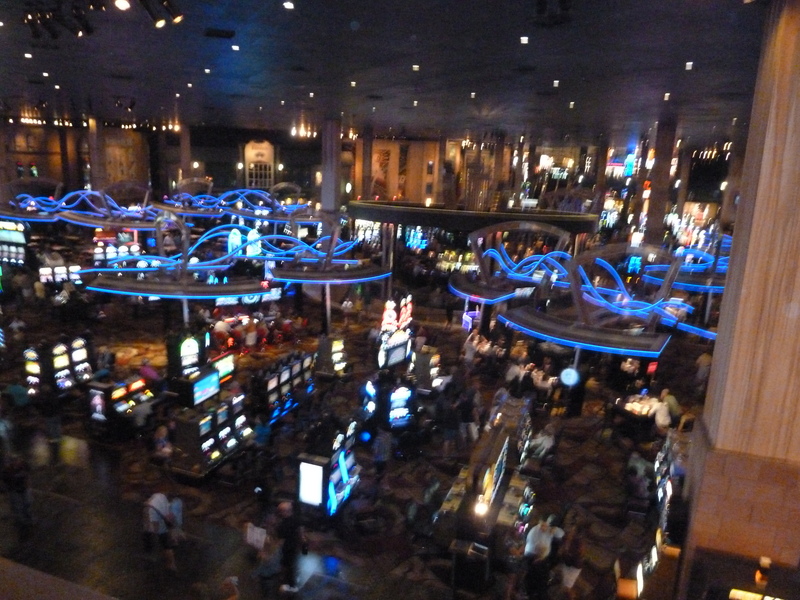 We spent our sightseeing day visiting as many of the casinos as possible, and when I say ‘casino’ I don’t necessarily mean the gambling halls. For Vegas is more than just Blackjack, Poker and Roulette, or placing bets of up to $15,000 on the roll of a dice (and that was just the top maximum bet we’d managed to spot) Deep in the bowels of the towering hotels and casino complexes, I was surprised by how much there was to do aside from feed money into machines. 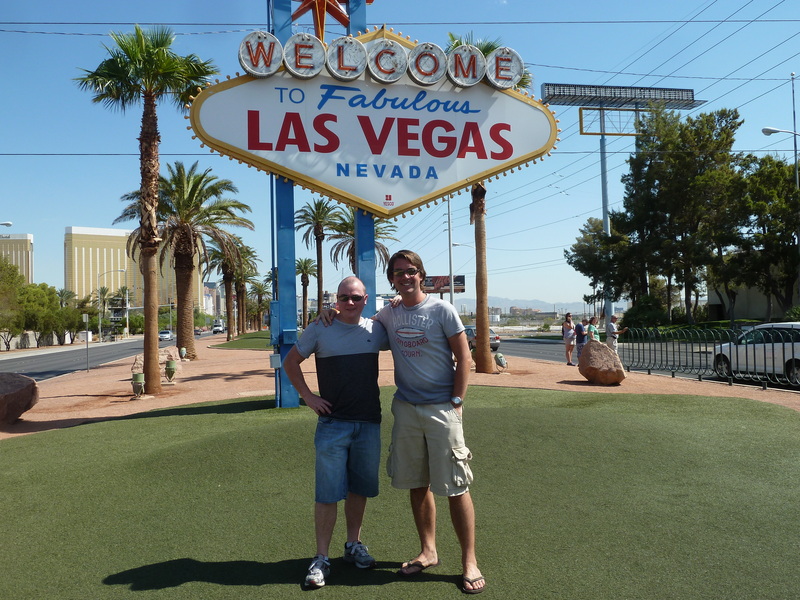 There are, of course, the glitzy big money shows featuring anyone from Celine Dion to David Copperfield, a whole range of restaurants and dining facilities, exciting white knuckle rides and experiences, but for Ian and I, the fun was in just being in Las Vegas itself. 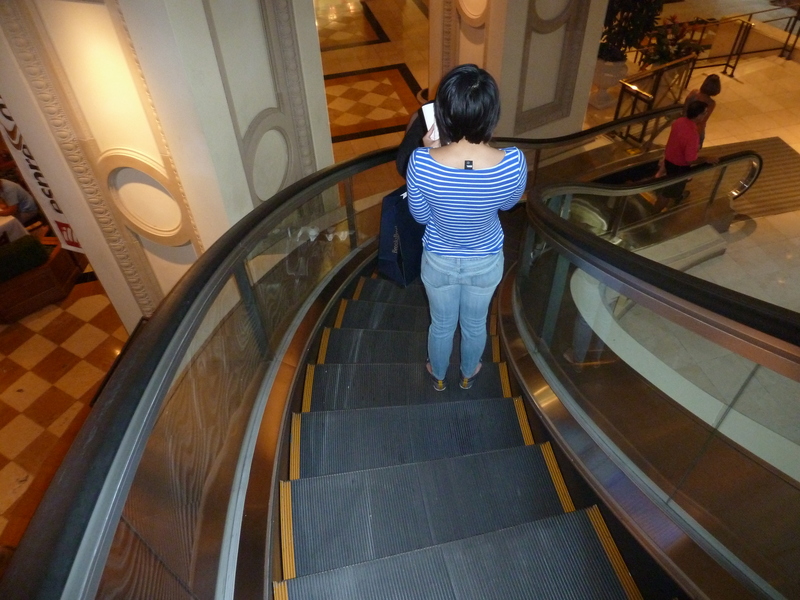 Vegas -it even has curly escalators! 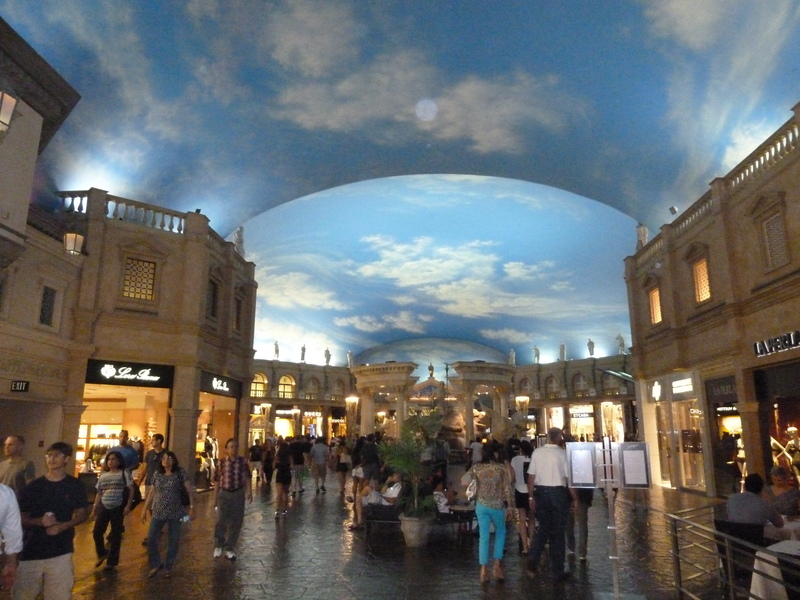 It was about walking around the streets and through the blissful air conditioned malls, complete with clever sky effects on the ceiling to make it feel like you’re outside, and the famous canals of the Venetian. 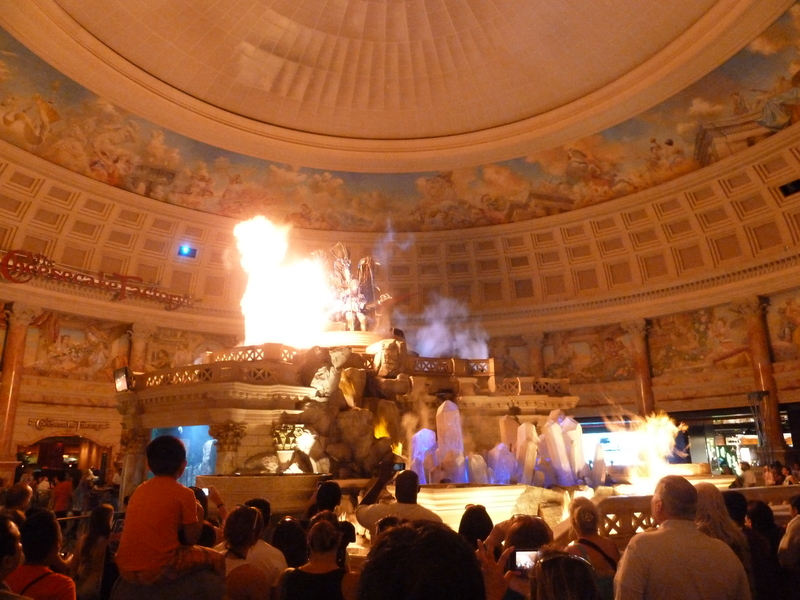 It was wandering around and suddenly stumbling across statues that move and breathe fire as part of an hourly show. Or looking closely at the incredibly intricate detail on the walls, decorations, ceilings and décor that, at times, makes it feel like you are sightseeing on a big budget film set, rather than browsing through a shopping centre. Even the security people in each casino wear different outfits to match the surroundings. 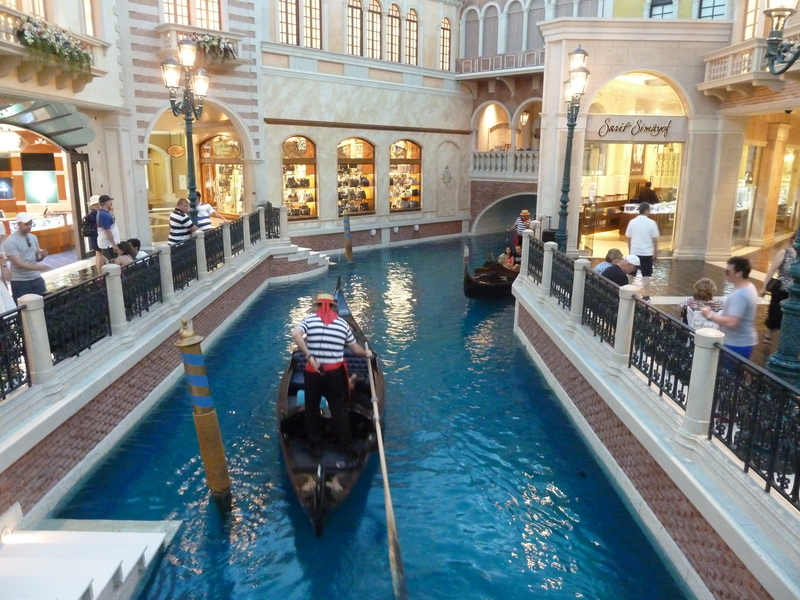 And they sing on the gondolas too! For people watching, soaking up the atmosphere, smiling at the power of the Bellagio’s water fountains as they thunder into the sky, watching the free shows such as the Sirens pirates at Treasure Island or marvelling at the fire and water show at the Mirage Volcano, there really was plenty to do – and on the whole, it doesn’t have to cost a penny. And, another surprise for me, was just how many families were in town on holiday to enjoy the experience with young children, even toddlers. 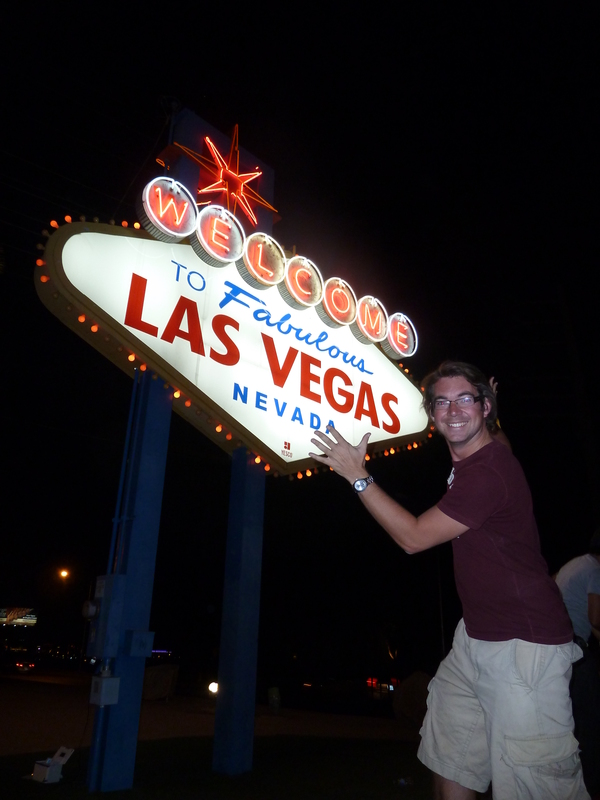 Infact, after hours – and miles – of walking around the desert delight, I think Ian hit the nail on the head when it came to describing what Vegas feels like. “It’s like being part of a huge theatrical production,” he smiled as we dived for another blast of air conditioning in one of the malls. He was right. It was so easy to lose all sense of reality here. 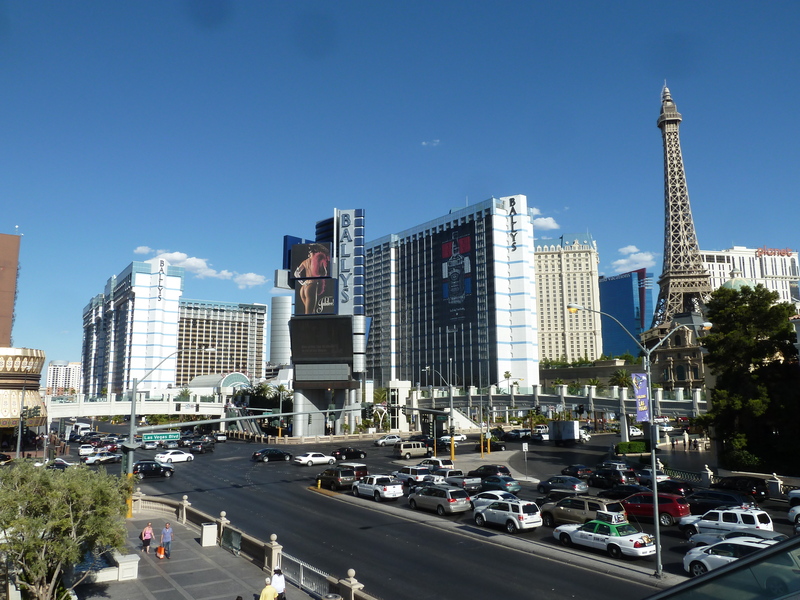 There are very few clocks around, so time is no issue – as Elvis said in his song about the place, ‘turning day into nighttime, turning night into daytime’ – is a Vegas speciality. And the casinos have a very clever way of making sure everything is on hand, should you need it. The fact that most resorts have a McDonalds, Starbucks, Burger King or Subway incorporated somewhere within them is, of course, great for convenience, but the simple fact is that it’s a deliberate ploy to keep you in their four (or many more) walls for as long as possible. The longer you are, the more you spend, the happier the casino boss is and the bigger the next construction project for the brand will no doubt be. You see, Vegas is a city built on gambling. It is only as stunningly impressive as it is, thanks to countless millions before me making a journey to the desert, and leaving with pockets and bank balances empty. It is a strange thought to look around and wonder at all the fortunes lost – and being lost at any one moment – which in turn will be put back into building bigger and even better resorts for future generations to enjoy. 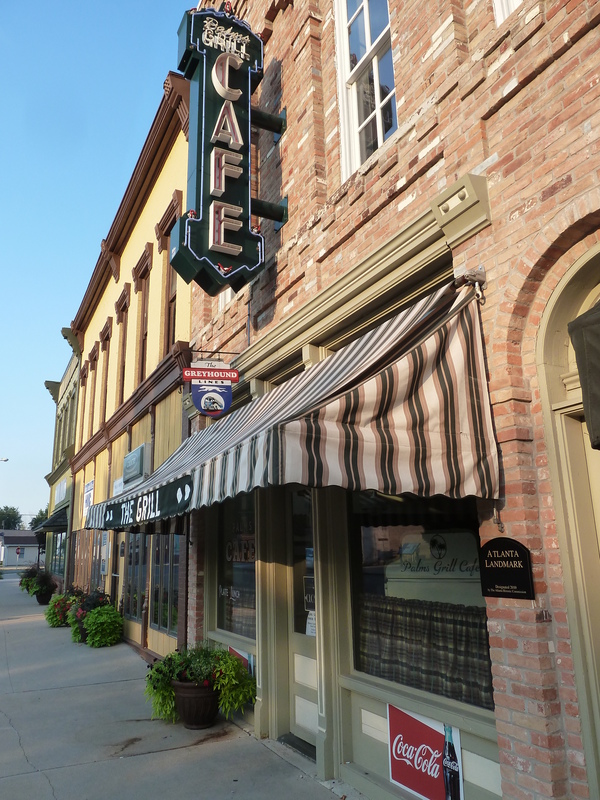 For this small part of Nevada, the recession is merely a word under ‘R’ in a dictionary. I could write for hours in depth about all that there is to see – in just a couple of days, we barely scratched the surface. 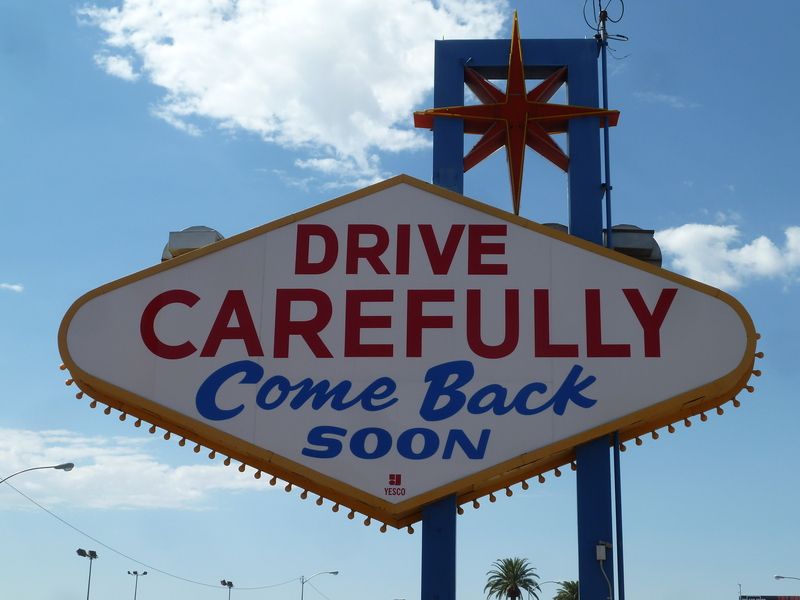 My top tips will always be to make use of the free parking underneath each casino, and not to be afraid of driving half a mile down the road to the next complex. It really is a deceptively huge place, with the scale and size of the hotels proving deceptive when it comes to walking around. 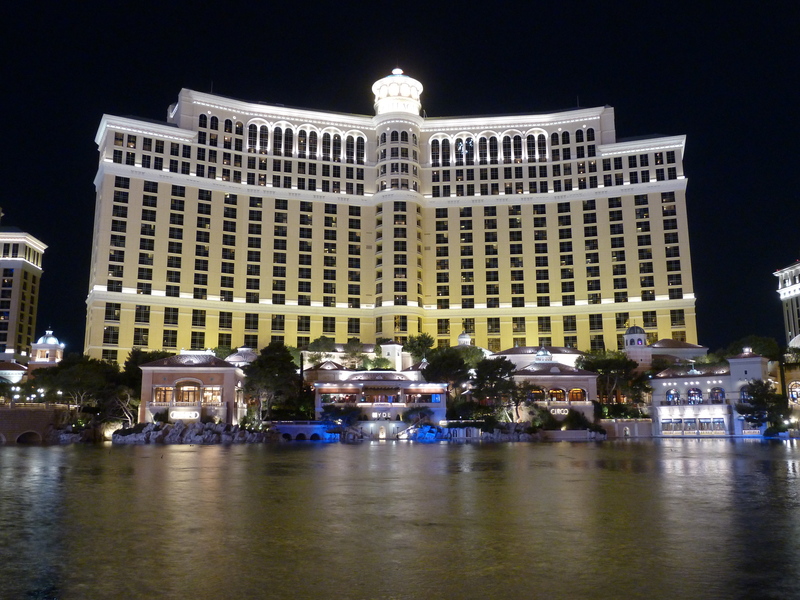 And I could write all about the free shows too, such as the fountains set to music outside the Bellagio every 15 minutes. But I did very little research about attractions like these, and to be honest, it came as more of an enjoyable surprise when I watched them. I wasn’t expecting the fountains to be powered so high by some of the most sophisticated water jet systems in the world – the ‘boom’ that comes out of the fountain as air powers gallons of water into the sky is impressive, echoing around the strip and rattling through your body. 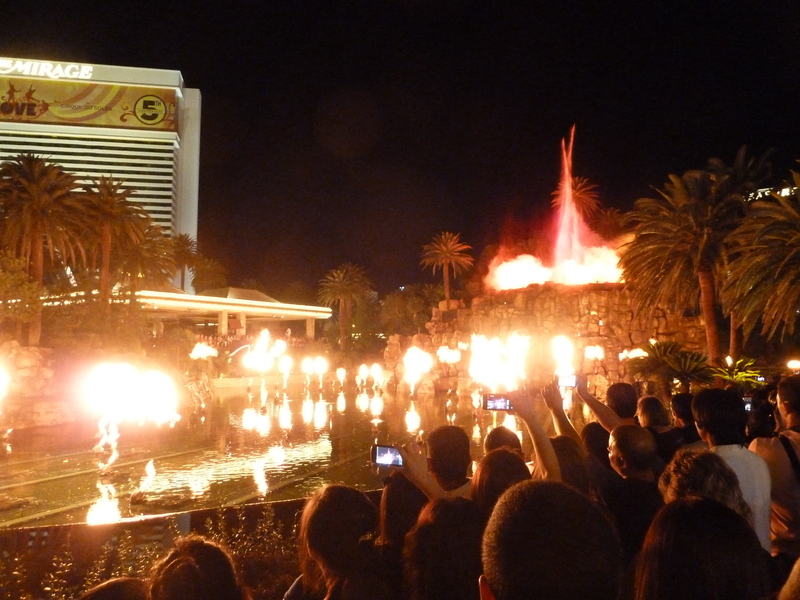 The impressive jets of fire from the volcano, which erupts every hour outside the Mirage at night, combined with atmospheric music and lighting, attracted hundreds of people even late at night, while the Sirens pirate show at TI, complete with cast, fireworks, cannons and a sinking ship, brought the feel of a West End show to the street – and for free, four times a night. 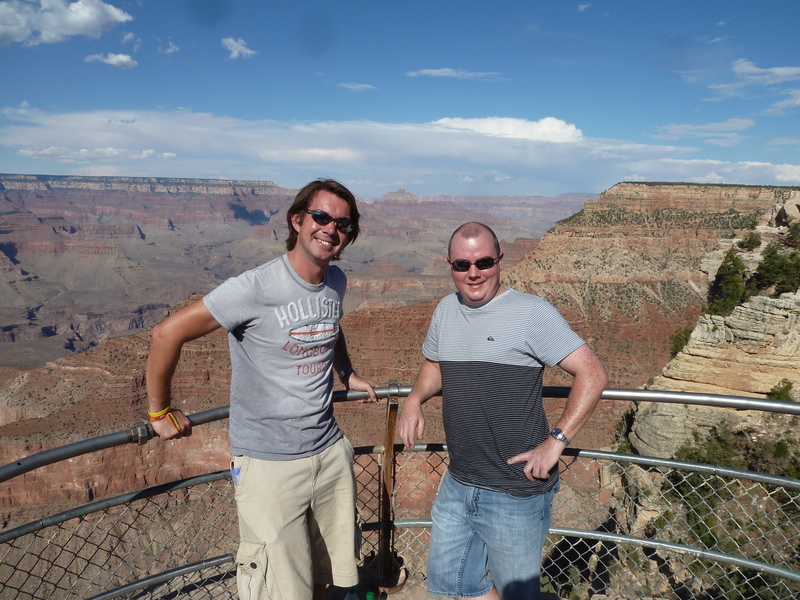 Visiting Vegas on a backpacker budget was always going to be tricky, but with careful planning in the time we had, we set a schedule of all the free shows and made our way along the strip seeing all that there was on offer. It was proof that you don’t necessarily need buckets of cash to visit the place, and infact, there were many people using the cheap accommodation to relax by the pool by day, and just take in the atmosphere at night. I did, of course, have a flutter, setting myself a tight limit of $50 to play with during my three nights in the city. With $40 still burning a hole in my wallet on the final night, it was time to hit the blackjack table in the Stratosphere before bed. Well, you can’t come to Vegas without at least having a little bit of a gamble, right? Half an hour in, I was holding my own. My piles of $5 had actually grown, and I’d hit blackjack a couple of times. I sensed I was having a run of luck, and started adding more chips to my stake. For a while, it went well, almost doubling my initial playing fund. And then I began to listen to the croupier, a lovely Chinese woman who I think enjoyed the experience as much as Ian and I, laughing along as we made jovial remarks about the way the hands were falling. But then, as quickly as the good run began, the bad luck came in, probably helped by her not so good advice. The dealer began hitting 21 on almost every hand, beating my 19s and 20s even when pulling up to five or six cards from the stack. By 3am, I was down to my last few chips. I put all of them on the table, apart from one. I promptly lost, but put my final remaining, white, $1 chip in my camera case. It’s true, the casino, in the end, will always win, especially here. But my last chip from Las Vegas wasn’t going back into the Stratosphere bank. 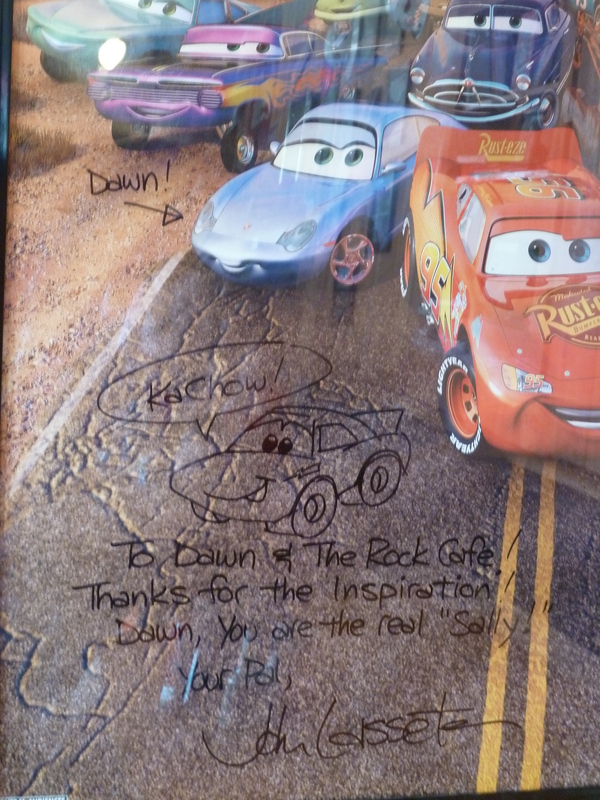 It was joining us on the Route 66 adventure, and coming home with me. I will…when I’ve saved up some more pennies! 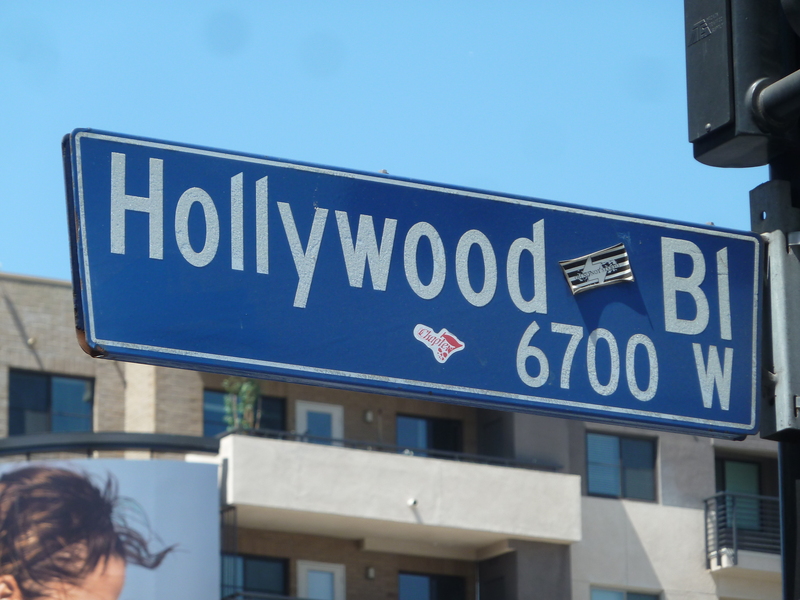 Los Angeles – home to Hollywood, the most famous people in the world, playground of the rich and the birthplace of American cinema. It’s the showbiz and glamour capital of the world, so it was only right that I spent my final night in Fiji with an acclaimed surfer, bikini model and filmmaker. 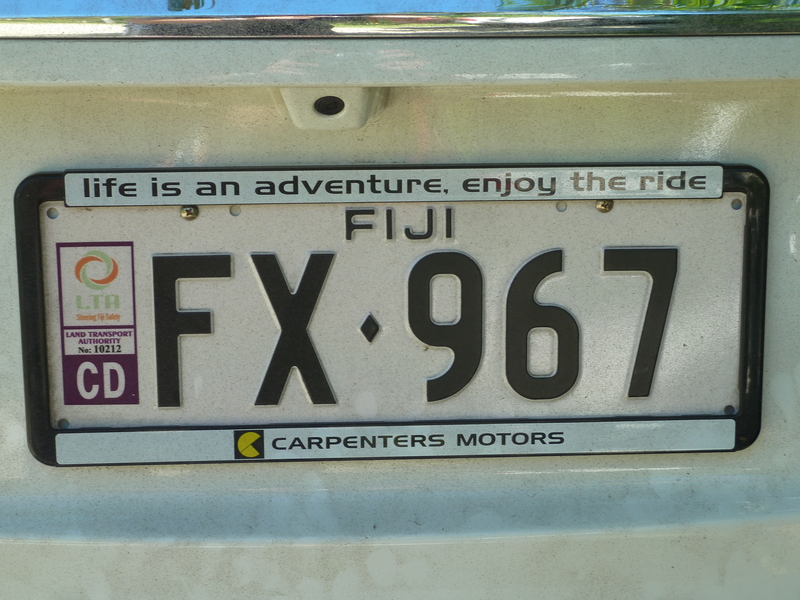 It wasn’t quite how you are thinking – she had kindly let me jump into her private taxi to the airport at Nadi after I, as usual, left things too late to get there in public transport. For once, I had a decent excuse, having spent around half an hour searching for my camera that had managed to go missing from the resort reception, where staff were supposed to be keeping an eye on it while the battery charged. I was quickly sent into a mild panic when I returned from a shower to find just the charger beside the sofa where I had left it. After much searching, hunting through my bags, shrugged shoulders from the security bloke who had been sat in the reception area the entire time, and almost a resignation that someone had helped themselves to my camera so close to the end of my trip, it mysteriously appeared again behind the reception counter. Quite what was going on I don’t know, but with the time approaching 6.30pm, a two hour drive to the airport, and a flight to America leaving at 10pm, complete with a recommended three hour check in, it didn’t take much for me to work out I was suddenly cutting it far too fine. That’s when I met Alison, who for much of the afternoon I had seen draping herself over the hammocks on the beach while her friend took photos. I’d presumed they were making some kind of publicity shots for the Beachouse, but it turned out they were working for the man who makes the hammocks. With just $24 remaining in my wallet, after barely eating anything aside from free provisions in an attempt to save myself from taking any more cash out from a machine, I knew $15 would be needed for a public minibus back to the airport. But with barely enough time to catch one, I was pointed in the direction of the two girls who were busy loading tonnes of stuff into a taxi. “I don’t suppose I can get a lift to the airport with you guys could I? How much is it?” I asked. I was told it had set them back $120, so explained my situation and offered all I had in my wallet. 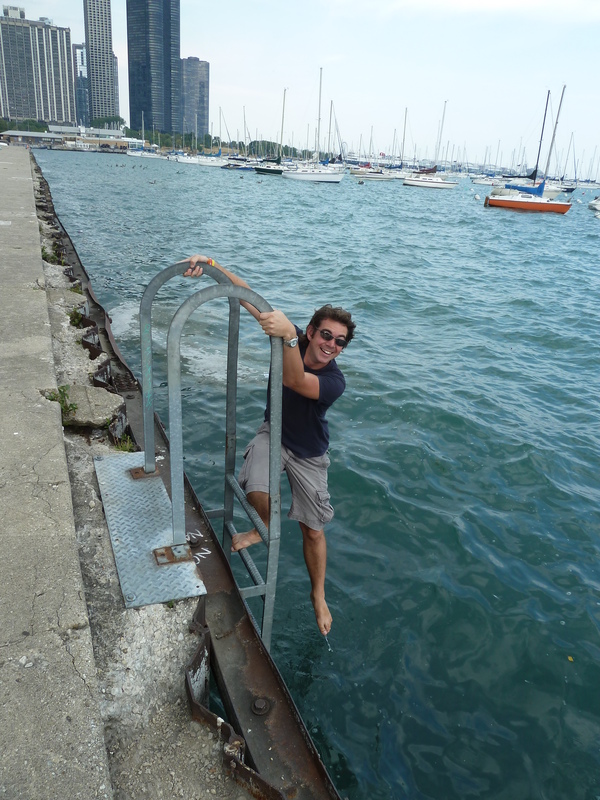 “Oh sure, just jump in its no problem,” she said cheerily. It turned out they are both working on a freelance basis, as a model and photographer, specialising in some incredible surfing and underwater photography. It included promotional shots for Mojo Surf in Byron Bay, Australia, where I learnt to surf, and we talked about Adsy and the guys there I got to know in the couple of days I spent with them in the water. The girls dabble in journalism too, and both have websites that are well worth checking out here and here. We spent the entire journey talking about our travels and line of work, looking at photos they had taken and finding out how they were managing to travel around from job to job, keeping costs and living expenses to a minimum. It was an exciting lifestyle, and one I could have talked about for hours, but sadly they were catching a flight back to their homes in Hawaii. “Look, don’t worry about the fare, we’d have had to pay it anyway. Keep the money in your pocket and get yourself something to eat in departures,” Alison said as we arrived at Nadi’s international terminal. I tried my best to at least give her a few dollars, but she wouldn’t accept it. It was a lovely gesture, and yet again another example of the kindness you can find from complete strangers when you’re in a tricky situation far from home. 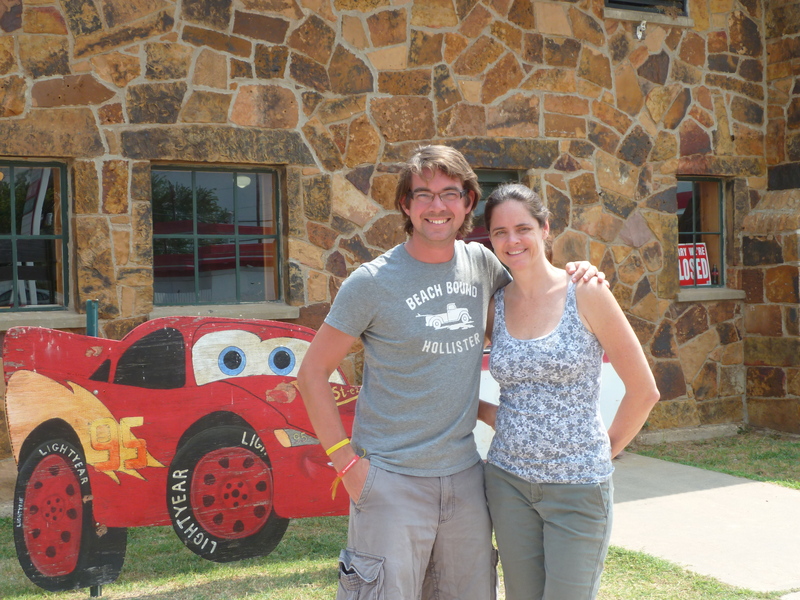 We had photos together before saying goodbye, promising to check out each others blogs when we find time. I left them as they made their way to the Air Pacific check in desk with the hope of avoiding another bill of more than $1,000 in excess baggage that they had been stung with on the outbound flight. And so I made my way to the Los Angeles check-in desk for the longest flight of my entire trip, a 10 hour journey across the Pacific Ocean and the date line to the west coast of America. 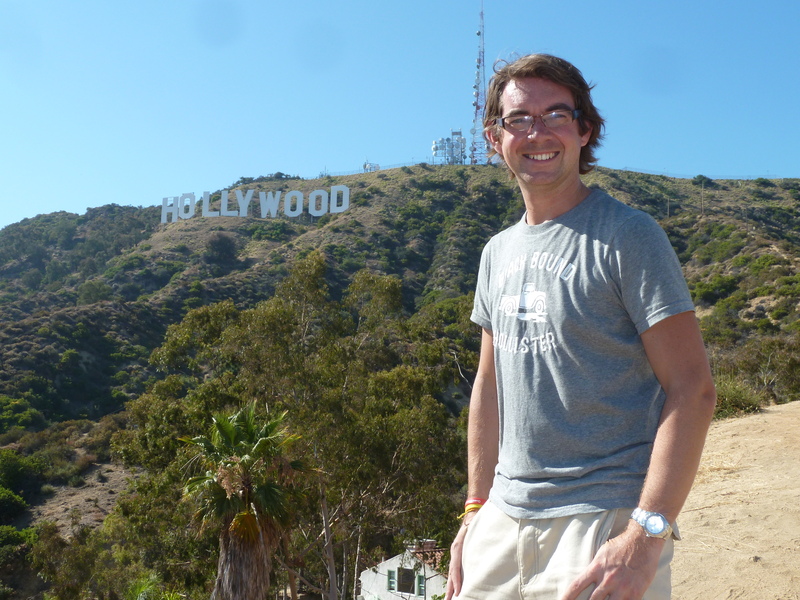 My original plan was to tour the west coast, going as far north as San Francisco, before flying from LA to New York to see friends and then back home at the end of July. 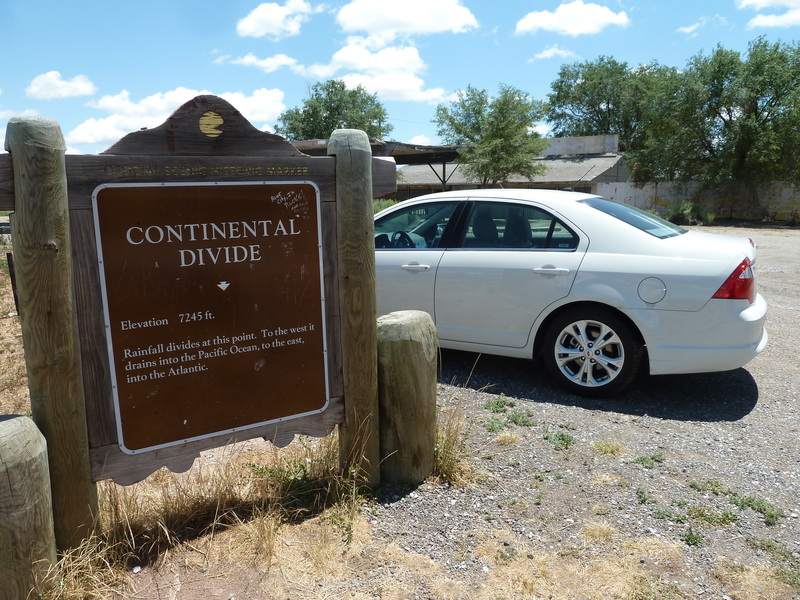 But then I had the brainwave of ending my travels with something special, eyeing up how much of the globe I had travelled overland, and thinking about how great it would be to drive from coast to coast across America. 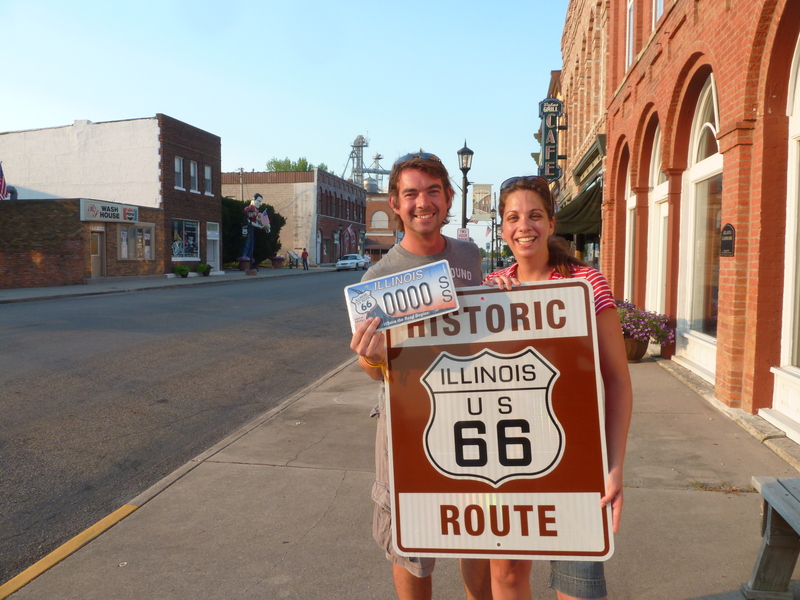 Route 66, the Pacific to the Atlantic, more than 2,400 miles along America’s ‘mother road’ to Chicago and then over to the east coast. 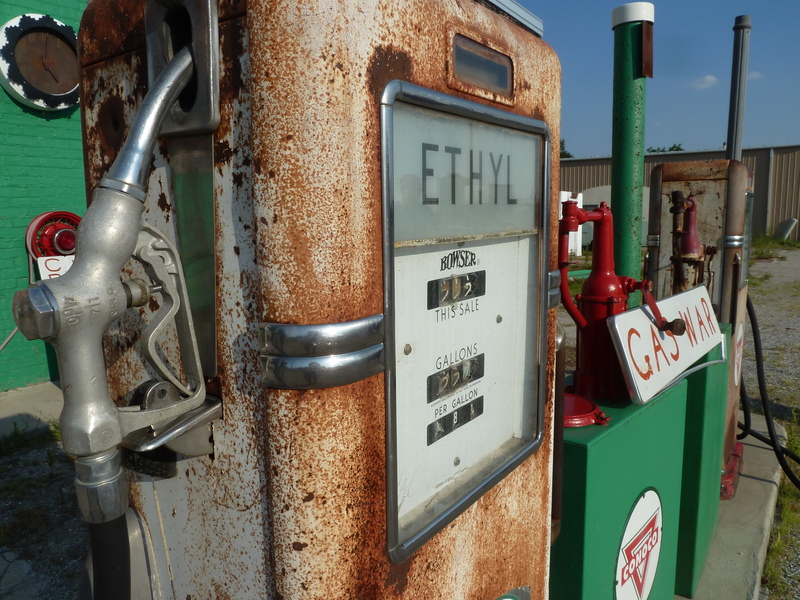 Its the stuff of dreams for any petrolhead, and I grew to think of it as a fitting finale to an epic adventure. I even had my friend Ian, from Melbourne, and who I met 10 years ago while working on a children’s summer camp in New York, interested in the idea. With just about enough funds, it was a goer. Stupidly, however, I managed to forget it was my dad’s 60th birthday on July 21, and had an awkward conversation a couple of months back where I had a slightly upset father who believed I’d snubbed him for an extra week on my trip. I had to explain myself and how I’d thought he was only 59 this year – well, he does look good for his age (I know he reads this!) – and being out of the loop on the other side of the world, events back home had passed me by. With my sister Amy working for travel company Thomson in Cape Verde, dad told me how he wanted us all to be together for a week over his birthday. His idea was for us all to fly out to the island on July 19 for a week of sun, fun and relaxation together. It would be the first time in around two years we will have all been together, and a fitting way for us all to spend his birthday together. The upshot of all this was that I had to shave some time off the end of my travels to get home earlier. I had to juggle around my plans to get back to the UK in time for the flight, meaning I am now flying out of New York on July 17. 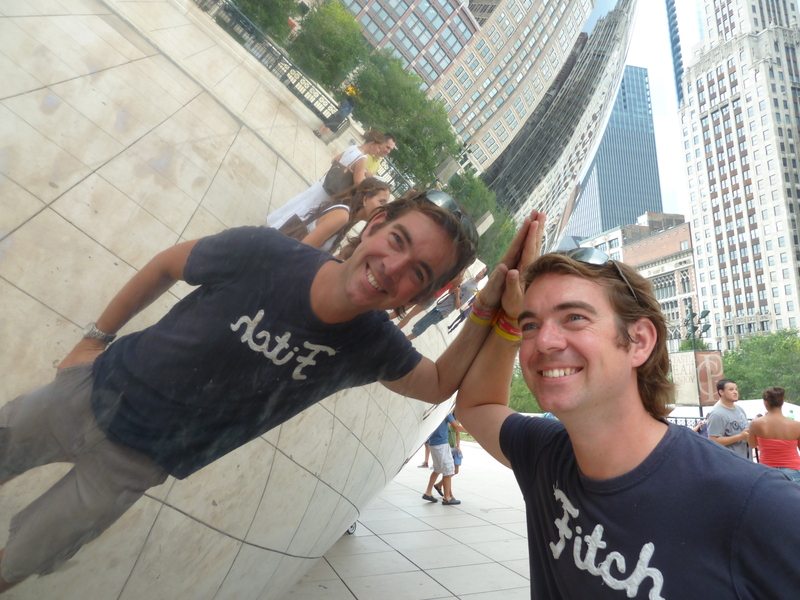 To do this, Fiji was cut from two weeks to six days, my time in the States was reduced by a week, and it would mean less time with my best mate Dan, wife Denise and my godson Nathanial in Connecticut before my flight back to London. I was determined to still do everything I had planned, however, even if it did mean keeping to yet another tight schedule. 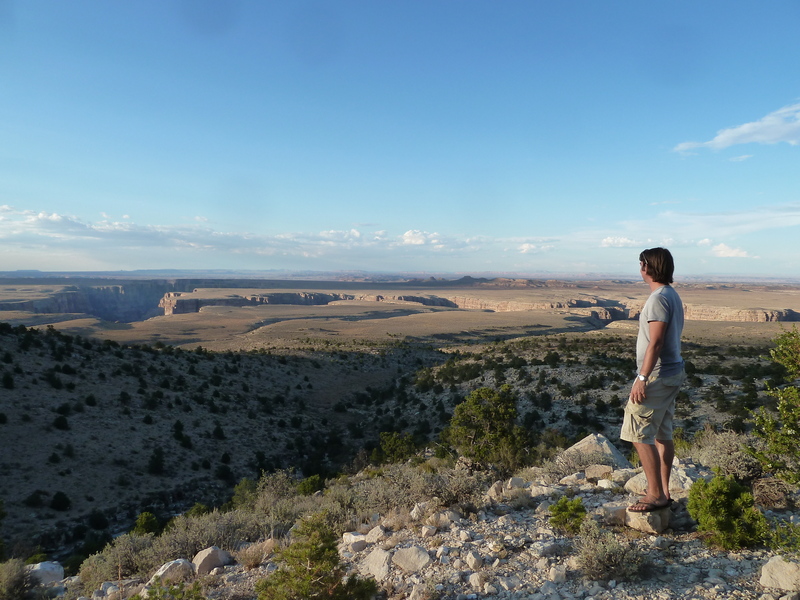 I worked out the road trip of a lifetime was still possible, and my overland adventures that have become a bit of a theme of my journey would continue. 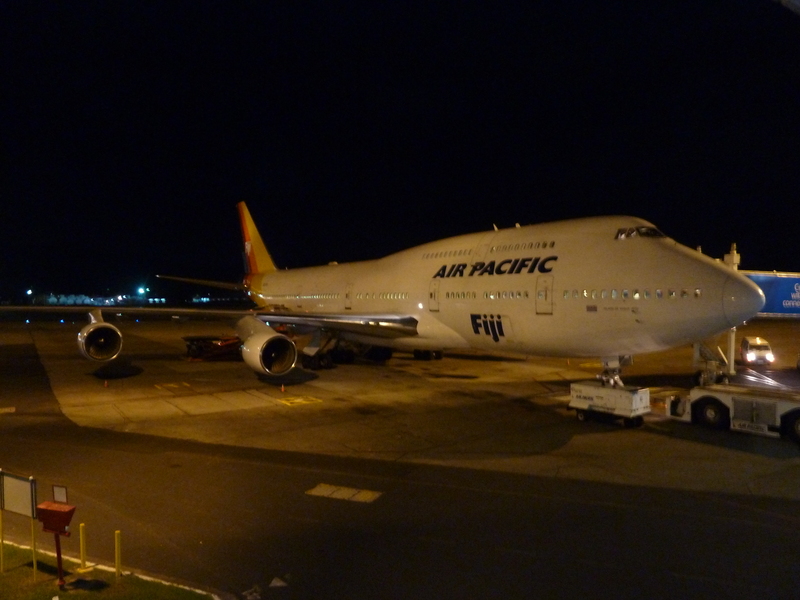 I boarded the Air Pacific jumbo jet at Nadi knowing that as well as flying substantially closer to home, I was about to become a time traveller. The quirk about going fully around the world is that you gain time when you cross the International Date Line in the Pacific Ocean. It means you don’t lose any travel time, and even stranger, you arrive in America before you have even set off for the airport. 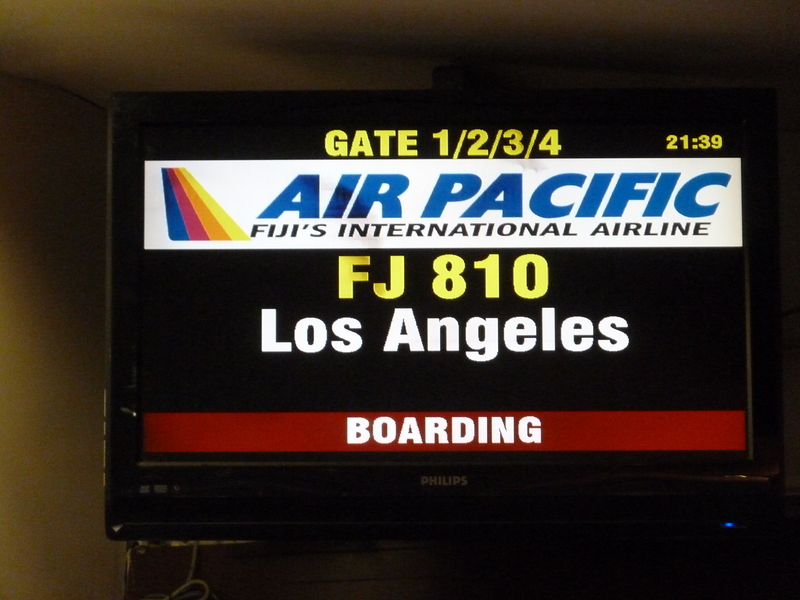 Touchdown in LA – before i’d even left my Fiji beach! My 10pm flight from Fiji on the Tuesday landed at Los Angeles International Airport at 2pm on the same Tuesday afternoon. It would mean a single day lasting a staggering 42 hours, and with only a little sleep on the flight, I arrived in America with that horrible zombie feeling. 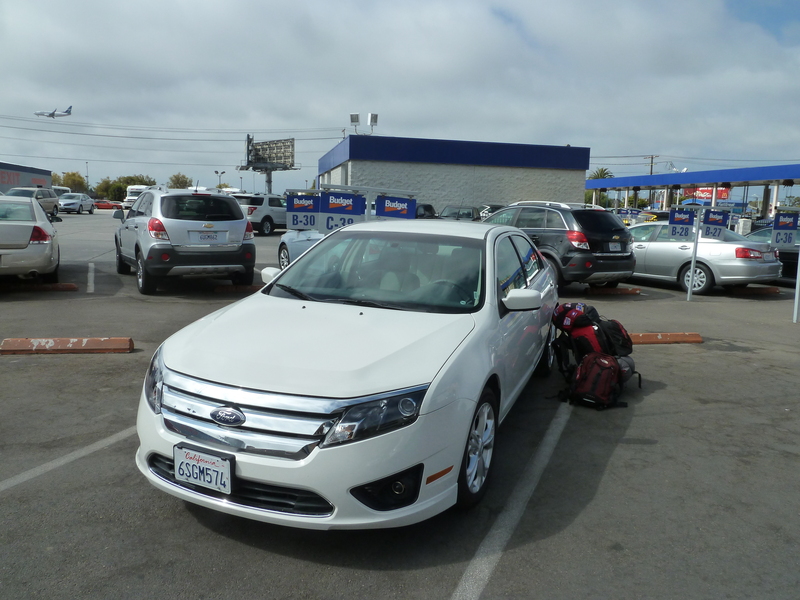 Worse still, arriving at the Budget car hire centre at LAX, I had yet more problems with my bank thanks to the ongoing restrictions HSBC have put on my account after assessing I was potentially a victim of card cloning. With a £200 limit on transactions in any 24 hour period, the £400 hold that the hire company needed to take from my account wouldn’t go through. Neither would they let me ring the bank from the office to get them to authorise the transaction. Instead, it was a search for some free wifi at the hotel across the road, where yet again Skype got me out of a sticky situation. “We’ve given you a complimentary upgrade,” said the assistant behind the counter before directing me to a parking spot outside. And there it was. Gleaming white, sparkling in the California sun, and a lot bigger than the budget economy car I had booked for the trans-America drive. 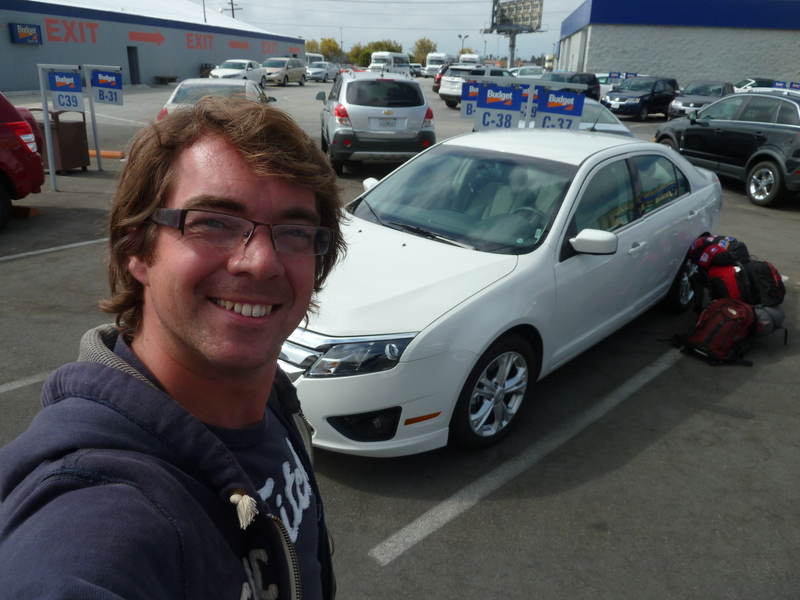 It’s a Ford Fusion, and for the next two weeks, it will become home for Ian and I as we make our way east. 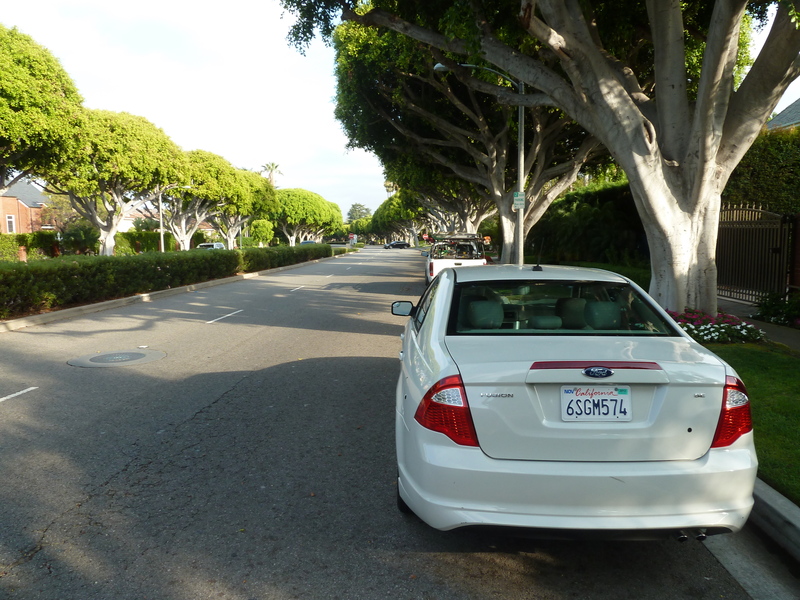 I stepped inside the car, put the air conditioning on full blast, and tentatively slipped the automatic gearbox into drive, inching my way out of the car park and onto the streets of LA. 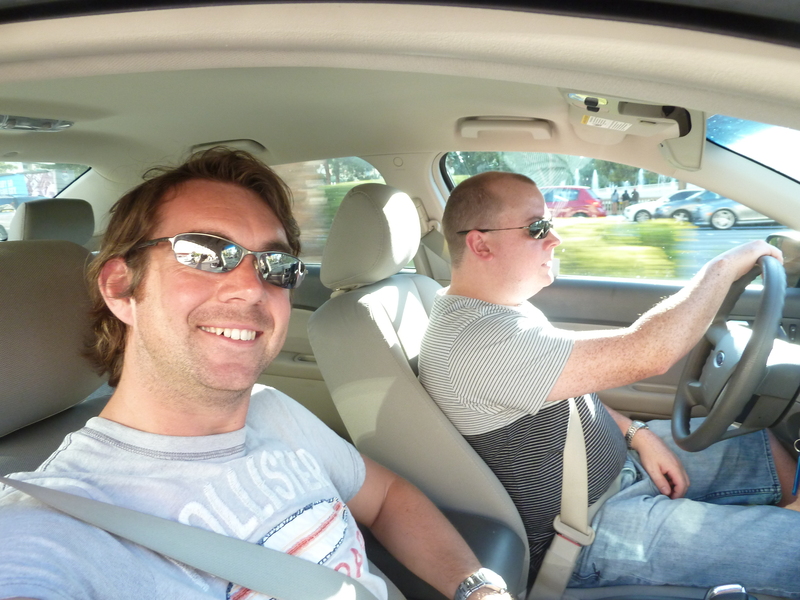 Being a fairly regular visitor to the States, I quickly got the hang of driving on the roads again, and headed to a McDonalds (where else?!) for some free wifi, booking myself into a backpacker motel near the airport. It was a slightly strange place, with its fair share of odd people, but with a pool, free breakfast and dinner, unlimited coffee and wifi, all for just £12 a night, it was too good to turn down. I booked in for three nights, dumped some belongings and set off to explore the city. 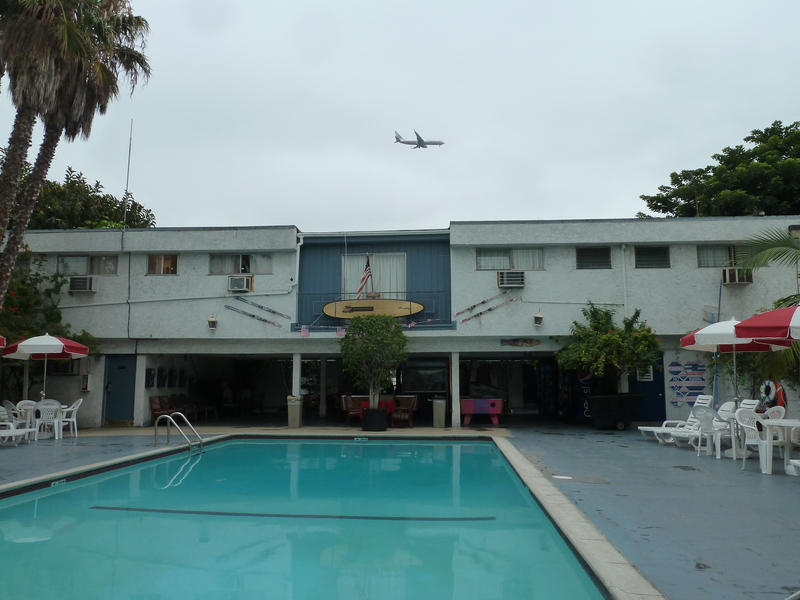 My hostel/motel…and a plane going to nearby LAX. And what a city it was. 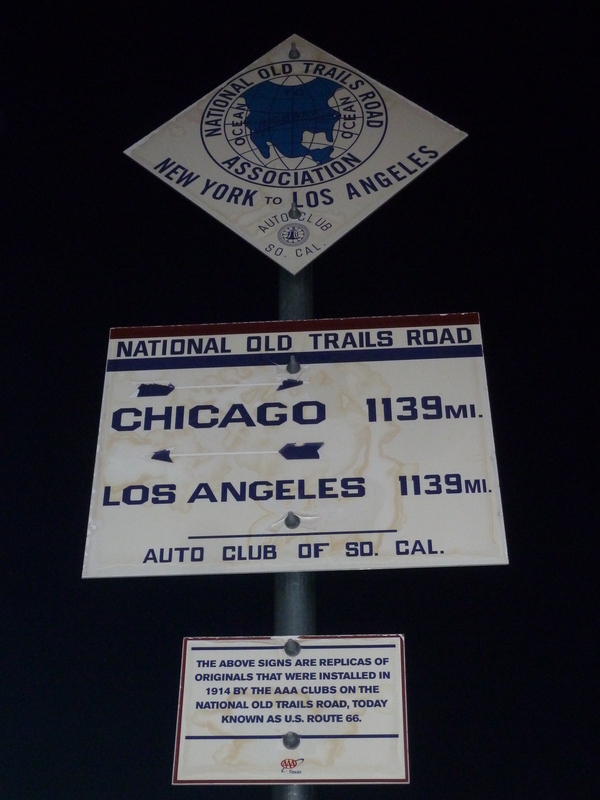 My first night I spent getting my bearings, working out the Interstate system and how to get around to the various famous parts of LA. 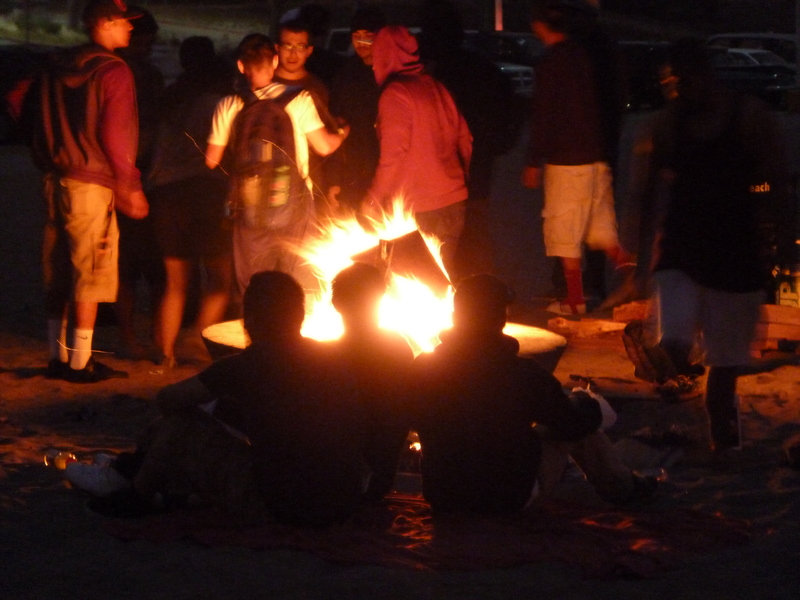 I headed to the beaches, to find hundreds of people preparing for Independence Day with bonfires and beers. 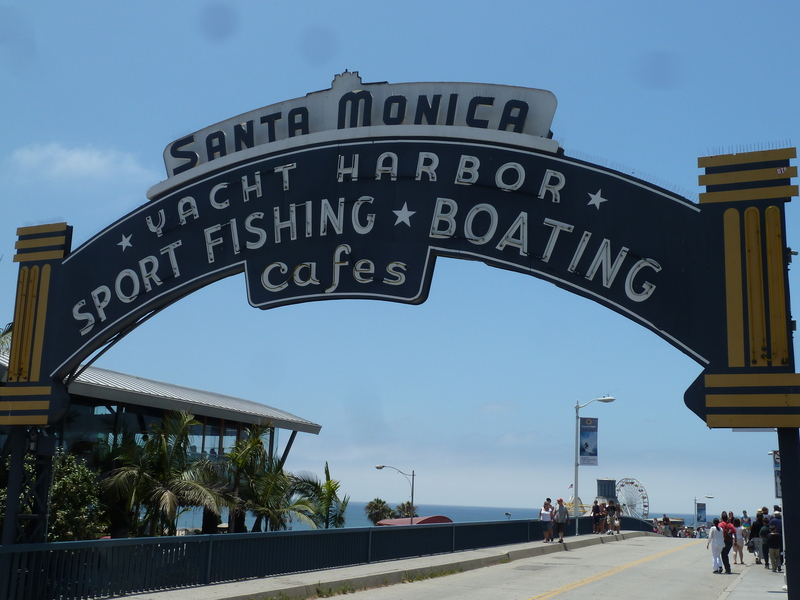 The famous Venice and Santa Monica beaches and resorts were thriving with people enjoying the start of the holiday period. 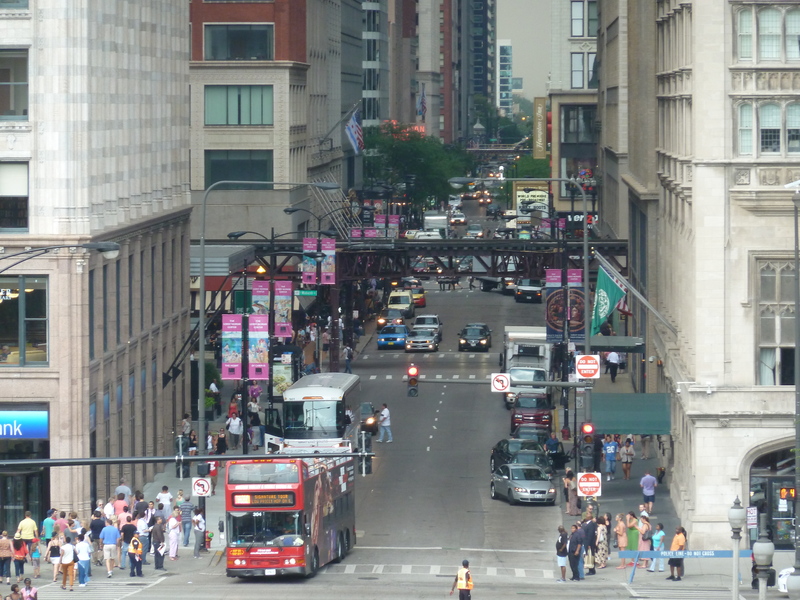 There was very much a relaxed atmosphere about the city. It left me with my own problem about what to do for Independence Day, a day when America can celebrate all that is good about being, well, American. I searched the internet and narrowed it down to a couple of options to experience the day. 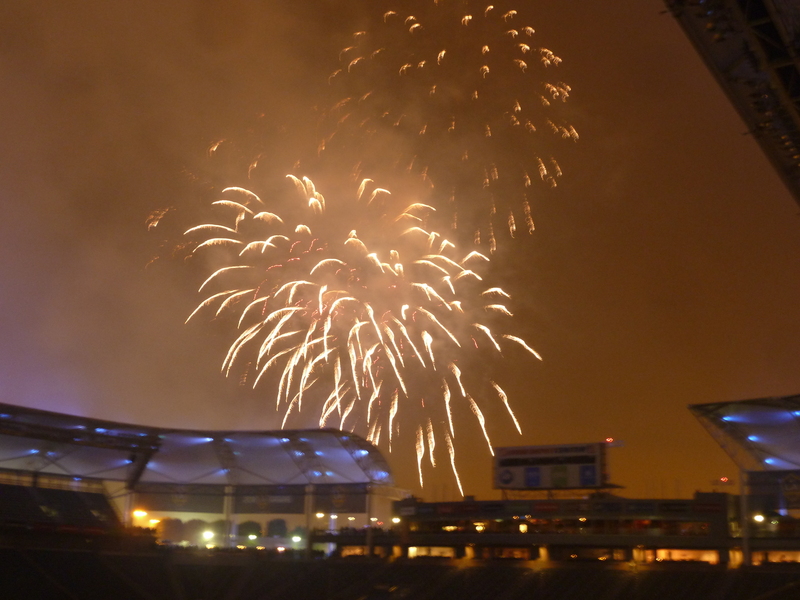 It was either a night at the LA Bowl for some kind of America-fest, with what was described as the most patriotic night and the most spectacular fireworks in California. Or there was a baseball game between the LA Dodgers and Cincinnati Reds. I could get a cheap ticket online, and was just about to book, when another sporting fixture flashed up on my screen. 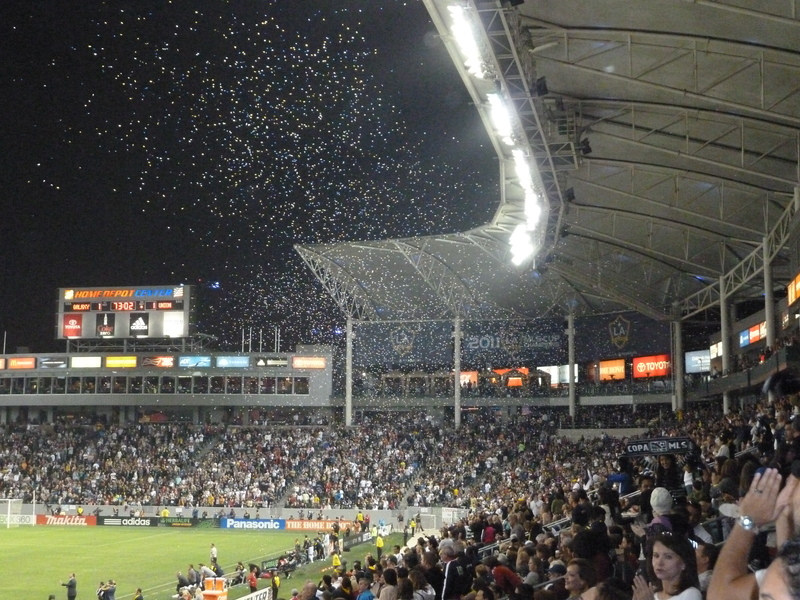 It was for LA Galaxy, home to David Beckham. Now, I’ve not had much luck when it comes to watching one of England’s greatest ever players in action in the flesh. I missed opportunities when he was playing back home, and so thought I would get the chance to see him play when I watched Real Madrid take on Espanyol at the Bernabeu a few years back. Unfortunately, he managed to get injured again just before the game, and while it will always go down as one of the most exciting games of football I have ever seen – a dramatic last minute 4-3 win that saw Real go top and win the La Liga as a result – I resigned myself to the fact I would probably never get to see Becks play in person. So, thanks to a $70 ticket being offered for just $19 online, and free Independence Day fireworks afterwards, my mind was made up. I would spend the night celebrating US independence from British rule by watching the most American of sports. Soccer, or football to give it the proper name. Before that however I had my sights set on seeing possibly the most famous sign in the world, in perhaps one of the most famous neighbourhoods in the world. 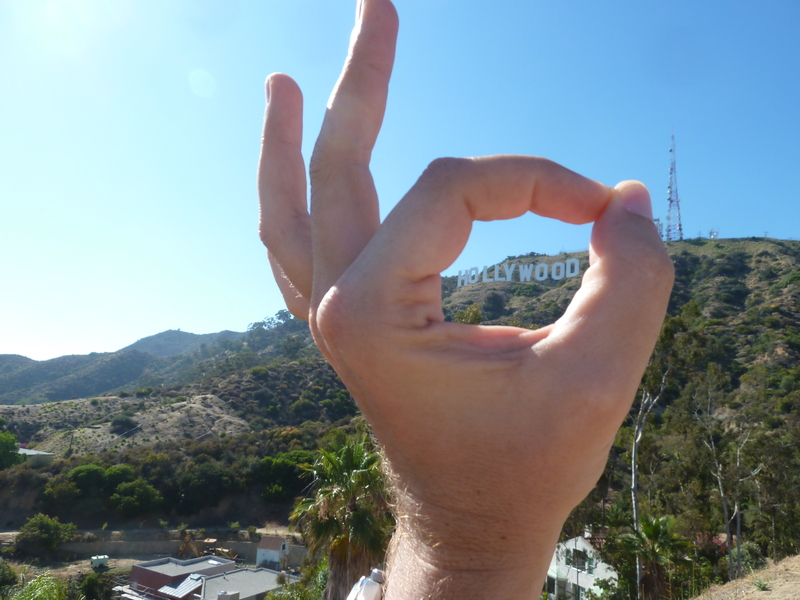 The Hollywood sign in, erm, Hollywood. While picking up the car keys from my room, I said a quick hello to a tall lad with glasses, who asked if I was going to the beach. I told him I wasn’t, but was off to explore LA. 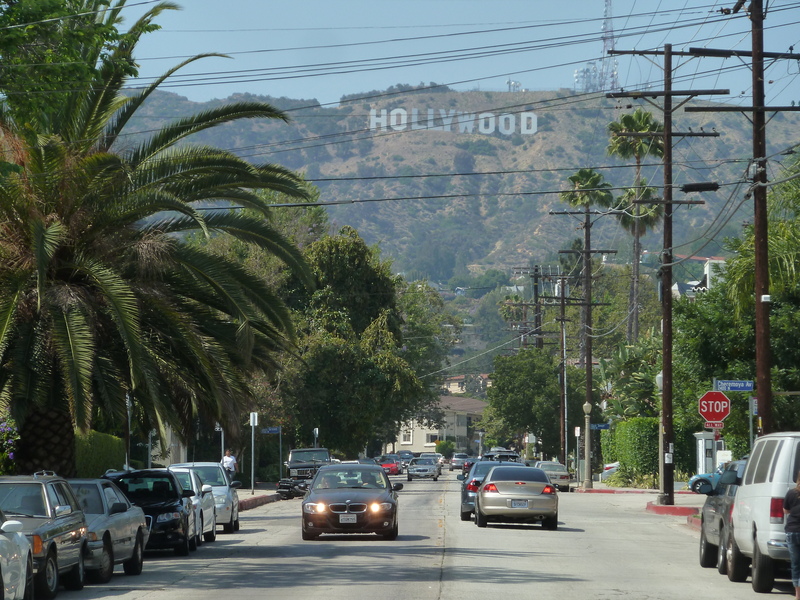 “I’m on my way to Hollywood, for a look around. You’re welcome to come along if you fancy the ride out,” I said, expecting him to say no. Instead, he said he’d love to. His name was Tommy, who it turned out was quite a quiet bloke and who was slightly awkward to keep conversation flowing with, but he was nice enough and it was company for a few hours. He was from Washington state, and in LA searching for work in IT. 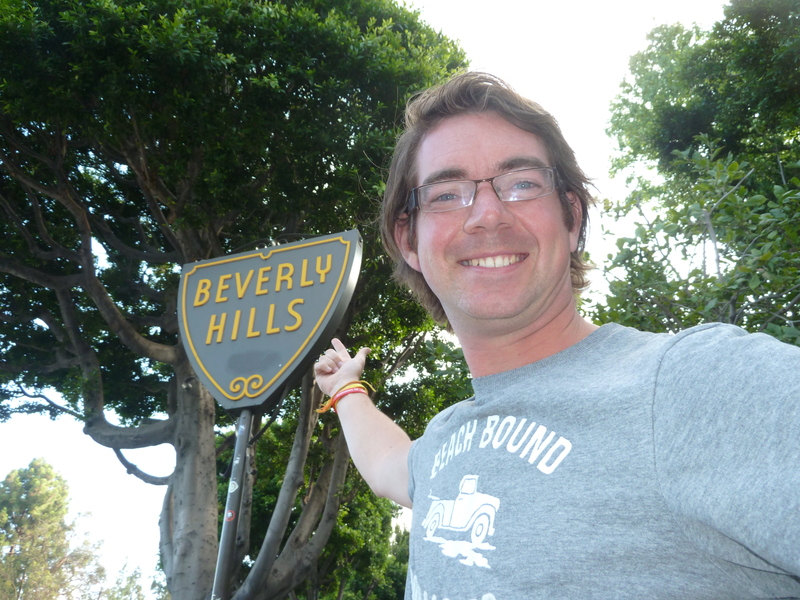 Yet he had lived in LA for years, and had never been to visit the famous sign in the Hollywood Hills. 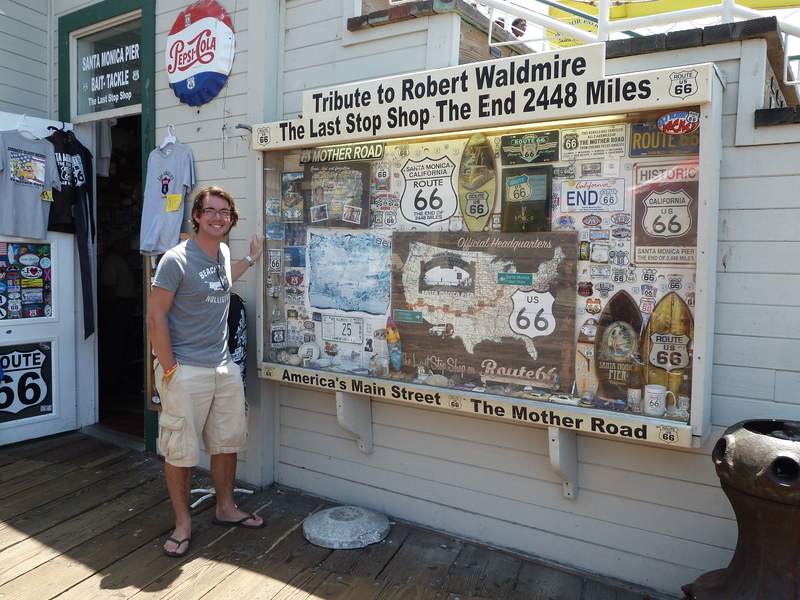 “I can’t help but laugh at the irony of an English bloke, on Independence Day, taking an American bloke to go and see one of his country’s most famous sights,” I laughed as we climbed the dusty pathway towards the huge white letters. 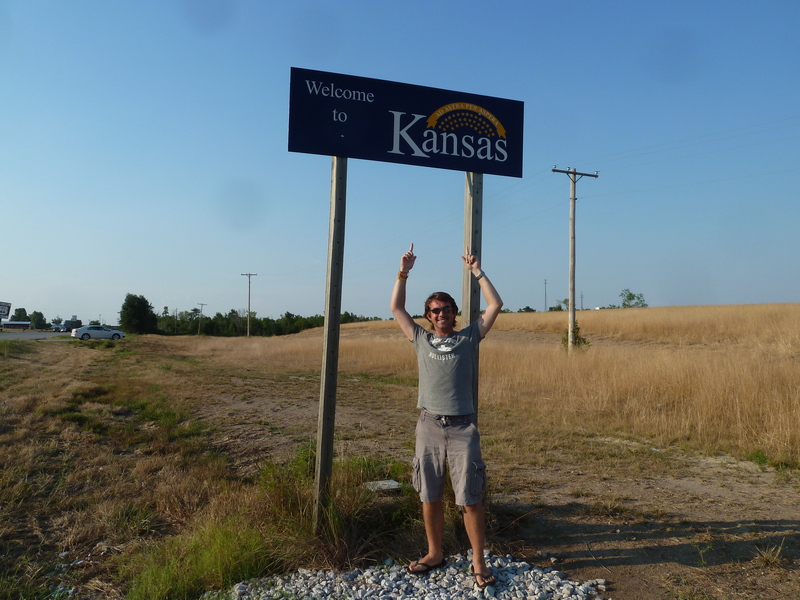 The sign was one of the sights I had been most looking forward to seeing in this part of America. It is something we have all been brought up with, and a sign we see thousands of times, usually without realising in cinema and television. 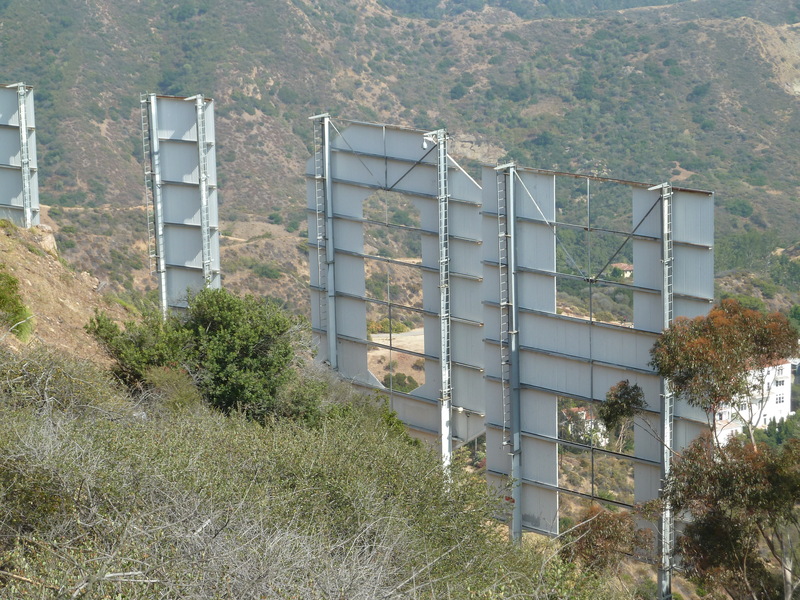 Interestingly, it was erected in 1923 and originally said “Hollywoodland”, the main purpose to advertise the name of a new housing development in the Santa Monica hills. But for whatever reason, the sign was left up and became something of a novelty. The sign isn’t the original, however. By the 1970s, that had fallen into a state of disrepair, and while various pranks have been played over the year where letters have been rearranged or covered up, the sign, having bits of letters broken or missing, once actually read “Hullywod”. We came across a steep side track, where two guys were scrambling up to another path. We followed, eventually catching them up. I got talking to one, wearing a red shirt, who was called Justin. 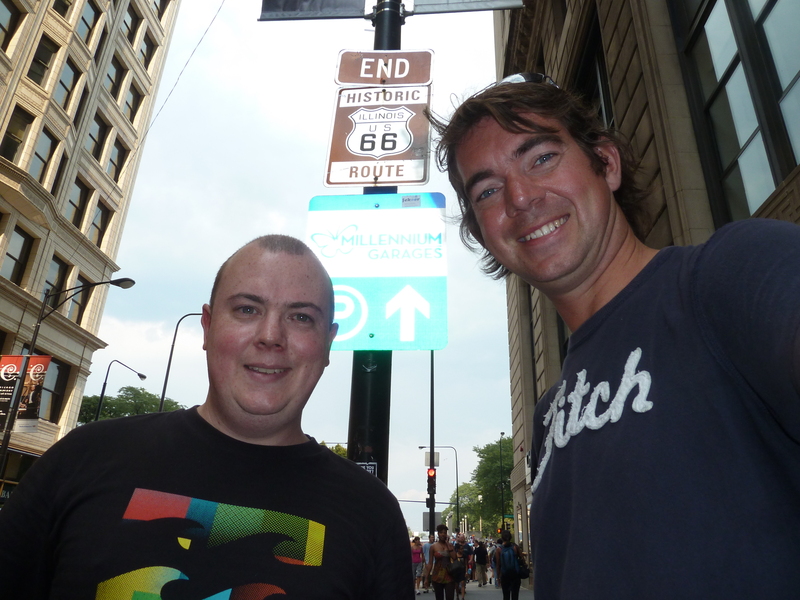 They were visiting the city from another part of America, and were excited about getting so close to the sign. The track ended up on a former road that winds its way up the hillside, towards a communications mast at the top. At this point we still couldn’t see the sign, despite approaching the peak of the hill. We did, however, come across yet another dusty track to our right. 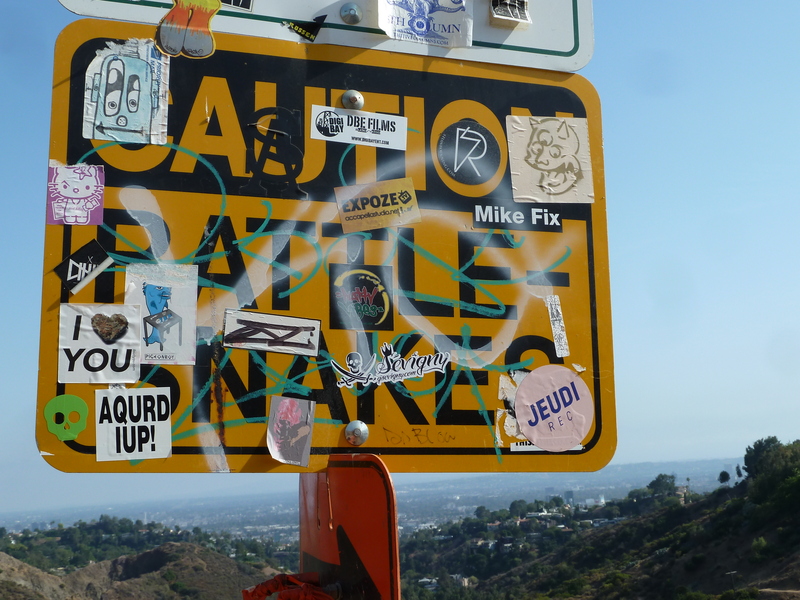 We followed it, climbing up another rocky pathway and discovering a plaque dedicated to Hugh Hefner, clearly his favourite lookout over Los Angeles which sprawled out to the horizon in front of us. To our left, we could see a fence, and just a few metres below us, the giant ‘H’ that starts what is probably the most famous sign in the world. “Lets go down there and touch it, I’ve always wanted to do that,” said Justin, who we’ve only just met. I wasn’t too sure what the legal situation was when it comes to approaching the sign, but there seemed to be a worn track down the hillside towards the six-storey high letters so presumed it must be ok to get a closer look. But then my conscience got the better of me, after all, there was a fairly hefty steel fence along the side of the road that I had somehow found myself on the wrong side of. 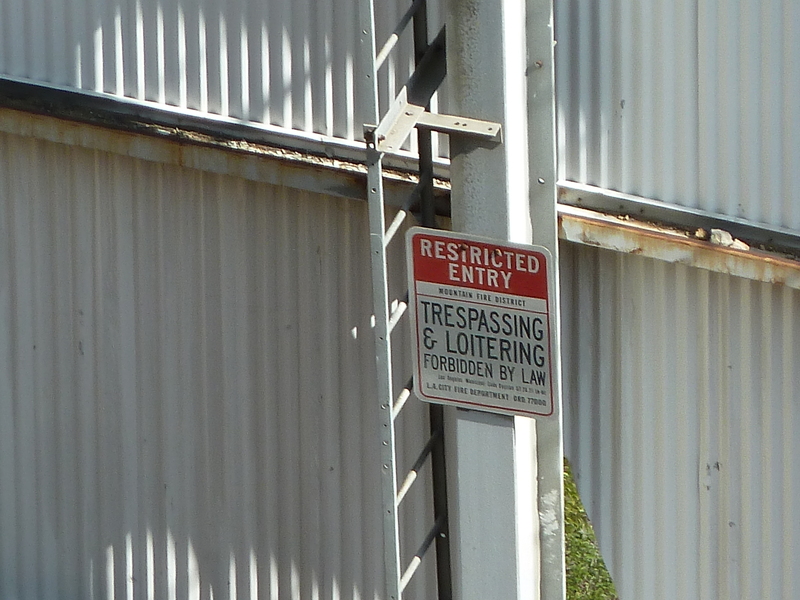 In the distance I could see some form of warning sign, and a security camera that was pointing in our direction. Call me a chicken, but I decided the risk of arrest wasn’t quite worth touching the huge white metal letters. Besides, I quite like America, and a ban on visiting the country after a spell of bird for touching one of their icons would be really annoying. 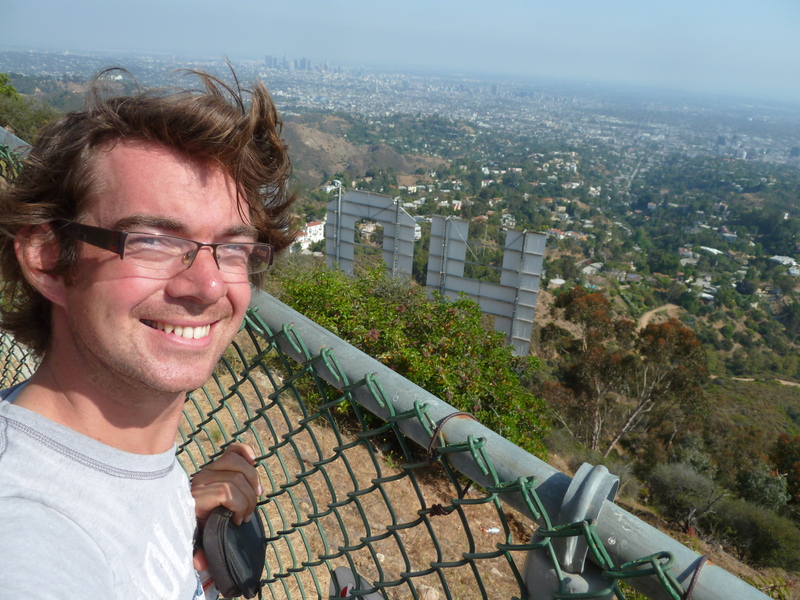 So I turned around and headed back for the relative safety behind the fence, watching Justin and his friend make their way down to the sign and touching it, making a metallic sound that echoed around the hilltop. They made their way up, laughing and joking about their achievement, and leaving me regretting not making the descent with them. Back on the right side of the fence! Then we all saw a police or ranger van pull up at a bridge far below, blocking one of the return tracks to the car park. Justin and his mate decided that they had better leave on a separate route, and took a trail through the bush back down to the bottom. Tommy and I made our way around the normal way – after all, we had done nothing wrong. I will never know if the other two got arrested, as the last time I saw them they were stumbling down a rocky path, but I do know more about security at the sign having looked it up on the internet. As well as banks of CCTV cameras that I could see at the top, the sign is also equipped with motion sensors and infra red devices. Once they are triggered, the LAPD helicopter is automatically dispatched, and people are usually yelled at from a loudspeaker onboard and promptly arrested at the bottom of the hill. I’m just glad I didn’t take the risk! Looking out for rattlers on the way! 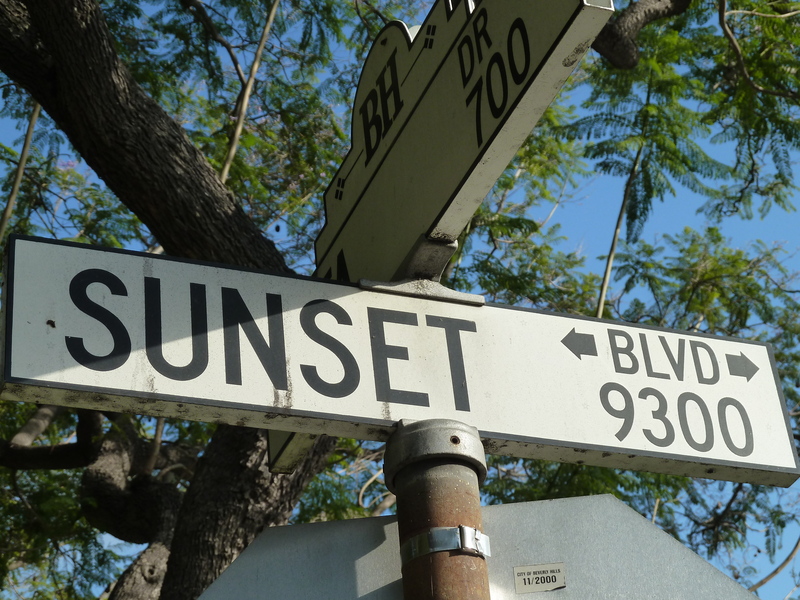 After spending most of the afternoon looking out over LA and at nine huge white letters, I headed back to the hostel to drop Tommy off with a long drive down the Sunset Strip and along Sunset Boulevard and Santa Monica Boulevard to the main interstate. 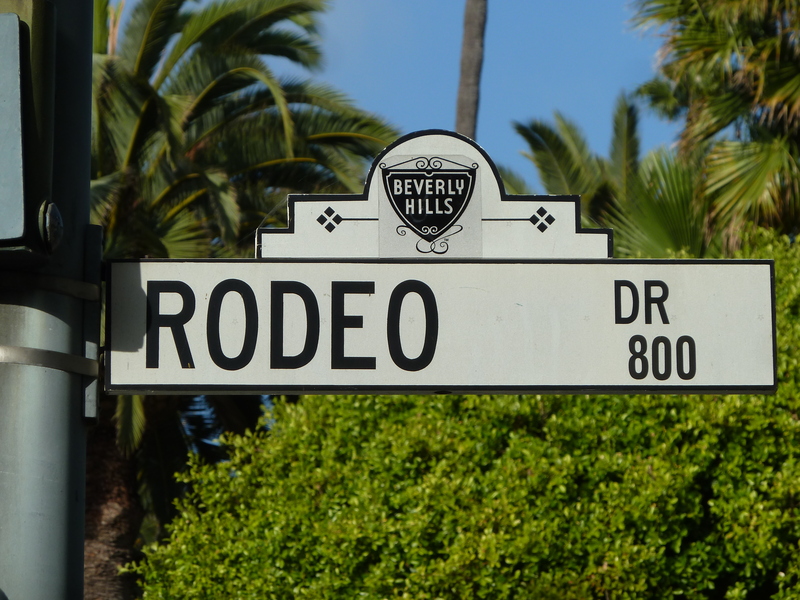 It doesn’t quite feel real to be driving along such famous streets, but the plush gated houses along both sides of the road in these incredible neighbourhoods are a reminder that the world’s rich and famous call these streets their home. 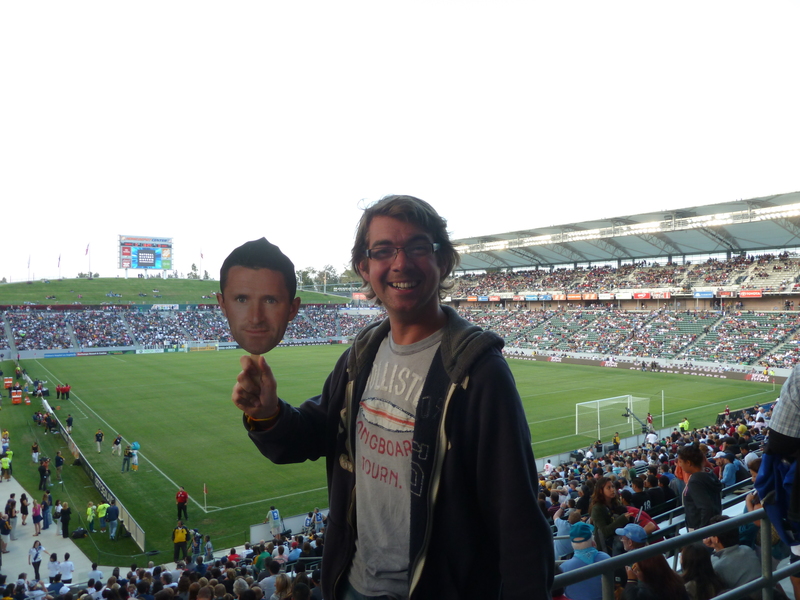 Speaking of rich and famous, it was time to travel to the Home Depot Center Stadium to watch David Beckham in action for LA Galaxy. 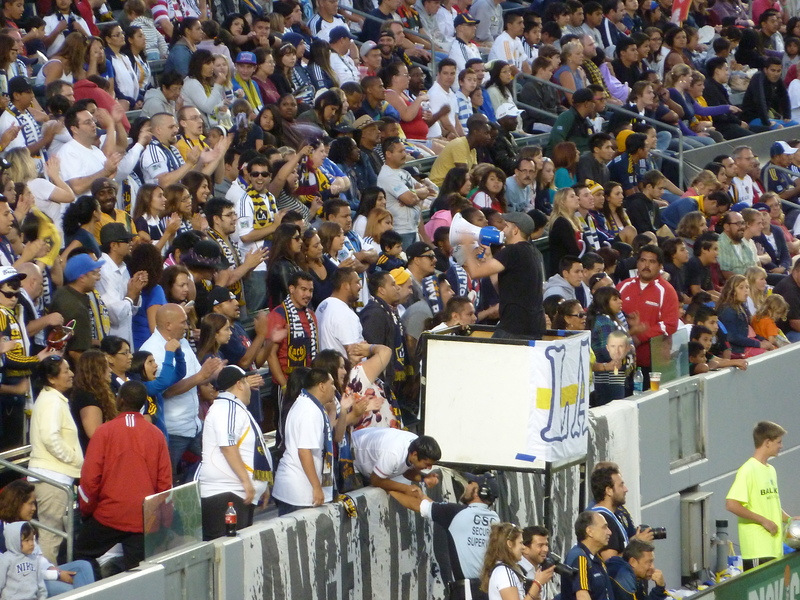 The stadium was smaller than I imagined, and it was festooned with Beckham memorabilia and photos, while almost everyone wearing a Galaxy shirt had his named emblazoned on their backs. He really has become something of a cult hero over here, as well as back home. 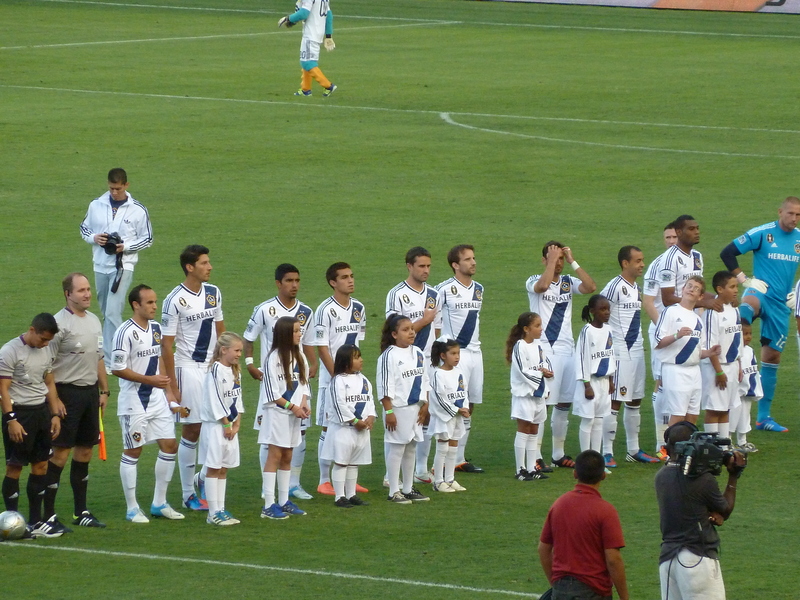 I arrived just in time to see the teams come out onto the pitch, amid much American fanfare and waving of flags. 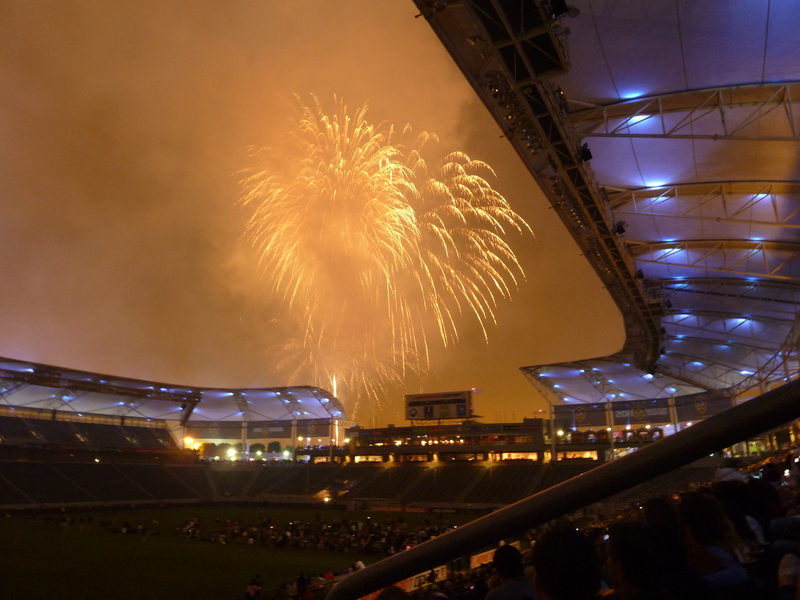 Fireworks were launched from the pitch, and everyone stood for the national anthem. A Saturday afternoon game at Blundell Park for Grimsby Town versus Fleetwood this was not. After scouring websites for team news, checking out injury pages, even looking at the David Beckham fan sites to check he hadn’t been dropped or injured before the game, I looked for the familiar figure on the pitch. Except he wasn’t there. I checked the bench. No Beckham either. Others around me were asking the same question, including the family next to me who had turned up especially to see him. “The same thing happened to me in Madrid a couple of years back,” I told them, before being accused of being the bad omen for the night. And I was – despite my checks and research, Beckham had been banned after picking up a yellow card in the previous match. Instead, I sat through one of the most boring games of football I have ever witnessed (quite a statement from a Grimsby fan!) 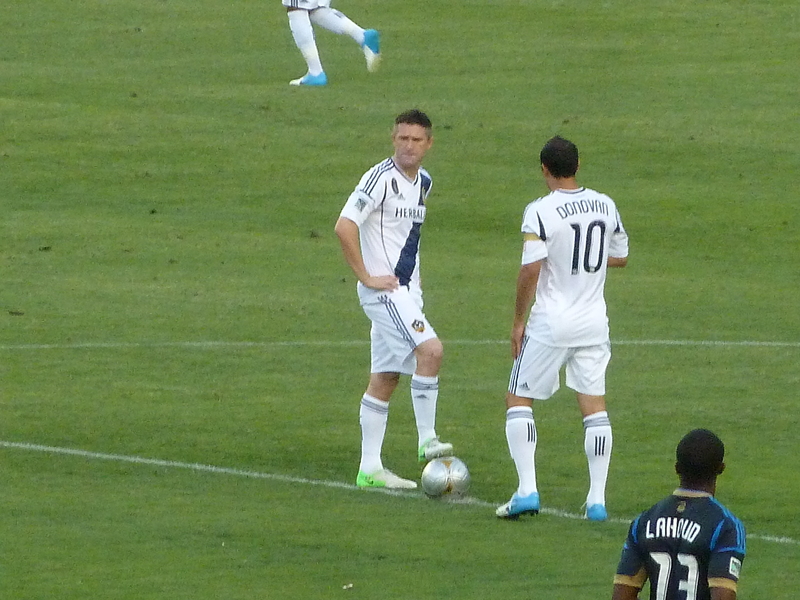 where even the likes of Robbie Keane and Landon Donovan failed to impress. In addition, sitting with American fans while watching the sport is a completely different experience to anything back home. It seems the actual action on the pitch is just a side show – the main reason for people attending the game is to try and eat and drink as much as possible within the 90 minutes of play. I swear some people see it as a challenge. A couple in front of me brought an entire coolbag full of pre-prepared meats, salads, bread and pasta. A full evening meal, to eat while watching football from the stands. And you can forget a meat pie and a pint here – it was all about candy floss, churros, nachos and hot dogs. Basically, baseball meets football, America meets England and everyone leaves the ground three stone heavier than when they went in. On top of all that, and not content with the action on the pitch, the crowd tries to entertain themselves too. 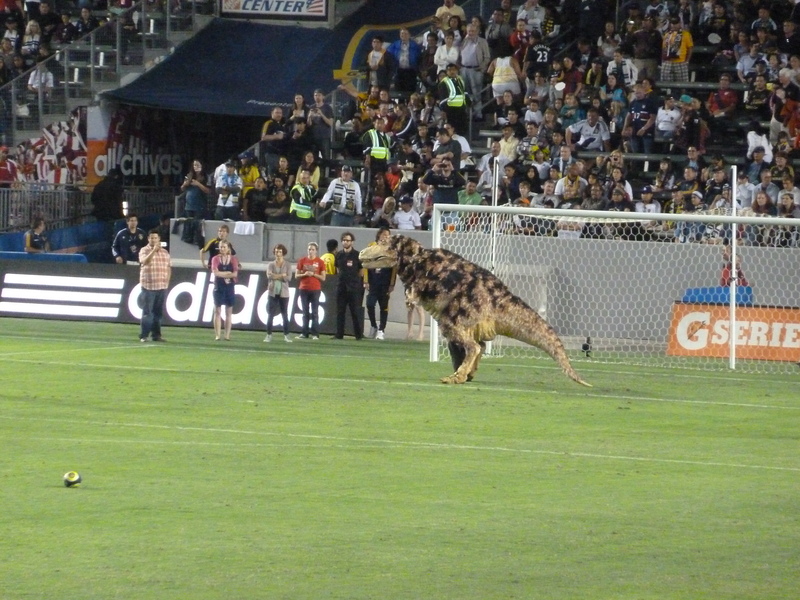 At half time, a dinosaur came onto the pitch (I know Beckham is getting old, but that’s not me being funny – it really was a dinosaur) and families had to shoot the ball past the dinosaur to win tickets to some theme park. Kiss cam came on the big screen, forcing some of California’s most hideous couples to smooch in front of thousands, and in the process making far too many people gag on their nachos. Then someone came out and launched t-shirts into the crowd. There was some kind of ‘lucky seat’ game that meant everyone had to search under their chair for a golden ticket. Then a row of people in front of me started jumping around after being chosen as the ‘lucky row’ to appear on screen and win something free (probably food related). In addition to all of that, while the game was going on, one section behind the goal was constantly making noise thanks to being orchestrated by a man in a pit with a loud speaker, along with much arm swinging, chanting and the odd rhythmic ‘dee-fense cha cha cha’, the sound of which just makes me baulk at the abuse of our national sport. Loudspeaker man. An idea for Blundell Park?! 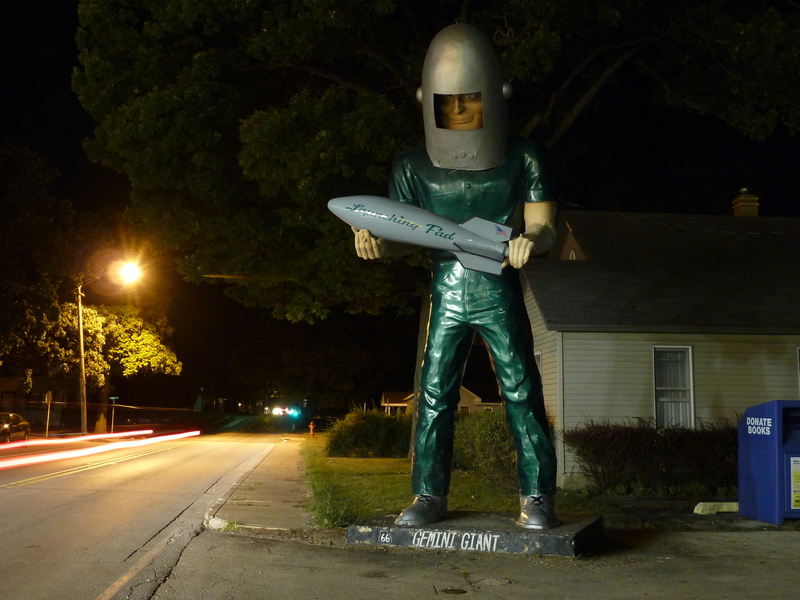 I did, however, see the reasoning behind the loudspeaker man – without him, the atmosphere would have been deathly. 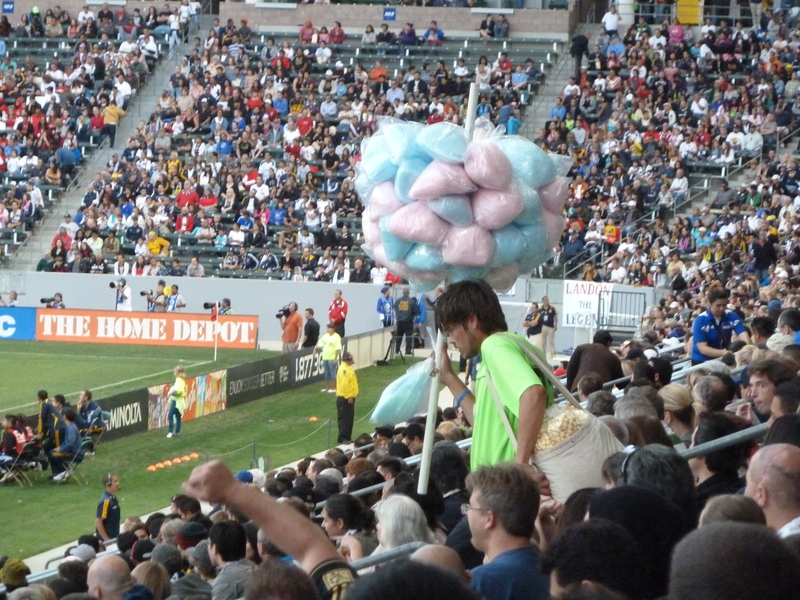 Even the family next to me admit that Americans simply don’t know how to behave at the ‘soccer’. They don’t know whether to just stay quiet and eat (which on the whole they do) or let their inhibitions go a bit and cheer for their team. Instead, they have many failed attempts at a Mexican wave, that old chestnut that was once common in the Eighties but probably hasn’t been seen at a football ground back home since, well, about the Eighties. Eventually they got it going, and I admit, I joined in. It wasn’t because I wanted to, or because there was peer pressure to join in with the Americans around me, who, by now, had embraced their English visitor who could explain all the rules and give stories of football across the pond. It was simply because it was something to do, and it took my mind off the banal game in front of me. It was either that, or buy something else to eat and drink. Perhaps we see part of the problem here. The Beckhamless Galaxy went behind in the first half thanks to a weak goal by their Philadelphia counterparts, before levelling in the second half with a goal that sent everyone wild in the stands. There was even blue and silver confetti launched from the top of the stand that fluttered down on everyone to mark the momentous occasion. 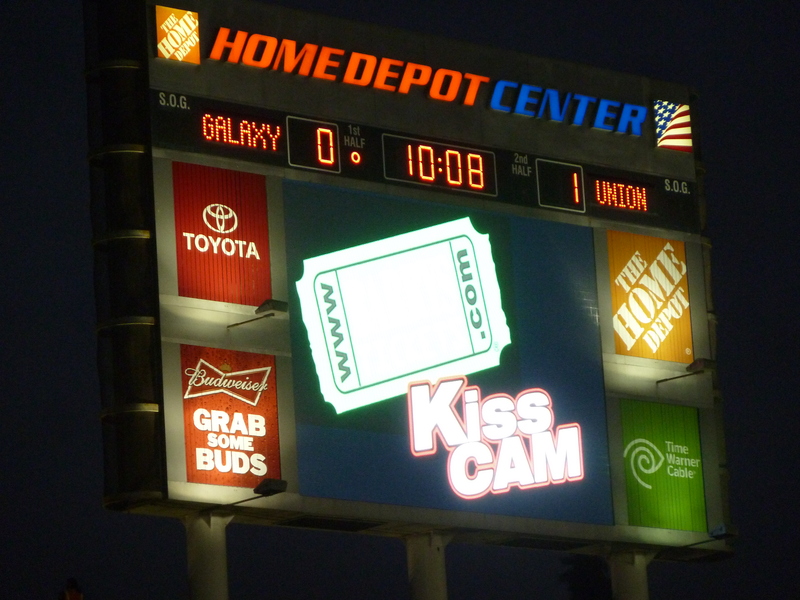 They went on to lose by conceding a stupid and sloppy injury time goal, which left everyone heading to the nearest burger stand for a final feed before taking their seats again to sing ‘God bless America’ and ‘Born in the USA’ en masse while thousands of dollars worth of fireworks went up in smoke above one of the stands. It would have been a great display if someone had worked out which way the wind – and therefore the smoke- was blowing and planned accordingly. Instead, after half an hour of obscured flashes and flames, everyone headed out to the car park and joined a queue for the interstate. I, meanwhile, headed back to the car with the knowledge it probably was, now, the last chance I will have to see Mr Beckham bend it on a pitch in person. I did see Frank Lampard and his missus in the ground, apparently meeting Becks to watch the game, but that was as close as I got to seeing a free kick expert in action on the night. 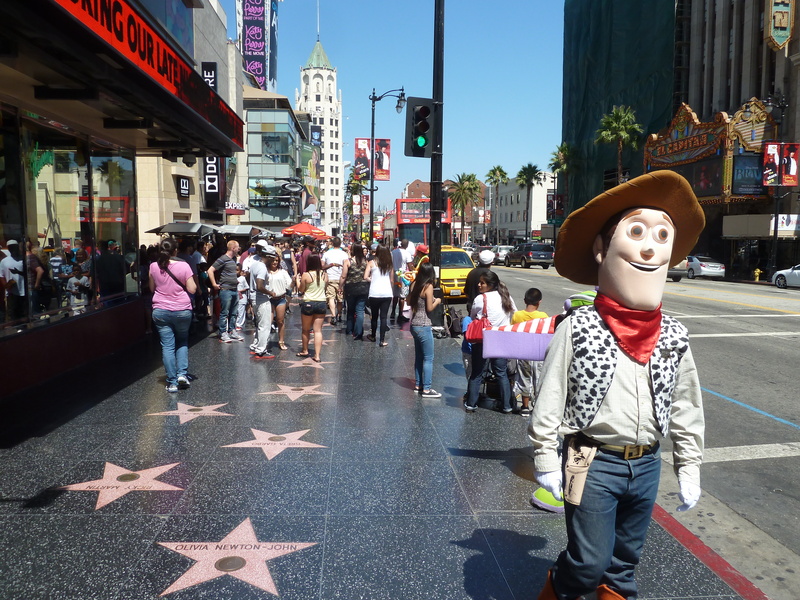 I had a couple of visits to Hollywood Boulevard during my time in this famous part of America, enjoying a couple of strolls along the Walk of Fame. It was no other than Journey’s star that was the first one I actually recognised along the strip amid all the past movie, music, radio and television personalities who have their fame recorded in the most permanent way with a red marble star in the sidewalk. The walk of fame is surprisingly long, a good 20 minute walk in each direction, and it can be good fun spotting the names you know, from Elton John to Britney Spears, Christina Aguilera to Arnold Schwarzenegger. 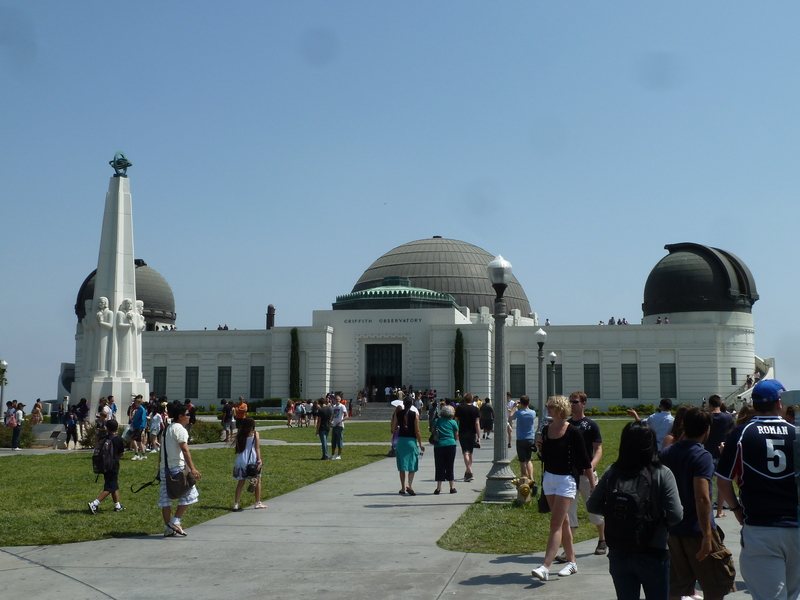 There were special stones for people like the crew of Apollo 11, including Neil Armstrong, who set foot on the moon for their special achievement, while the LA Dodgers and various industry partners get special mentions in the path for their help with promoting the area and the Oscars. 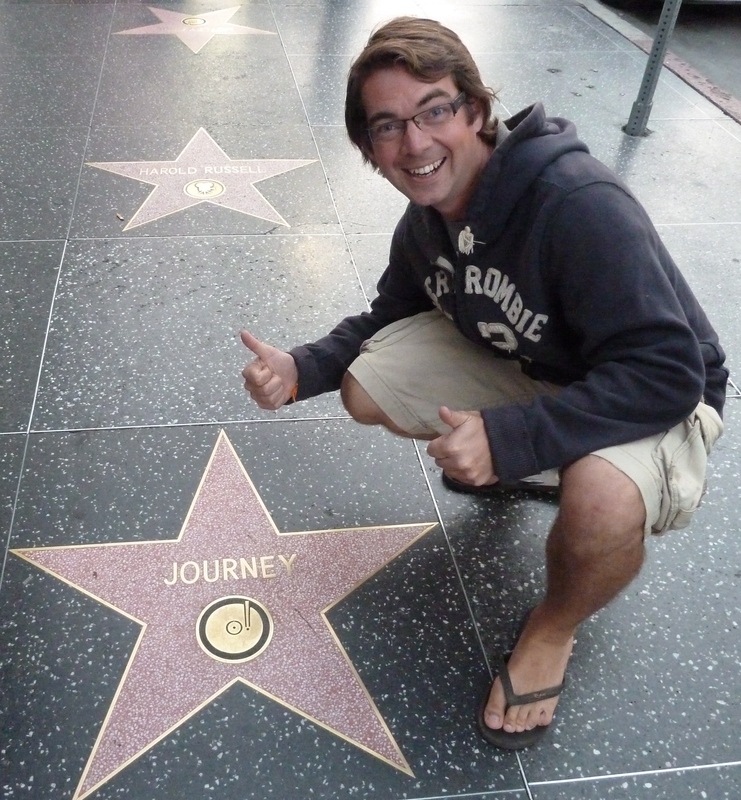 After spotting Journey’s star, I didn’t stop believing at Grauman’s Chinese Theatre, where I marvelled at how small some of the world’s most famous hands and feet are in the cement stones that make up the famous forecourt. 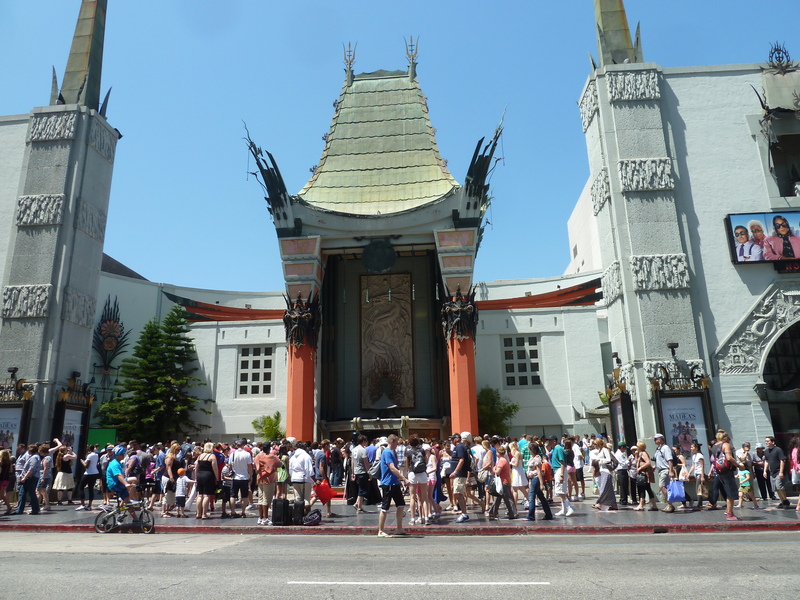 Grauman’s is known as one of the most famous movie theatres in the world, built by famous showman Sid Grauman who is seen as one of the key figures behind cinema. To have a hand and footprint taken here is often seen as a career highlight, even by the most famous of celebrities. 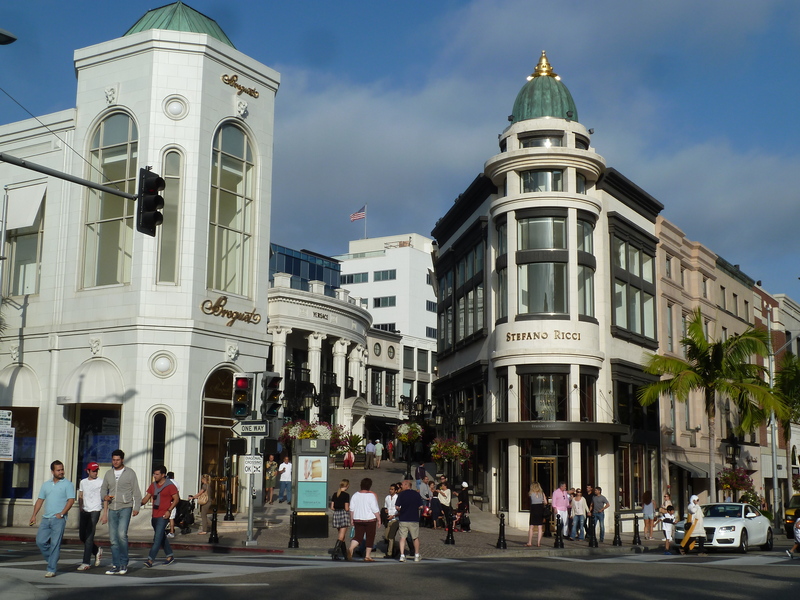 Apparently, there are two stories about how the tradition began: one has Mary Pickford as the actress who stepped in wet cement on her way to see the magnificent new building shortly after it had been finished, and the other credits Norma Talmadge with the misstep. Grauman decided it was a wonderful way to have a permanent record of the stars, and began inviting selected film personalities to put their hand and footprints in concrete. 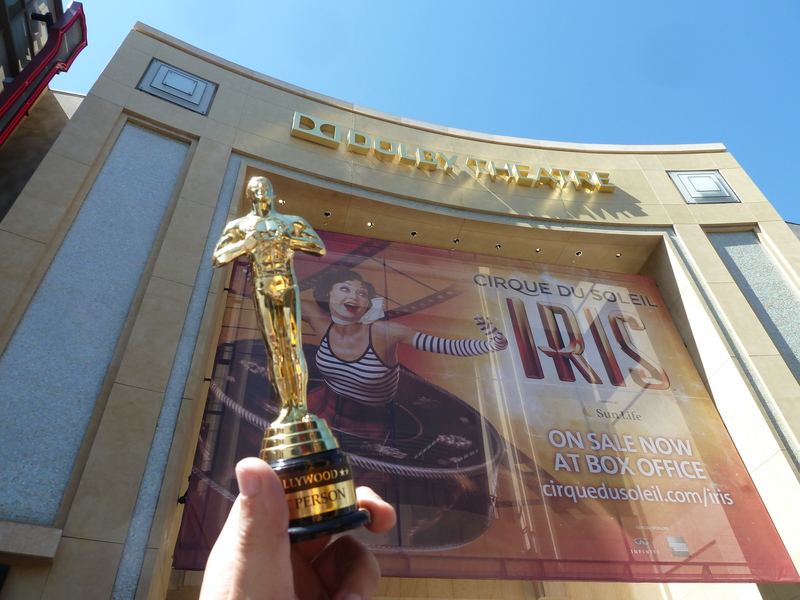 To this day, the world’s most famous people get on their hands and knees here to leave a lasting impression – and their films are often premiered in the theatre within. 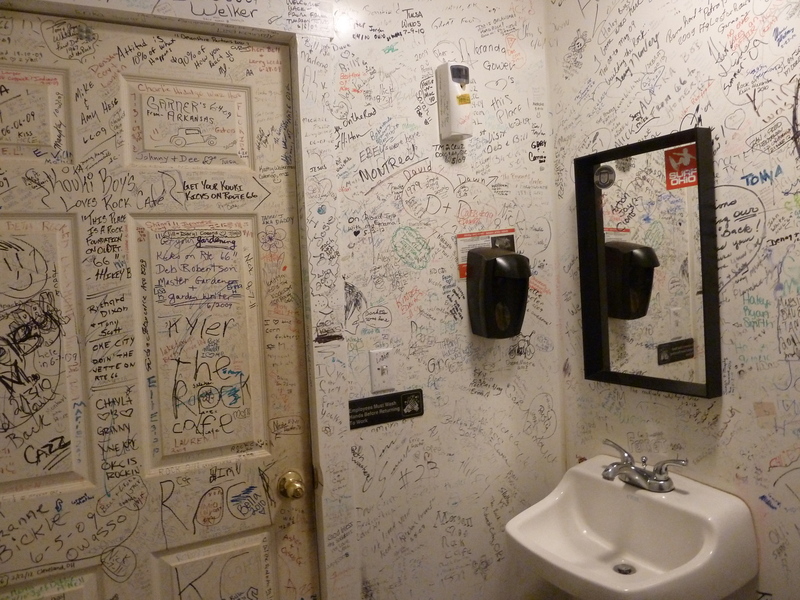 It was fascinating to wander around, braving the throngs of tourists and spotting the many famous names and messages. 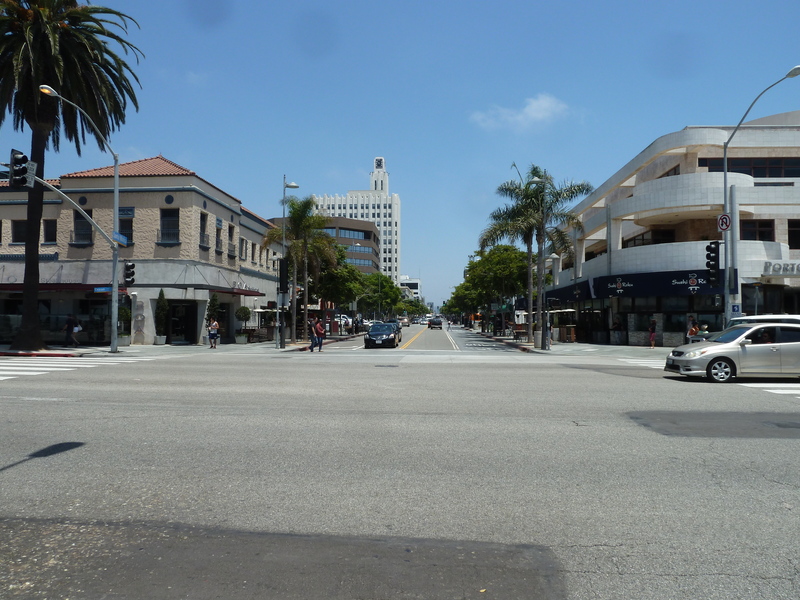 Amid more driving through Beverly Hills, I called in at the Apple store in Hollywood to finally sort out the long-running saga of my iPhone, which has not been right ever since it was unlocked by O2 back home and upgraded to iOS5 through iTunes. Regular visitors to my ramblings would no doubt have picked up my frustrations at carting my iPhone around the world with me, only for it to sit in my bag redundant most of the way after it either breaks down or locks up on me. Since inserting a New Zealand sim card in it, once again it had been rendered useless, somehow locking itself to Vodafone Australia despite being supplied with an unlocked device in Sydney. Having spent $40 on Skype credit with four separate calls to Apple support, who in turn pass me on to Vodafone, who in return send me an email three days later telling me it was an issue with Apple, who then send me back into this vicious circle by sending me back to Vodafone, I had grown sick of being passed from pillar to post. I walked in and for once their sickly smiles and warm welcoming style couldn’t cut through my frustration. I went straight for the top, asking to speak to a manager, which resulted in me getting an appointment straight away at the ‘Genius bar’. Where I was told they wouldn’t unlock it, there was nothing they could do, and it was an issue with my carrier. There was no way I was leaving until it was sorted out, and so I sat myself down and told them as much, fed up with Apple and the phone networks around the world constantly passing the buck. I dug my heals in. After being asked to explain the who sorry tale three times to three different people, eventually the manager was sent to speak to me. “I have explained the story so many times, I have a case number, can you not call Apple support and get the rundown of what has happened before finding me a solution to all these problems,” I asked. So not only can they not communicate with the networks they sell their phones to, they can’t even talk to sections of their own company. “This was a phone issued in Australia, we can only change phones issued in the States,” came another little gem, that only served to raise my frustrations. “So, effectively, you can’t travel anywhere with an iPhone because if you get problems, you can’t get help, and the networks around the world lock your phone even it its unlocked,” I said. It was a ridiculous situation, and an area that really needs highlighting. Iphones, as great as they are – simply the best bit of kit around if I’m honest for ease of use and capability – have one major flaw. Once you put another sim card in, it will lock to that network. You then have to faff around getting it unlocked again, only for it to lock to the next network you put a sim in from. And when you need help from Apple, because it is officially a carrier issue, it can be like getting blood from a stone, constantly being batted away back to whoever supplied the sim card. Not a bad area to be stuck in an Apple store! This time, however, I wasn’t going anywhere, and they knew it. I was eventually given a phone to call customer support on, while sat inside an Apple story, because the different members of staff couldn’t possibly talk to one another. And there I sat, for the next hour and a half, to some engineer somewhere in America who looked into all of my accounts, replacements and problems over the past few years. “As well as Vodafone Australia, your handset is locked to a network in Korea,” I was told. “The serial number on your account is for a handset from Korea. 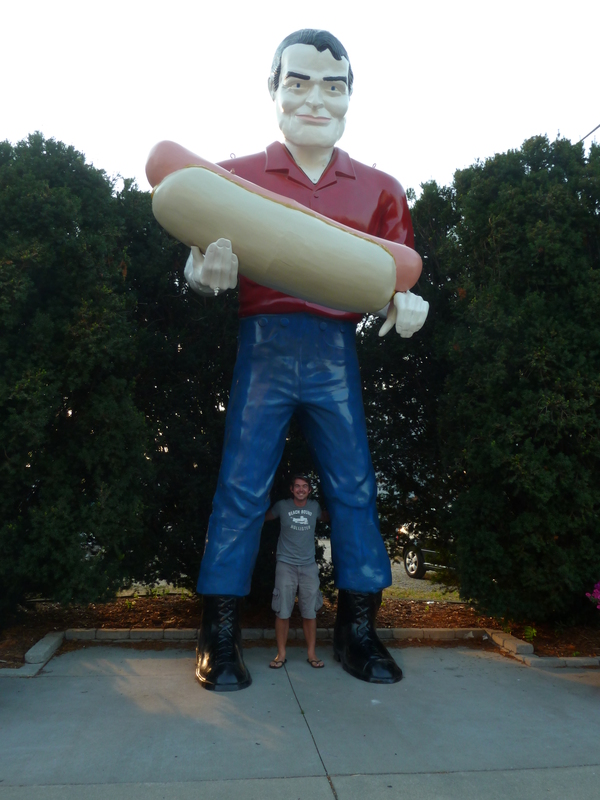 Have you had one from there?” I was asked. While I had visited Seoul for an hour between flights in November, there wasn’t enough time to have a drink, let alone buy a new phone. I repeated my serial number three times to make sure. Somehow, in Meadowhall, one digit went down wrong. Instead of my phone, it registered as a complete stranger’s handset in Korea. And since that day, their phone has been unlocked on numerous occasions by networks on my behalf, while being accused by me of not carrying out the procedure. It turns out they were, but not on my handset. I relayed this to the staff around the Genius bar, who a couple of hours ago had adopted the ‘its your fault, your problem, deal with it,’ mentality in trying to get me out of the shop. Suddenly they had all changed their tune, and to be fair to the manager, he couldn’t apologise enough, even giving me a new pair of headphones for free. So now, with one solitary digit being amended on my records, hopefully that will be the end of this long running saga that has driven me mad. Its just a shame that for the majority of this trip, I have been without my music, maps, phone, emails on the go, Facebook and Twitter in my hand, and everything else that helps while on the move thanks to the clever little touches incorporated into the handset. And Apple will be getting a strongly worded letter, complete with a claim for international phone calls and three new (cheapo) handsets I have had to buy in various countries just so I can make calls. Relieved that I seemed to have finally got a result, I went for a pootle along Rodeo Drive, the shopping district of the stars, along Hollywood Boulevard to take in one last dose of the Tinseltown atmosphere, and smiling at how normal it felt to be cruising around one of the most incredibly rich and famous areas in the world. 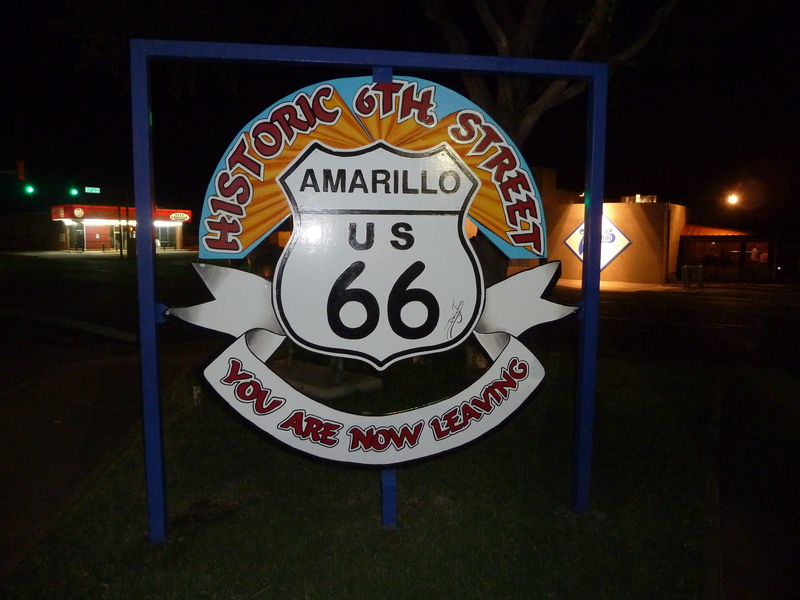 But it was time to move on – I have the road trip of all road trips to begin, and it was time to get my kicks on Route 66.